Summer is not over, and there are still new surprises in Lambert Park! 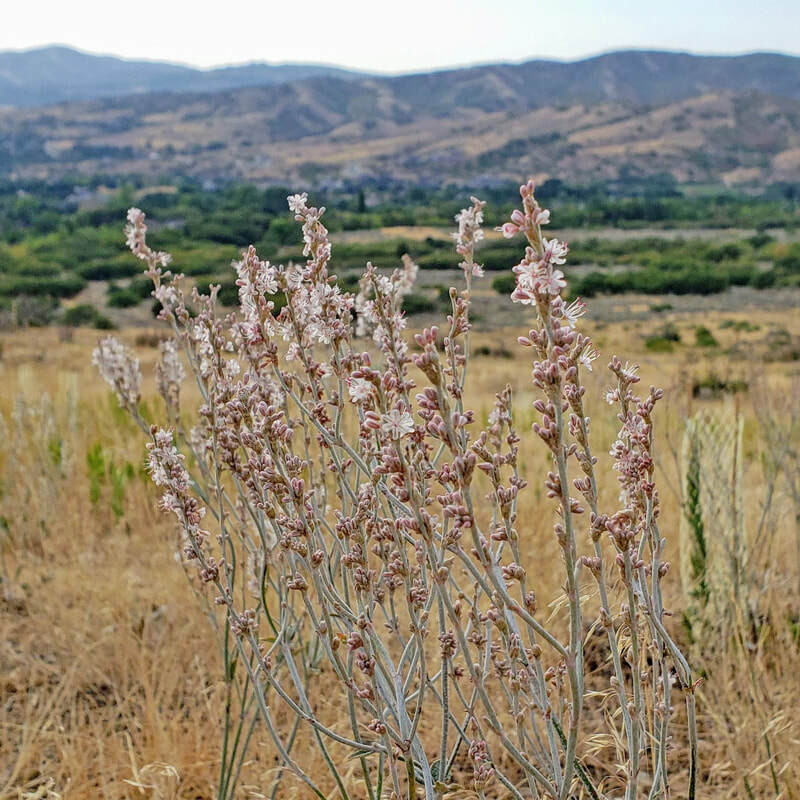 The Redroot Buckwheat is in full bloom! 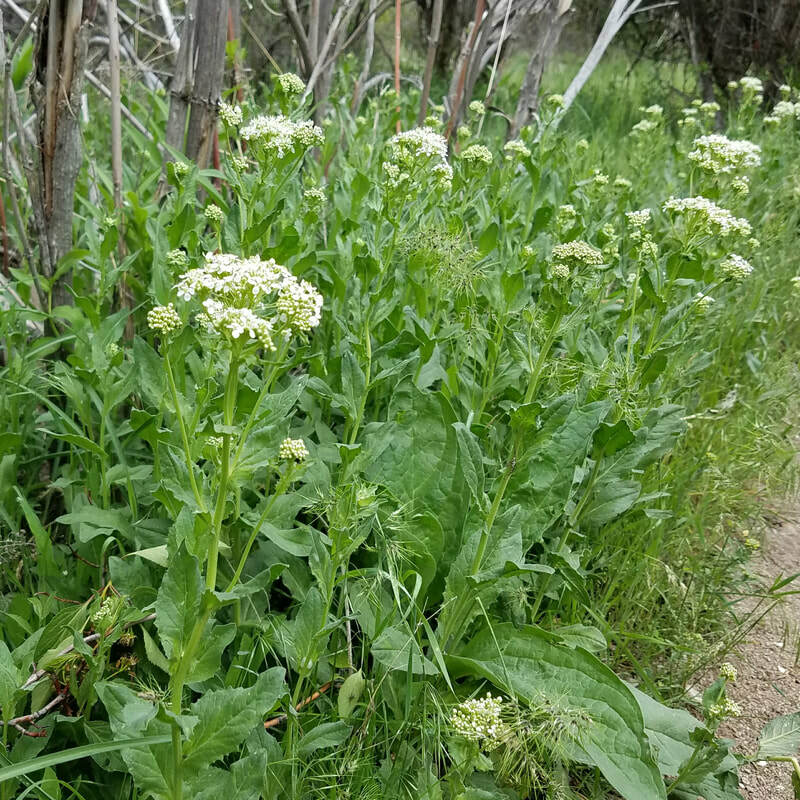 It is growing in abundance along Brown Dog trail next to the upper seedling plantings! 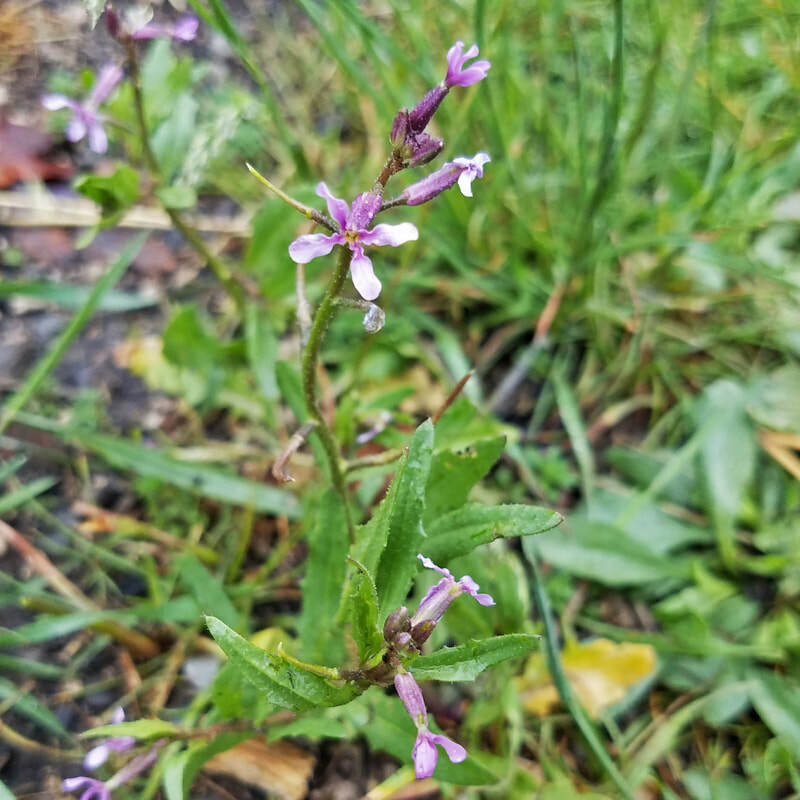 This beautiful plant starts out as spindly sage-green stems that finally burst into flower, starting white, and then turning a soft pink! 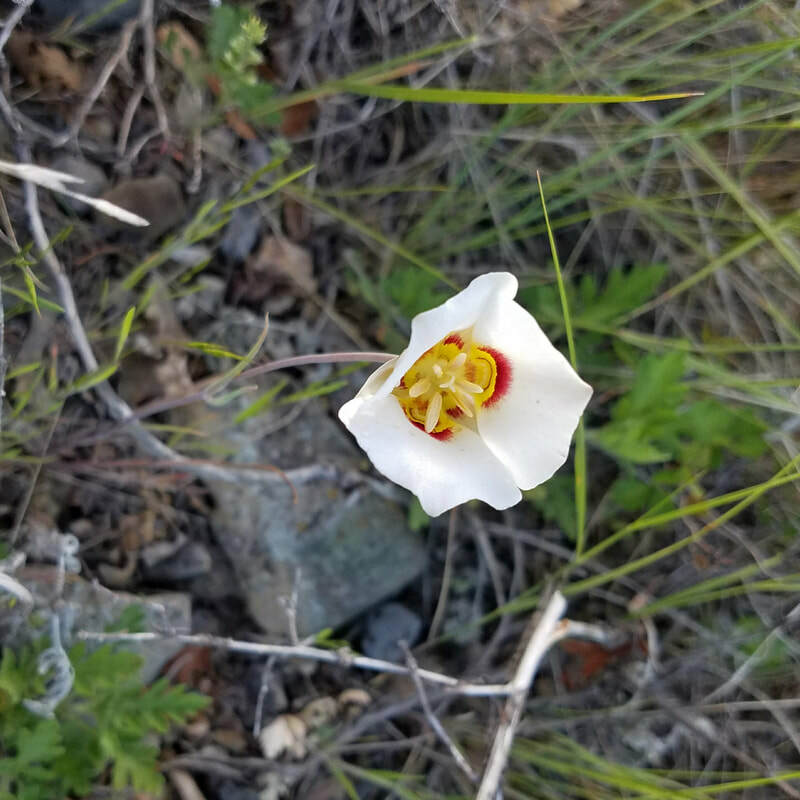 This unique late bloomer is native to Utah, Colorado, Arizona, Nevada and New Mexico. Its roots were used to treat poisoning and diarrhea by the Navajo. It is also is a food plant for the Spalding Dotted-Blue butterfly as well as the Desert Green or Comstock's Hairstreak butterfly. The colorful red berries of the Rocky Mountain Ash add a splash of late summer color in the trees by the creek at the Horsetail Falls trailhead! Don't be fooled by the name! This tree is in the rose family, and not at all related to the ash tree. 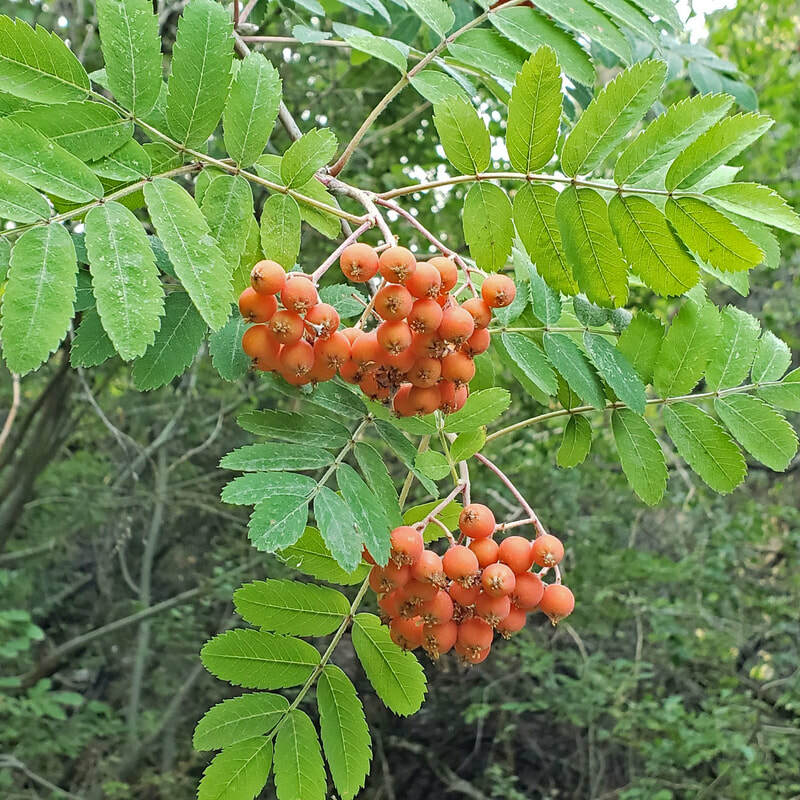 It is also named Greene's Mountain Ash and Cascade Mountain Ash! Everyone wants to claim it! Dogberry jams and jellies can be made from mountain-ash fruit, a confection usually mixed with ginger and apples to add flavor to the rather bland fruit of these very pretty trees. There is at least one European Crab Apple in Lambert Park. This tree is not native to North America, but thrives in the right environment. There is one right along Grove Creek next to one of the bridges on Rodeo Down! 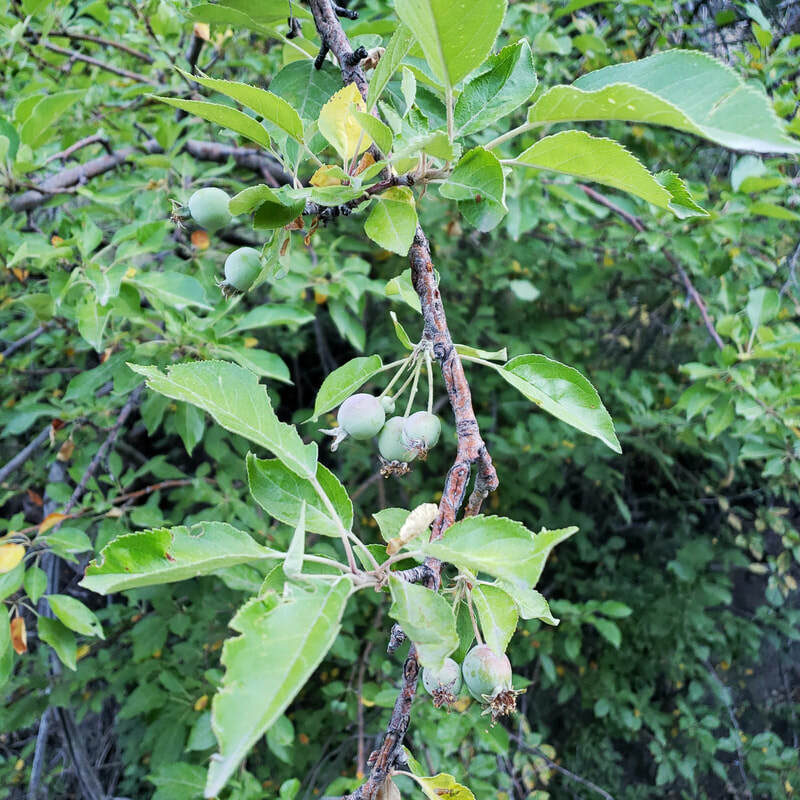 The mountain bikers might fly right by it, but if you're on foot, you might want to taste a crab apple when they ripen in a few weeks! This week we feature the good, the bad, and the ugly! 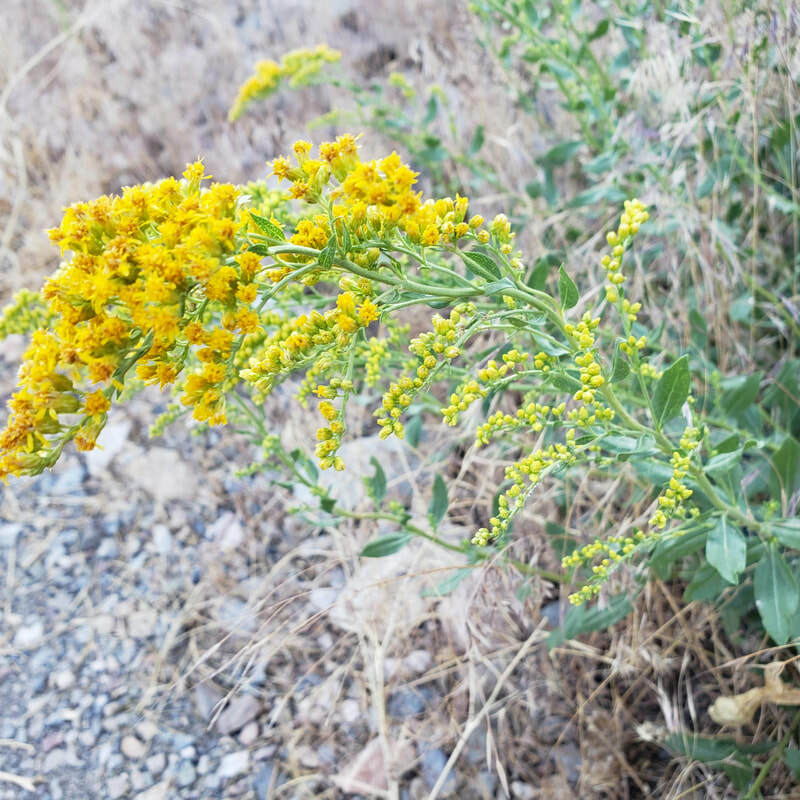 We have two types of Goldenrod, both of them native to the western United States. 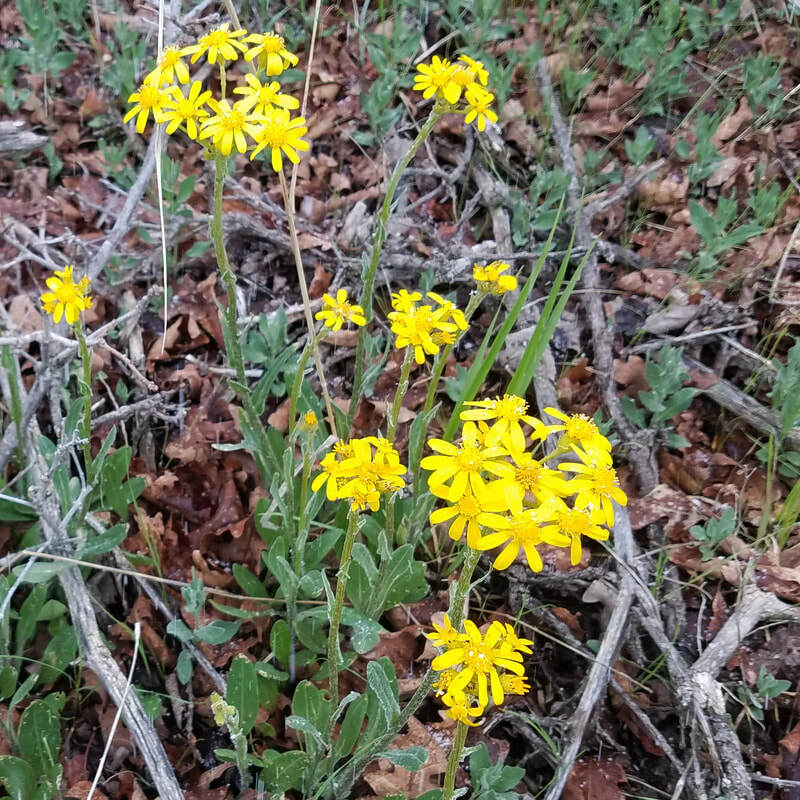 The velvety goldenrod is a bright splash of color found on the top of Spring trail, as well as Dog Crossing road and other areas. 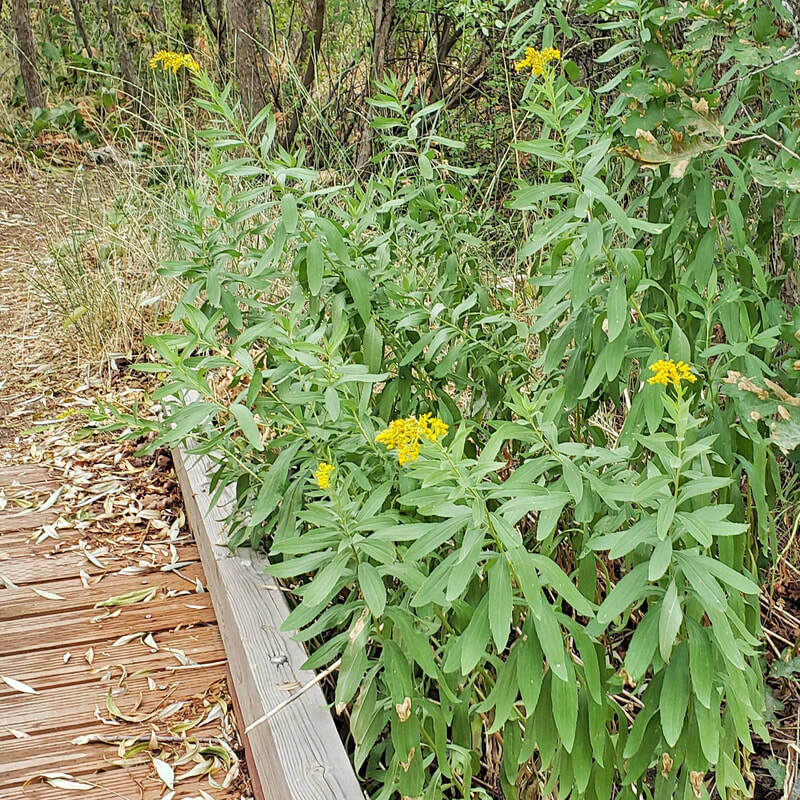 The Canada goldenrod is much taller and is thriving along a bridge on the lower part of Rodeo Up trail. The bad and the ugly are Russian Thistle and ragweed. The Russian Thistle is an invader brought to the United States about 1873 by Ukrainian immigrants to South Dakota. It was accidentally introduced as a contaminant in flax seeds and quickly spread throughout the west. Although it is generally not beneficial to livestock, it was credited for saving cattle during the Great Depression. It is the inspiration behind the great cowboy song, Tumbling Tumbleweeds, which you can hear by clicking this link! 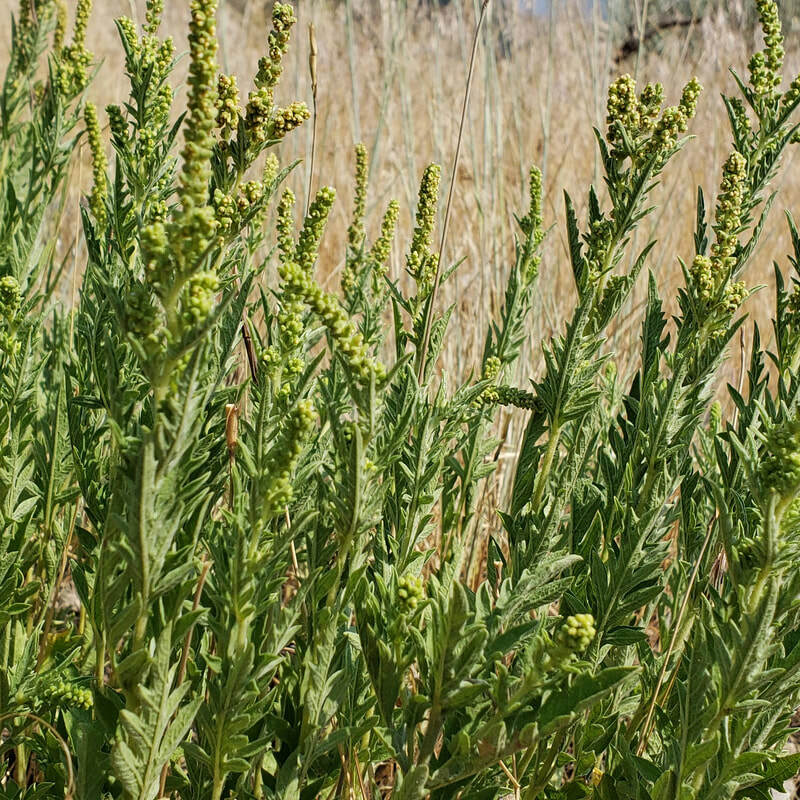 ​The Western Ragweed is flowering and will soon release billions of pollen spores into the air, peaking around Labor Day. This is one of the major banes of 10 to 20 percent of the population that sufferers from allergies. This plant is native to North America, and we in turn have shared it with the rest of the world! It is now naturalized in parts of Europe, Asia, Australia, and South America. 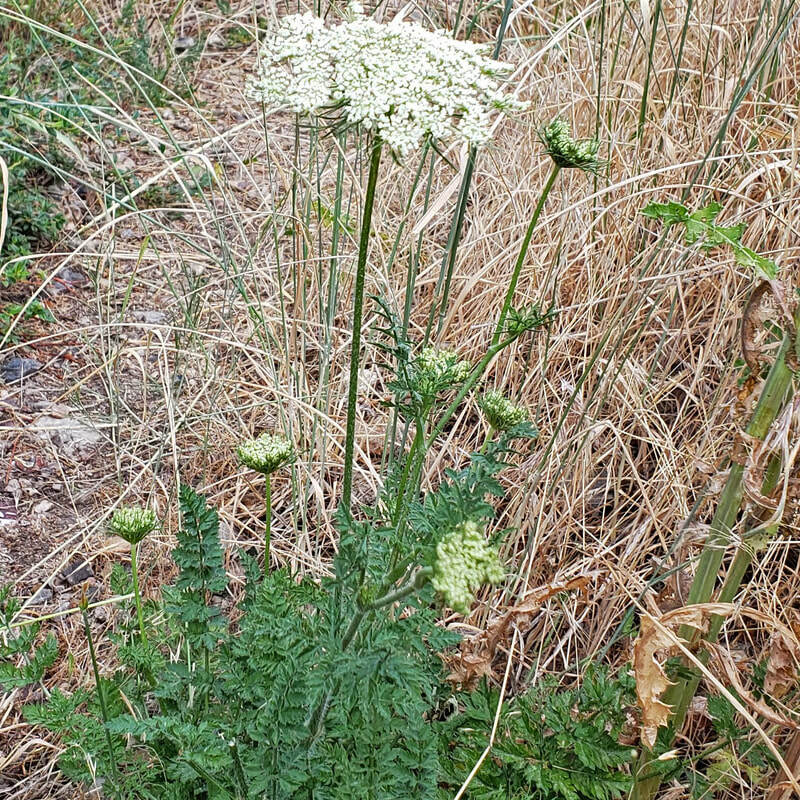 The Wild Carrot is in bloom! Don't think about eating it, however, as the root is woody and bitter. One of its other common names is Queen Anne's Lace. 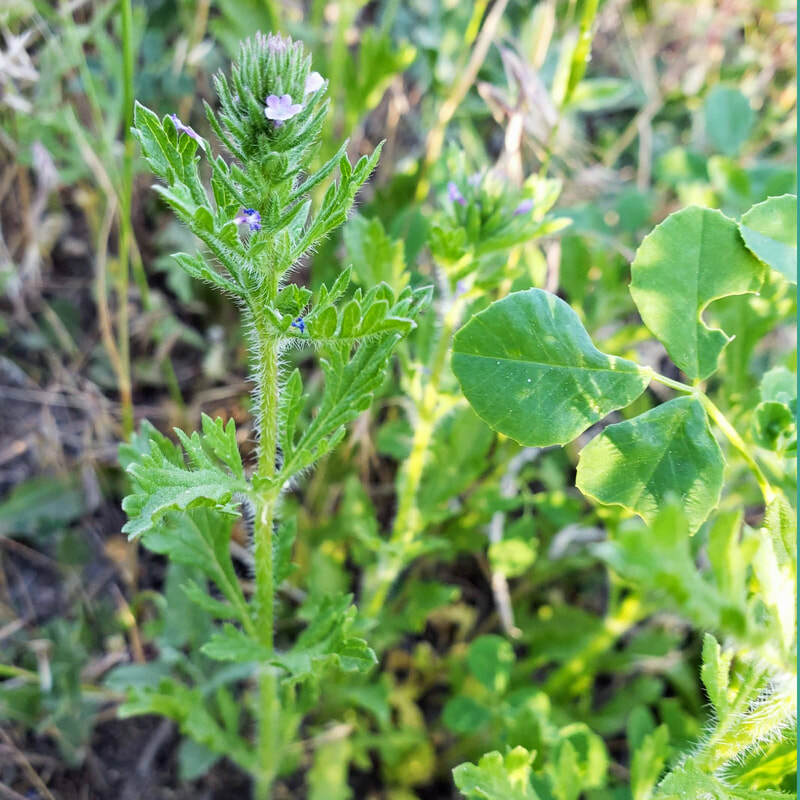 This pretty import from Eurasia has been considered beneficial when grown next to other crops, and has also been classified as a noxious weed in some states. In either case, it is very similar to the deadly hemlock parsley, so it's just as well to avoid eating it! 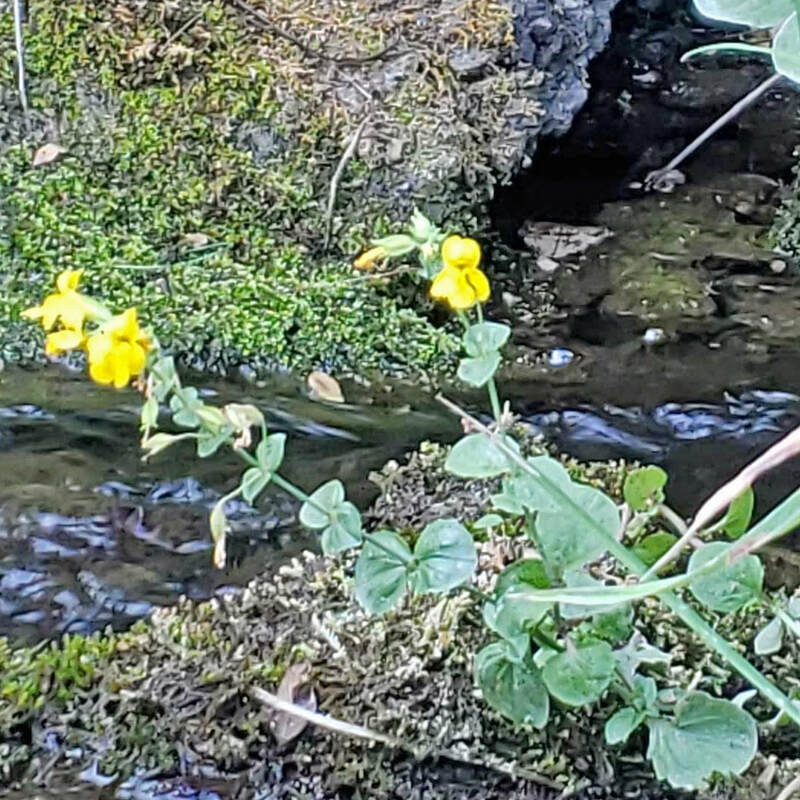 If you go up to the top of Spring trail, you'll be treated to the Yellow Monkeyflower in bloom right in the middle of the Stream. 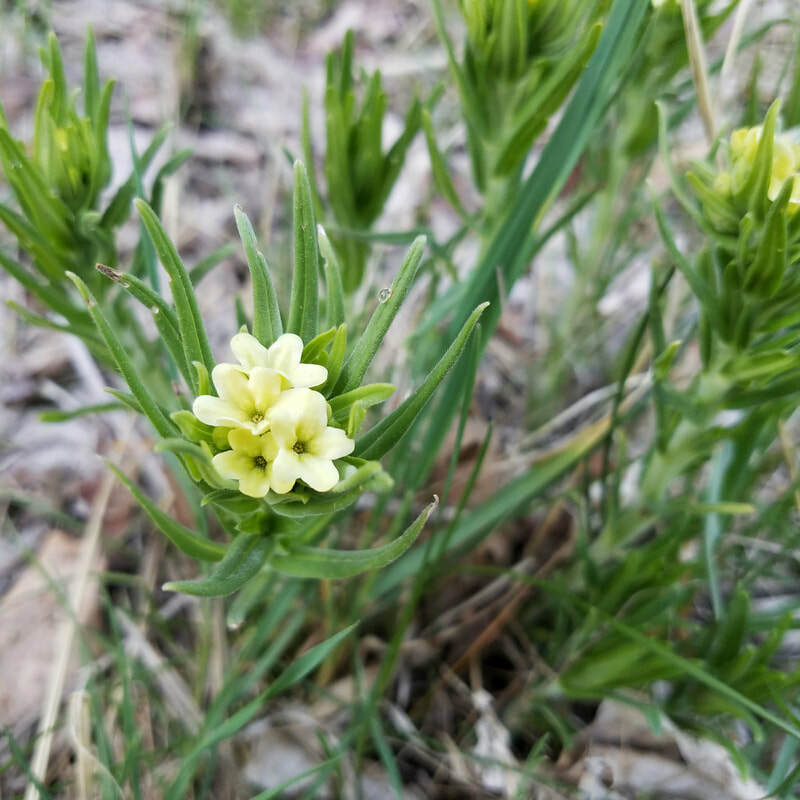 These flowers are native to western North America and are generally found along or in stream beds! 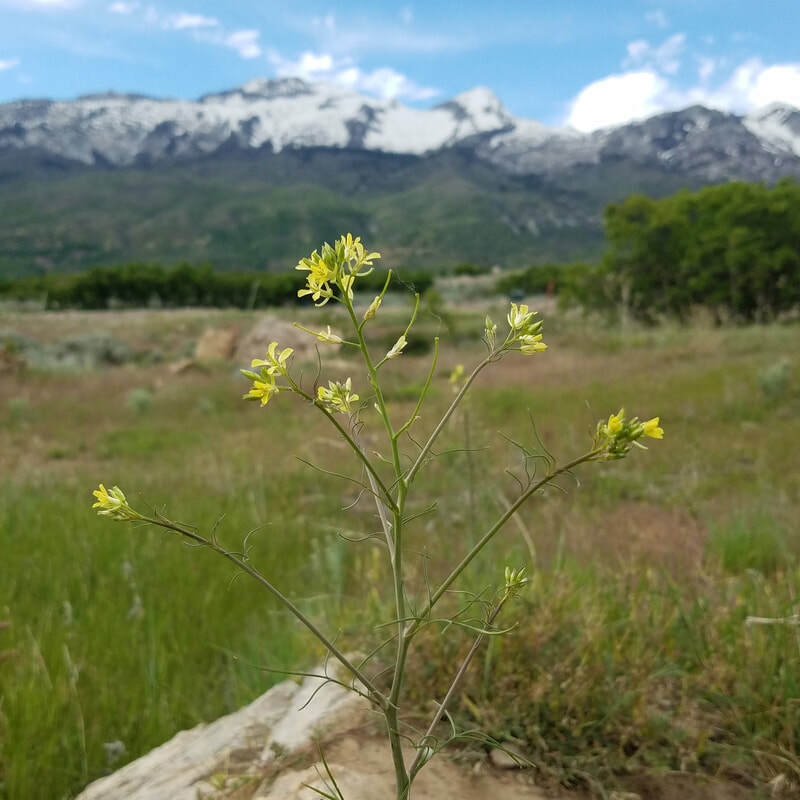 We are fortunate to have a few monkey flowers along Grove Creek, and for those who don't mind a steeper hike, a number of them are at the diversion in Box Elder Canyon! Is there anything more beautiful than an amber wave of grain? When it looks like classic wheat in Lambert Park, it is probably Rye, which is very similar! When you catch it in the morning with the light reflecting on the field it is especially spectacular! Wild Oats are identifiable by the many nodding spikelets on the stem. 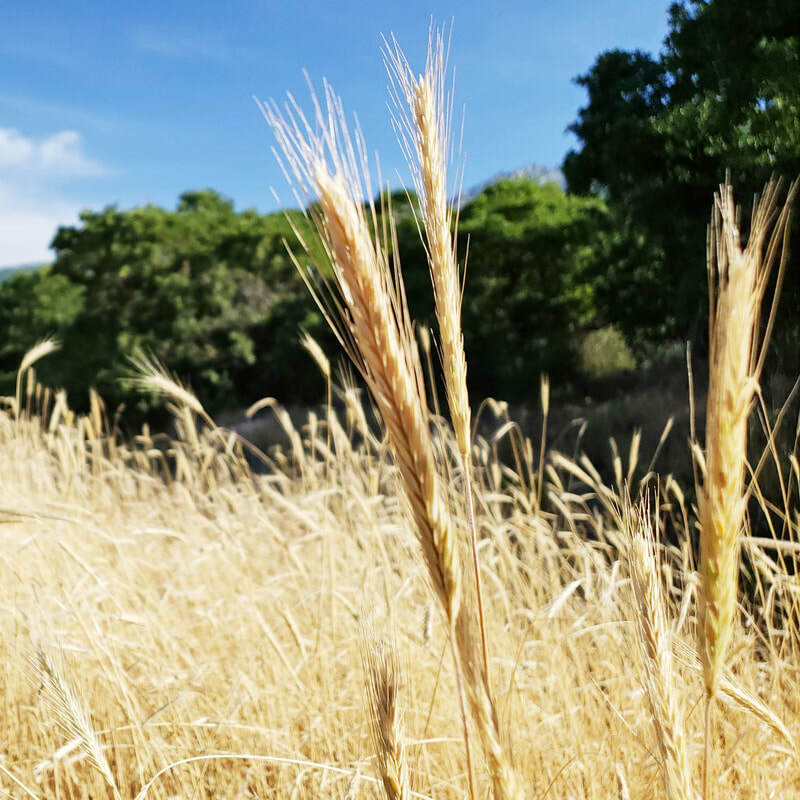 They are native to Eurasia and can be an invasive problem in wheat fields, as they lower the crop yield. Here they merely add to the beauty and diversity of grasses growing in Lambert Park! 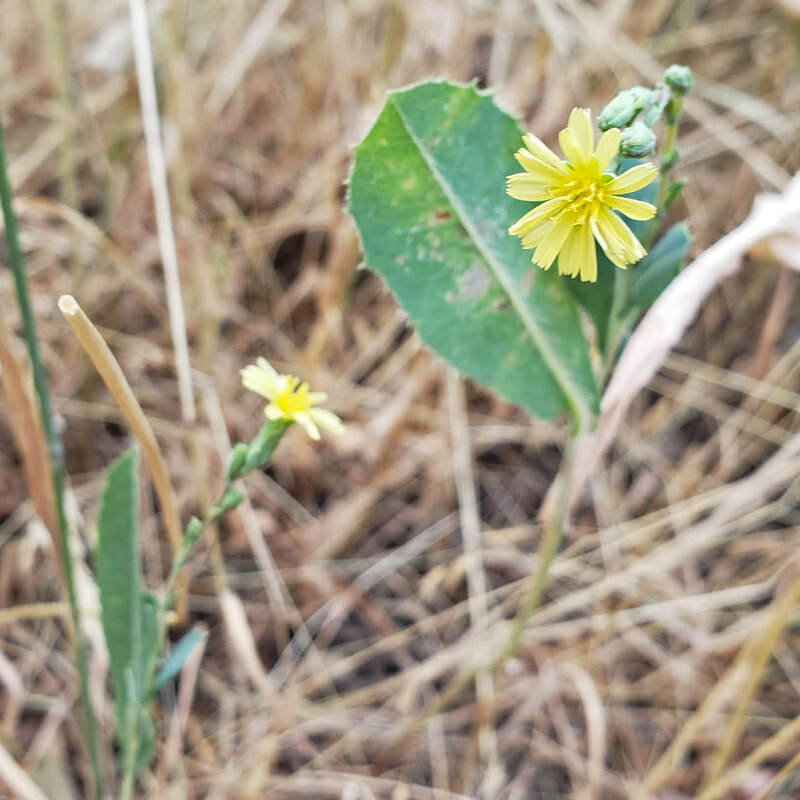 Prickly Lettuce is a native of Eurasia that has been naturalized around the world. It is a close relative of garden lettuce and can be eaten, despite the fact that it is somewhat bitter (and prickly). It has been used medicinally over the years, including as a sedative! A remnant from Alpine's orchards, the Pear Tree along High Bench is doing very well this year. The lack of a late frost has been beneficial to all the fruit and berries in Lambert Park! This beloved European native is best when picked just as the fruit matures and before it is fully ripe to prevent bruising. Deer might not be so picky! Do they eat your pears before you can pick them? There is a patch of Catnip right on the border of the Bowery parking lot! This native of Eurasia is planted as an ornamental in gardens, and is not only deer-resistant, but also can be a repellent for certain insects, including aphids and squash bugs. It contains a strong feline attractant, nepetalactone, that will send your cats rolling, pawing and frisking! Just when you think it is too hot and dry for flowers in the park, new drought tolerant flowers start popping up! 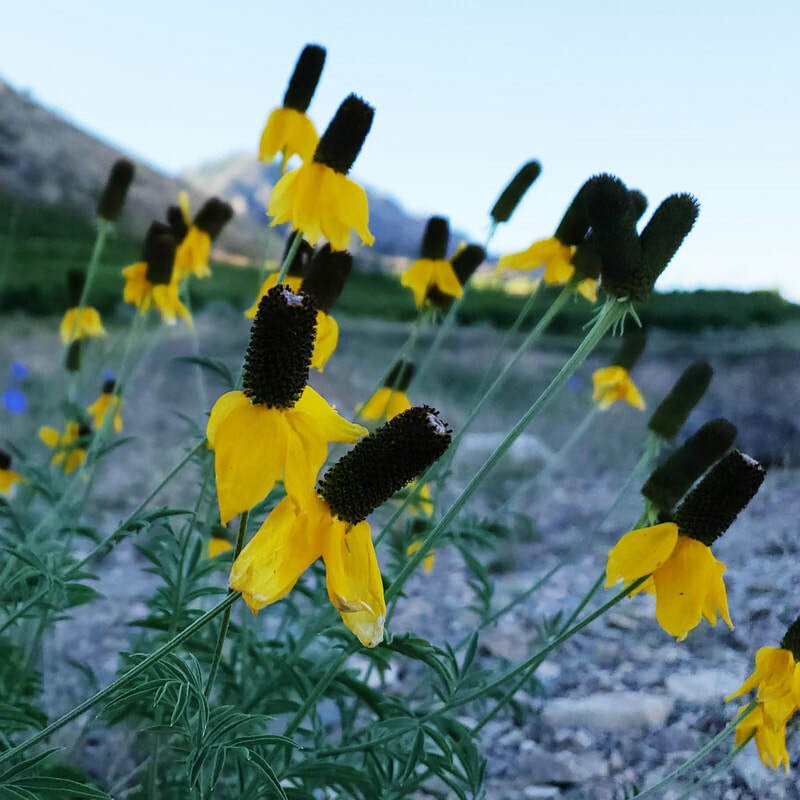 The Prairie Coneflower looks somewhat like a sombrero and is also called Messianic hat! It is a native to North America that does well despite our often dry conditions! The Common Sunflower originated in North American and was taken back to Europe by early explorers. In addition to it's colorful beauty, it was prized for its oil as well as its seeds! 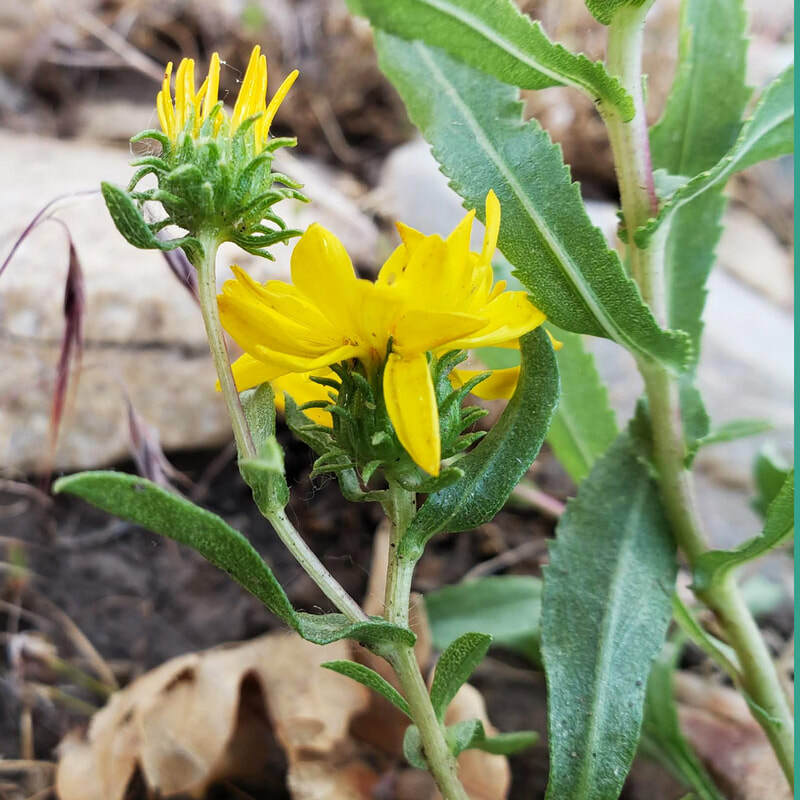 Hairy Golden Aster thrives in the foothills and mountains, as well as vacant lots, farmyards and along roadsides. It also thrives in Lambert Park! It needs little water and can bloom for three or four months! To add to its allure, it also has a marvelous spicy-sharp aroma! 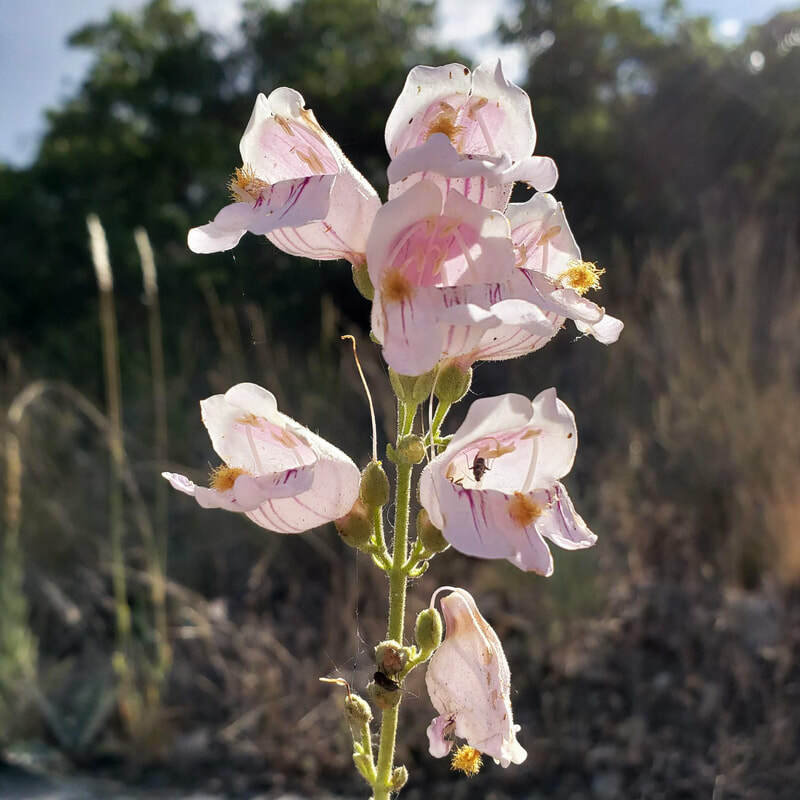 Palmer's Penstemon is another drought tolerant plant that does well in the west. It is a showy pink flower with five petals, two on the top and three on the bottom (like big lips). It is notable among penstemons for being one of the few in the family to be scented! Take a whiff! Rattlesnake Brome is a benign relative of the detested cheatgrass (bromus tectorum). It is a native of central and western Asia and has been cultivated chiefly for ornamental purposes. It's pretty drooping heads resemble the tail of a tiny rattlesnake! It's Chicory time! 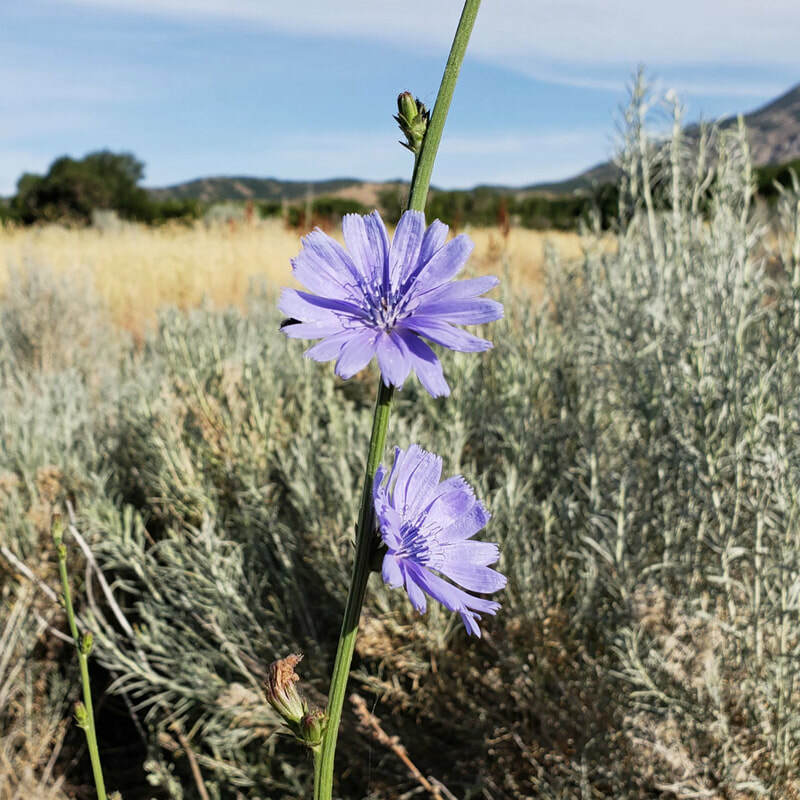 The roadsides are lined with this beautiful blue bloom, and the park has a large number of chicory growing in it, as well! It is a European native plant that is welcome here, and is even used for forage for livestock! There is a stand of St. Lucie Cherries growing just west (downhill) of the south water tower in Lambert Park. They are also known as Rock or Mahleb Cherries. They are ornamental natives from Europe, Asia and Africa that are cultivated for a spice obtained from the cherry pits. Birds especially love the fruit and are big seed dispersers! 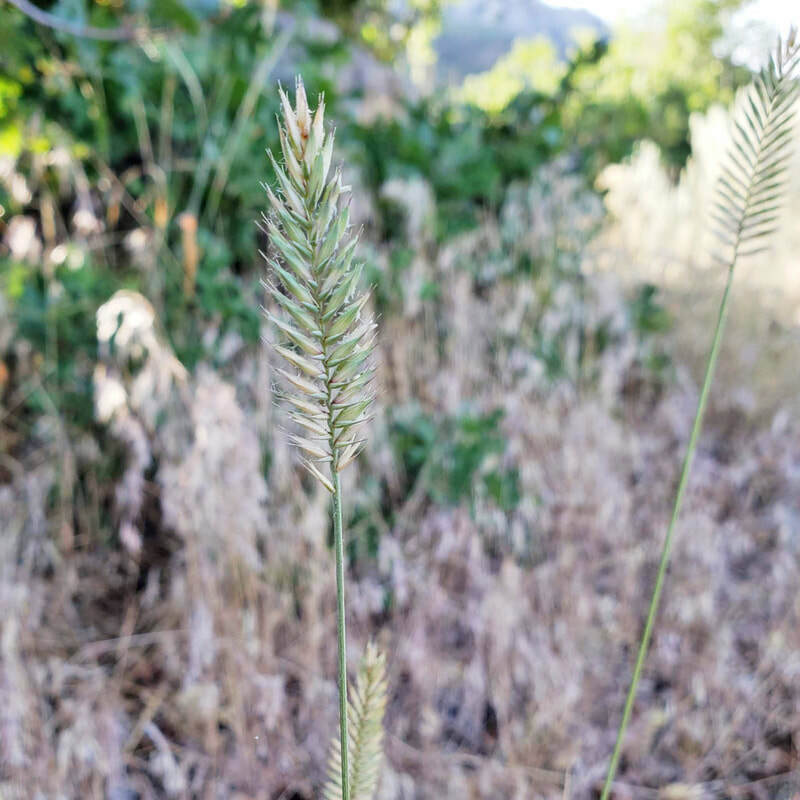 There are so many mature grasses in Lambert Park now! While many of them may be difficult to identify, the Crested Wheatgrass stands out with its unique shape. 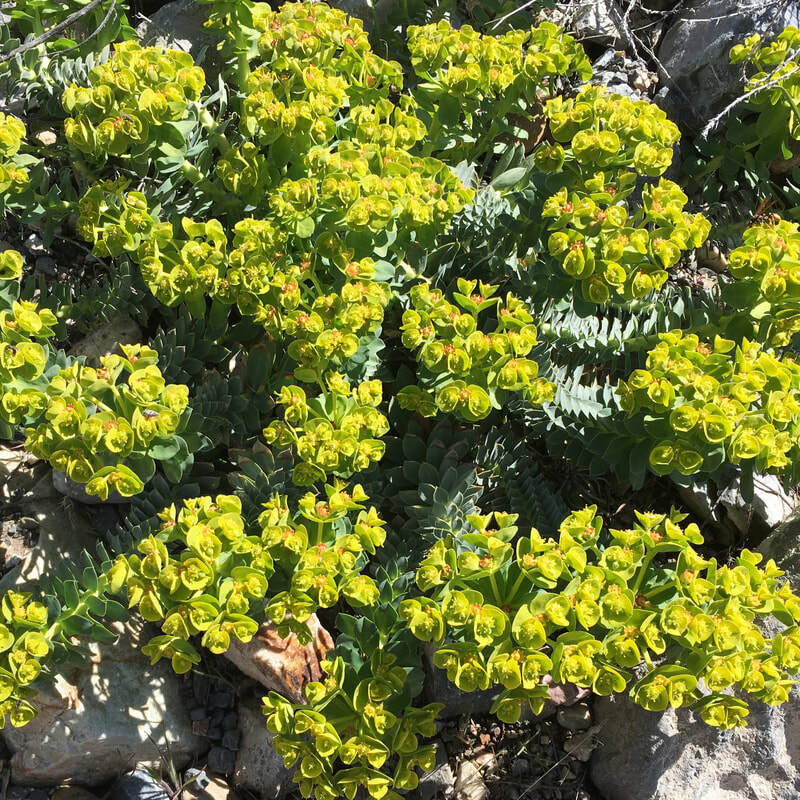 This plant was introduced from Russia has become a valuable asset in the Great Basin, providing food and cover for wildlife and livestock. It is often introduced into burn areas to control erosion! 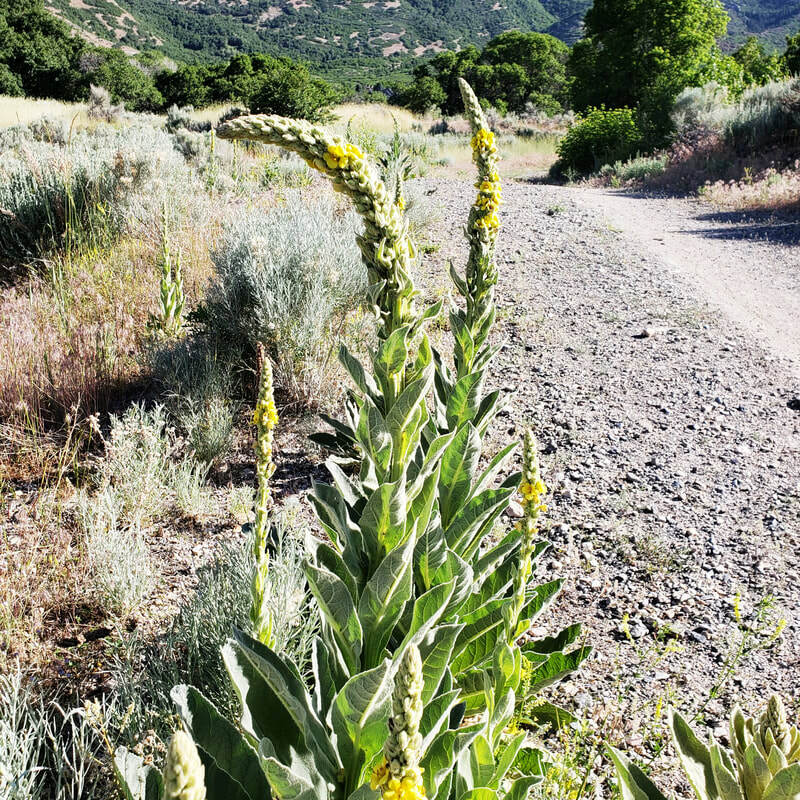 Wand Mullein is a cousin of Common Mullein, but doesn't look as much like a fire poker! It is long and tall with a few blooms at the top. Like its relative, it has a beautiful yellow flower at the top. It is not nearly as plentiful in Lambert Park as its common cousin, but is found specifically at the top of the Rodeo path and around the perimeter of the arena. 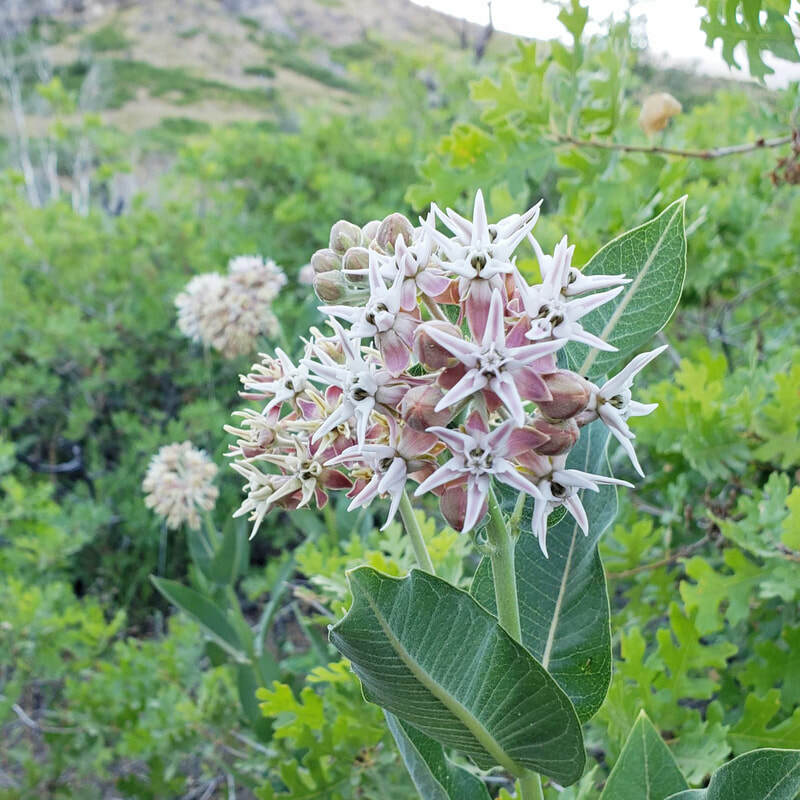 Showy Milkweed is just that--showy! It's blooms don't last long, but are beautifully star-shaped and eye-catching! It is a native plant with thick stems, which the Native Americans used in basketry and rope. It is toxic to humans and livestock, but not to Monarch butterflies, who especially love it's nectar and protection. The nectar makes the butterflies taste bad to other animals, and the plant provides a host for butterfly eggs and larva. Another beautiful bloom is the Showy Goldeneye! 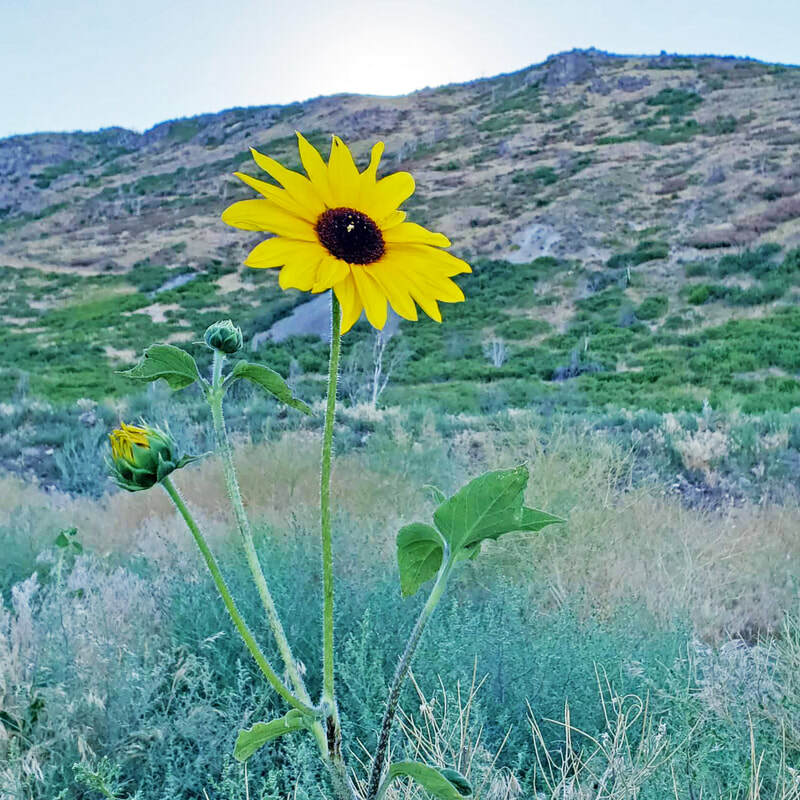 This colorful plant in the sunflower family will bloom for many weeks. 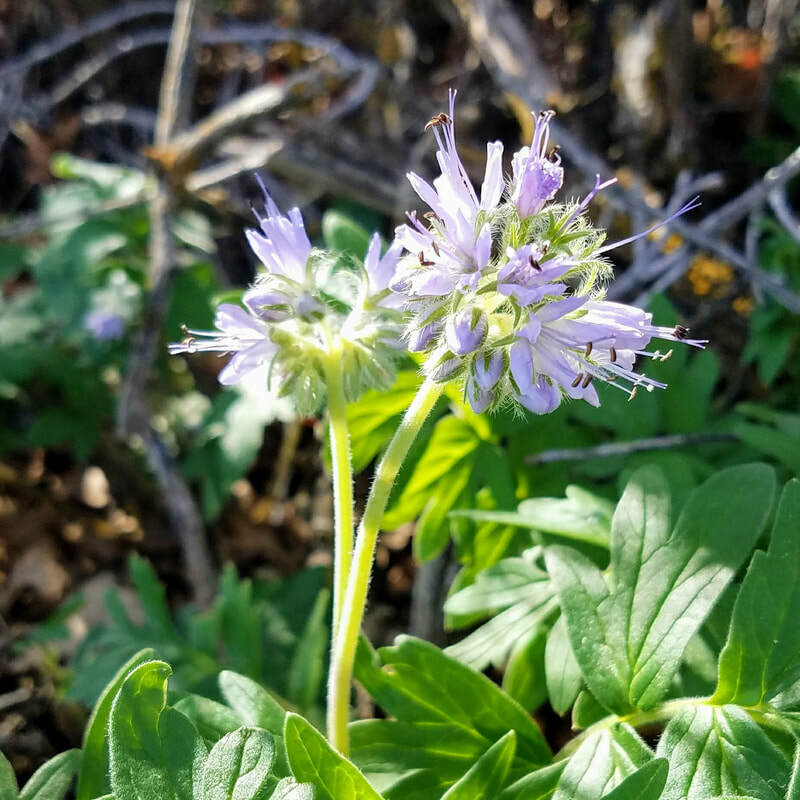 It tends to grow in thick clusters and provides eye-popping color along roadsides and in Lambert Park, as well! The trees in Lambert park are all in different stages! It is exciting watching them change as the season progresses! The Russian Olive is just finishing up its flowering stage. 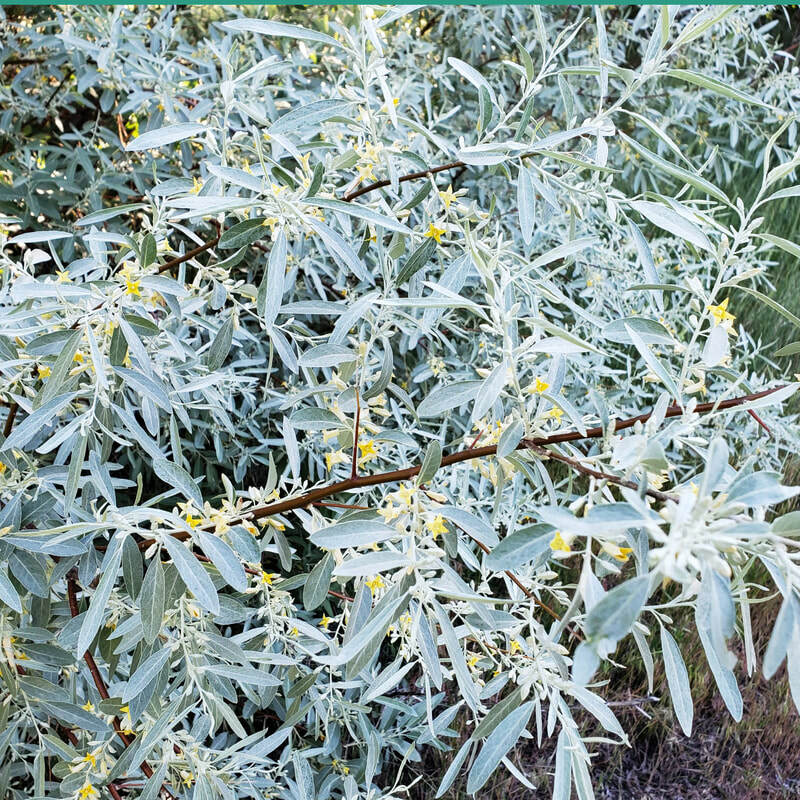 The delicate yellow flowers interspersed with the sage-colored leaves provide a soft touch to our roadsides in Utah. There is a pretty specimen here in Lambert Park on the road paralleling High Bench Trail. It spreads so easily in our climate that its planting has been discouraged. The fruit (not a real olive) is edible, but not particularly tasty! 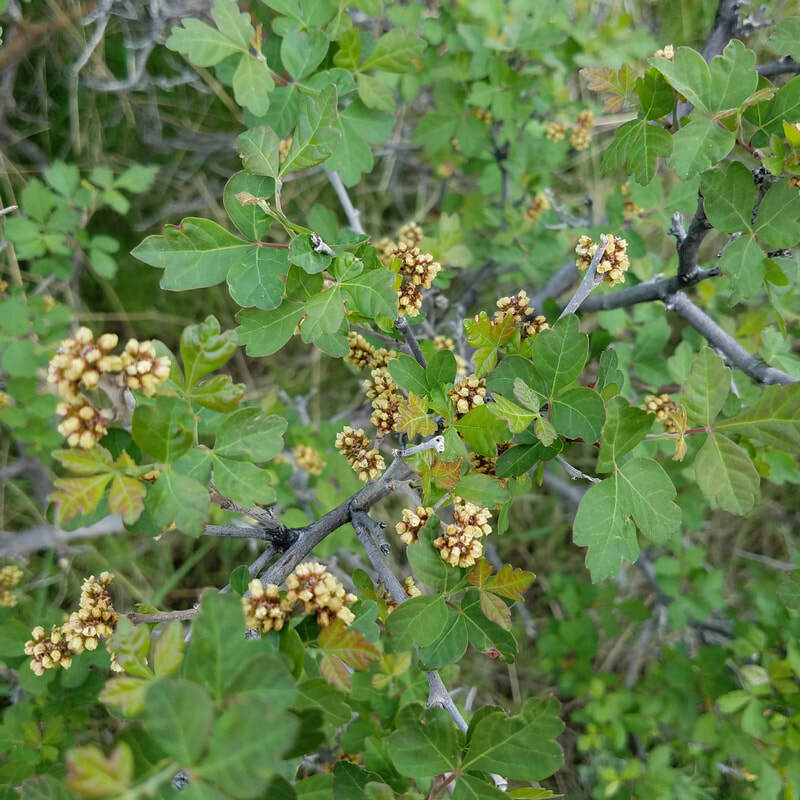 The Black Hawthorn is plentiful along Rodeo Down and the north side of High Bench trails. Beware of the "thorn." It is 1 1/2 inches long and very sharp! 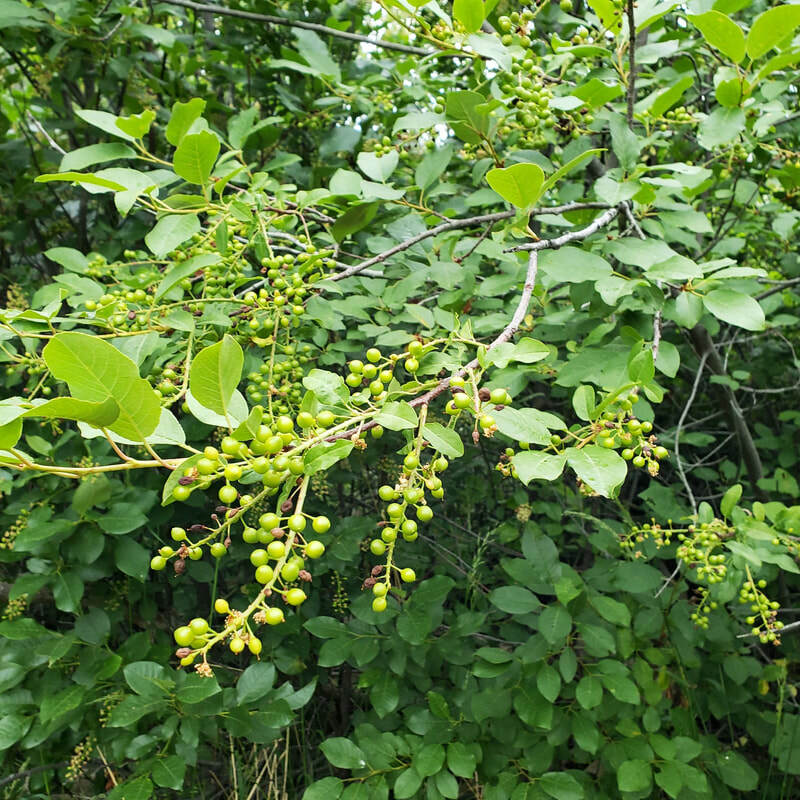 The berries (called haws) are not ripe yet, but when ripe they are edible! The seeds contain cyanide (like apple seeds), so it is best to spit them out! 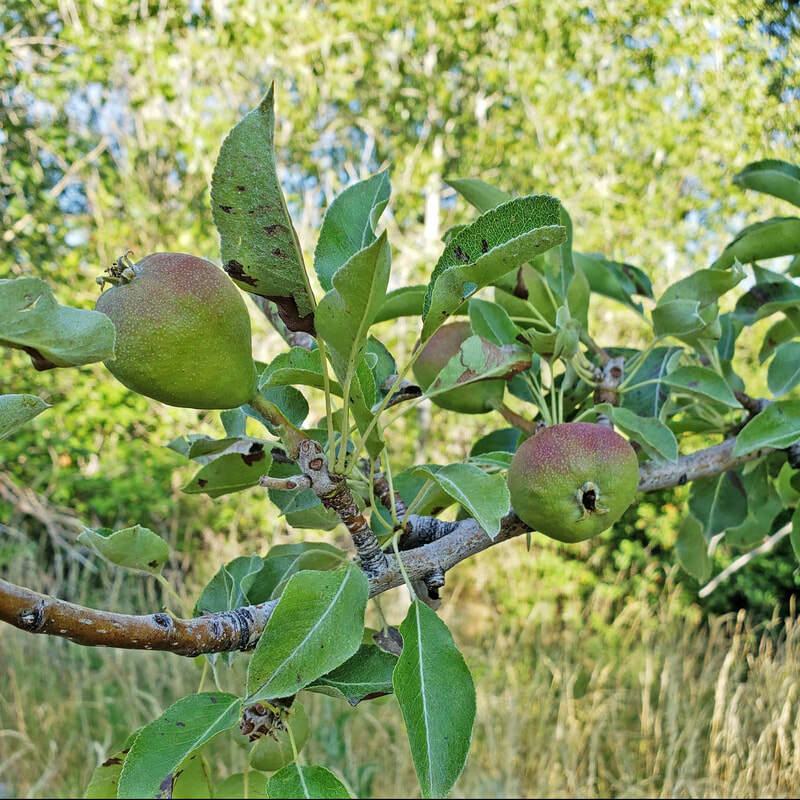 There are also several Apple Trees growing along High Bench trail. 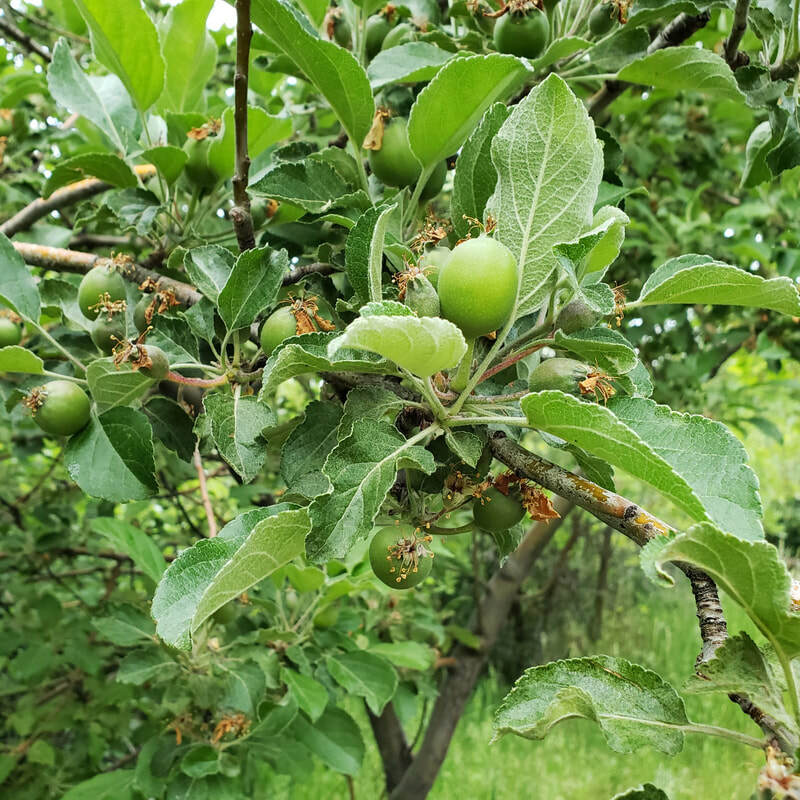 The apples are still small, so keep an eye on them if you want to try one! Maybe the wildlife also have an eye out for a succulent apple in the fall! 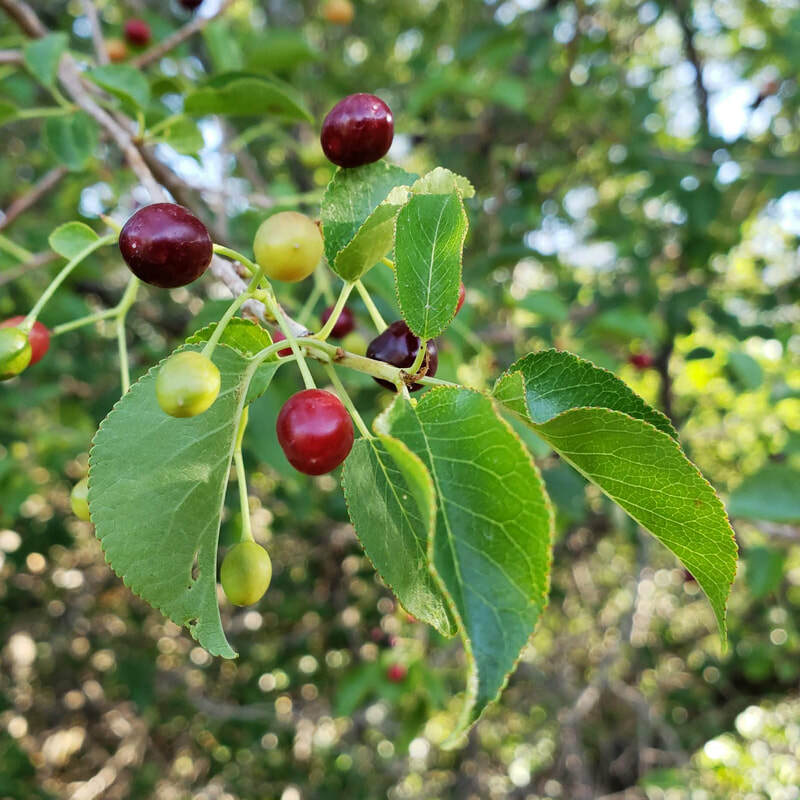 The Chokecherry Trees are plentiful along High Bench and Rodeo Down Trails. They are also loaded in unripe berries right now! The fruit will become edible, but very tart! The seeds are poisonous, so spit them out if you eat the berries. Birds love them, and so might you! The berries turn red, then black, and are sweetest later in the season! The flowers are now gone from the Red-Stemmed Dogwood growing at the source of Grove Spring. Keep an eye out for small white berries beginning to form on it! While the berries can be somewhat palatable, they also induce vomiting when consumed in large quantities! 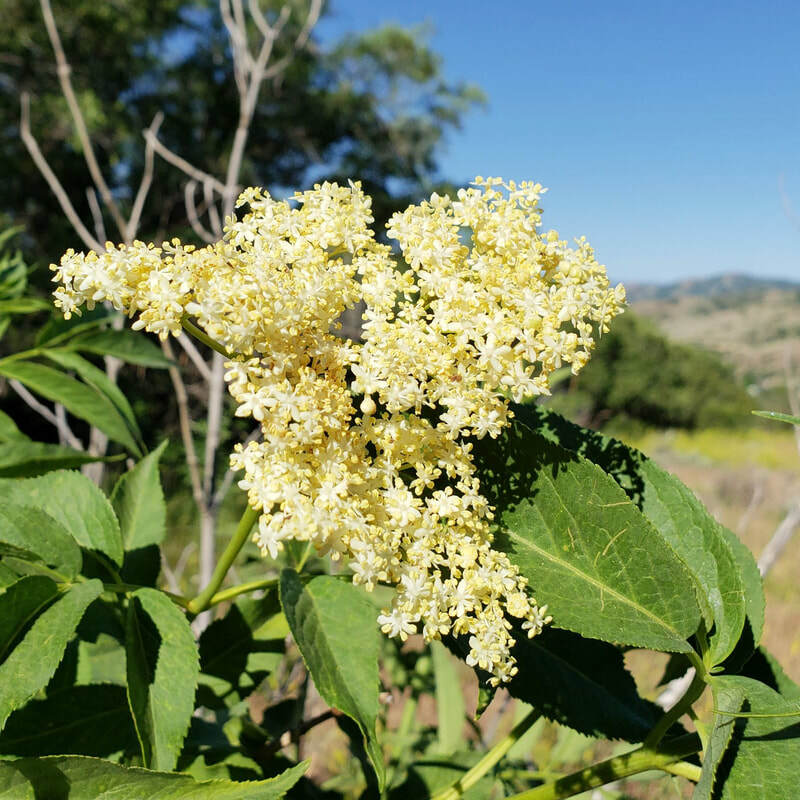 The Elderberry Tree seems out of sync with its blooming neighbors, flowering an entire month later than the other fruit trees in Lambert Park! The distinctive spreading white-yellow blooms appear almost flat on top! Its fruit can be made into wine, syrup, jams and pies, but some people enjoy dipping a bunch of the flowers (held by the stem) into some batter and deep fat frying them! As with so many of these fruits, it is best not to eat the seeds! There are a few Mountain Mahogany trees in bloom along the River trail. The unique feathery white tendrils stand out against the sky. When they fall off they will form a ground cover much more attractive than that provided by cottonwood trees! Rodeo Down trail also hosts some Water Birch trees! This fine specimen can be found right next to one of the bridges. 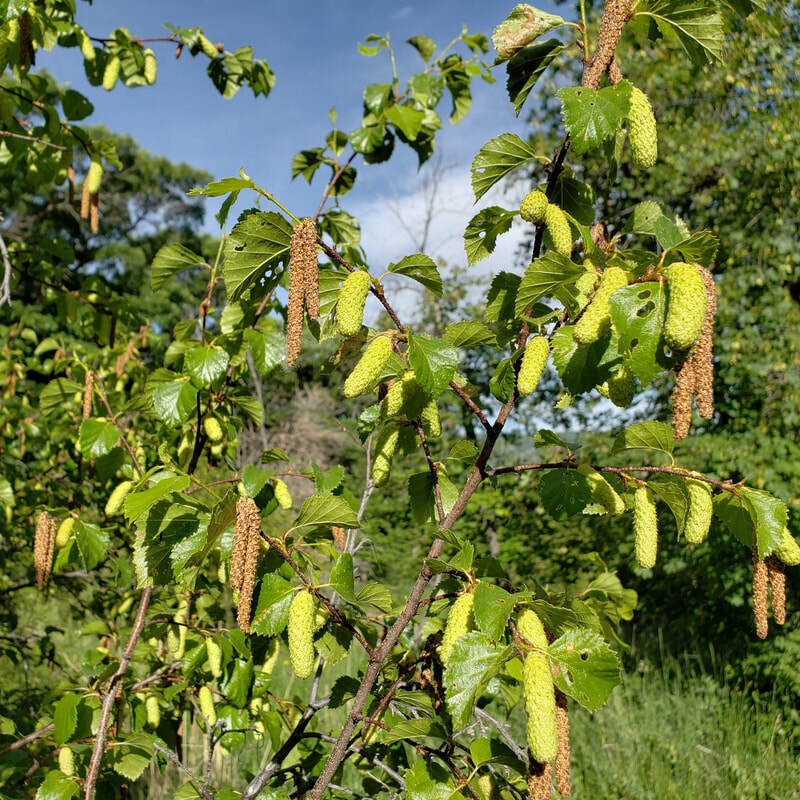 You can still see a few catkins (hangy things) holding on to help you identify this very pretty tree! Birch sap is reported to have medicinal properties, and could even help you in your attempt to lose weight! This Tamarisk Tree, could be the beginning of an invasion in Lambert Park if not removed! 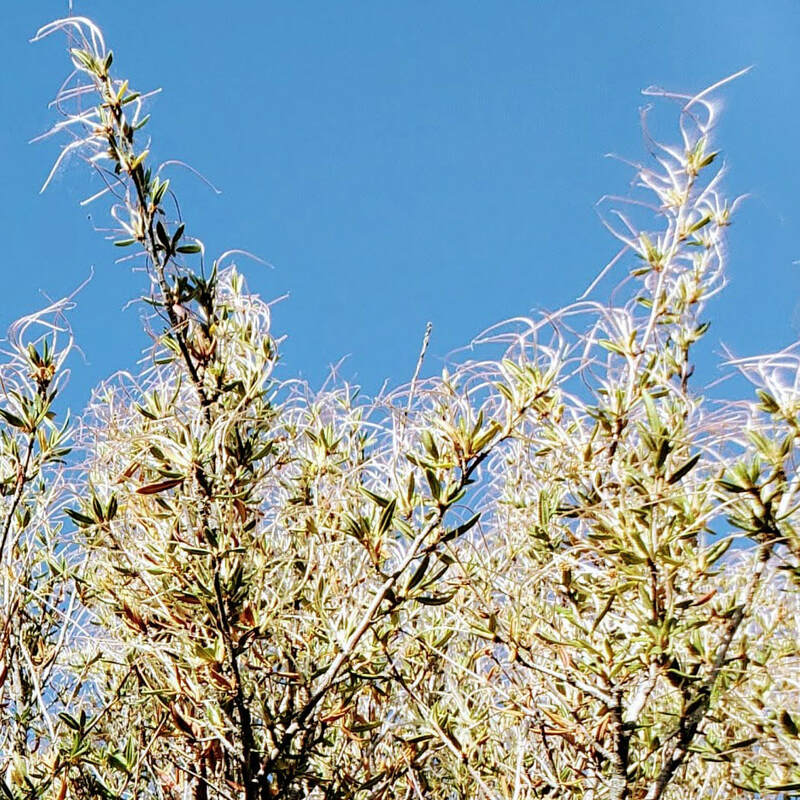 The Tamarisk comes from Europe or the eastern Mediterranean, and has adapted so well to our western landscape, that it has displaced native species. It is a fire hazard and consumes more water along creek beds than native species. 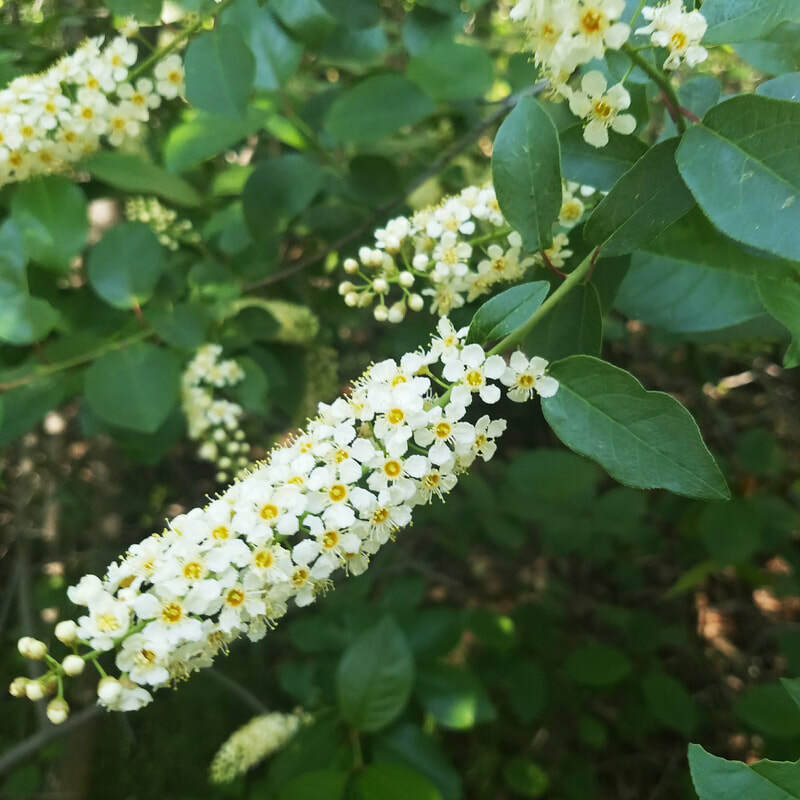 This infant tree along Spring trail is in bloom now with tiny white/yellow flowers. 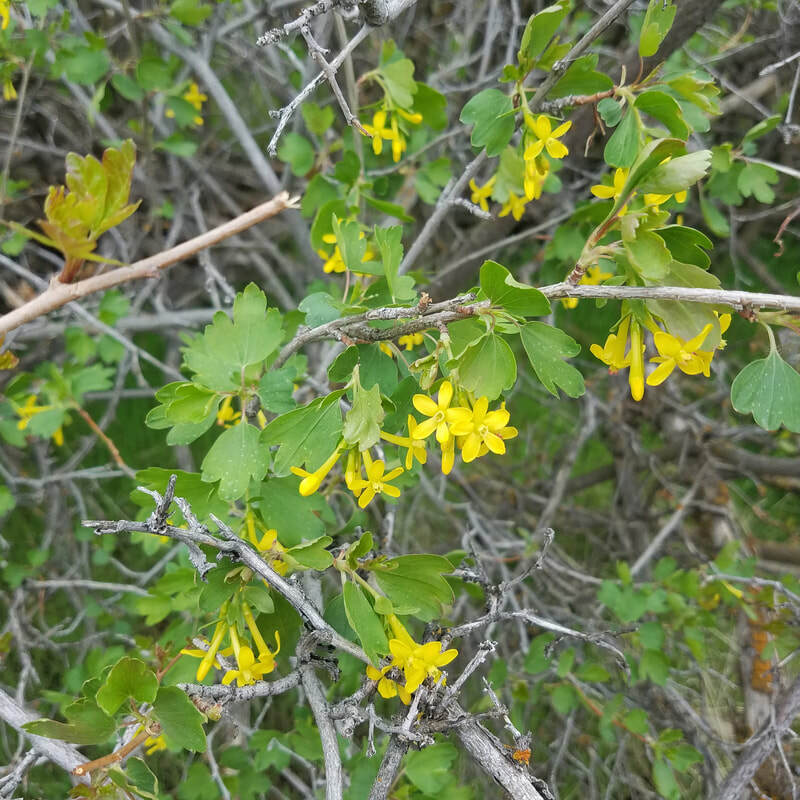 While the bright yellow flowers of the Golden Currant Bush are easy to spot in the springtime, in summer it fades into the tangle of sumac and other vegetation. 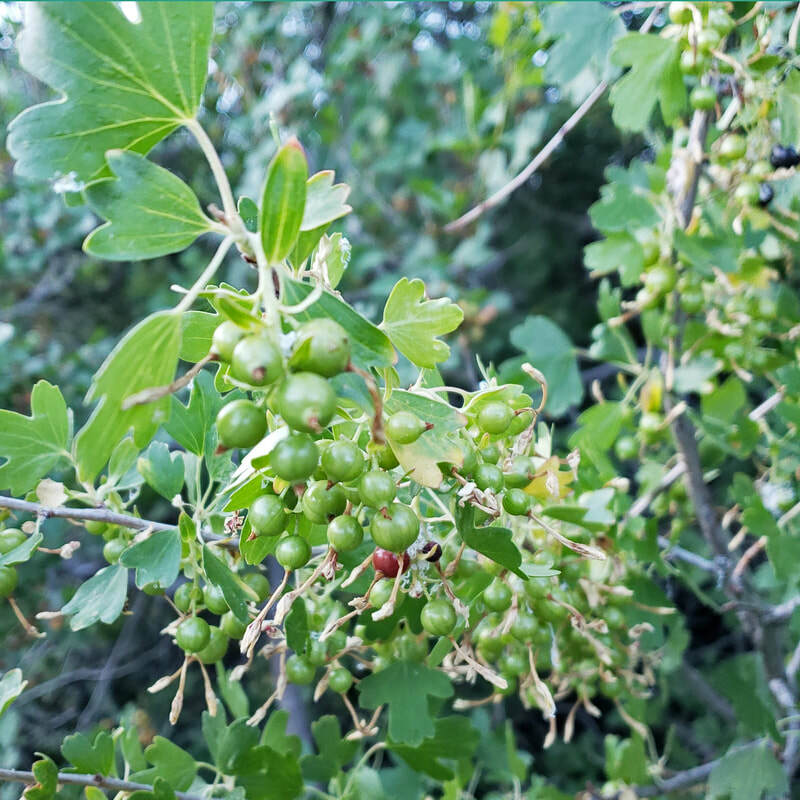 Look carefully for the tiny maple-shaped leaves, and you might find these tasty berries! 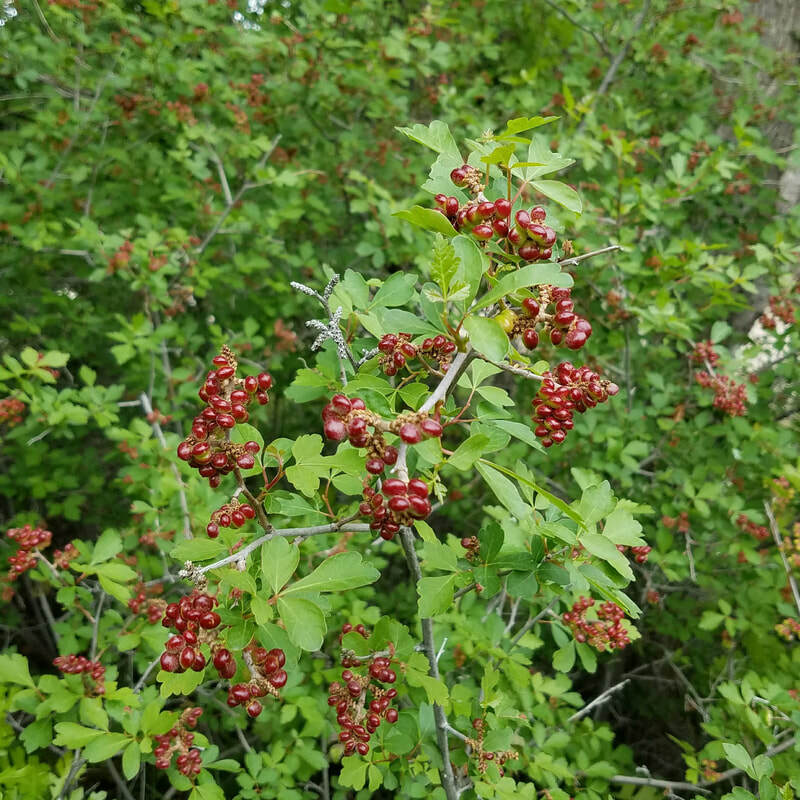 The translucent berries may be red, orange or dark purple! You'll have to hurry to get a taste, because the birds love them, too! The Aromatic Sumac is one of our most beautiful and colorful fall trees! It is also beautiful in early summer with its plethora of berries, changing from green to red to yellow. They are oily to the touch, and very tart! However, if you add a few to your water bottle on a hot summer day they provide a refreshing lemonady flavor! The cottonwoods have left a fine dusting along parts of Rodeo Down and High Bench. This Narrow Leaf Cottonwood near the top of Rodeo Down Trail has a few tell-tale leaves protruding from its trunk, but has the majority of its leaves and catkins high in the crown! 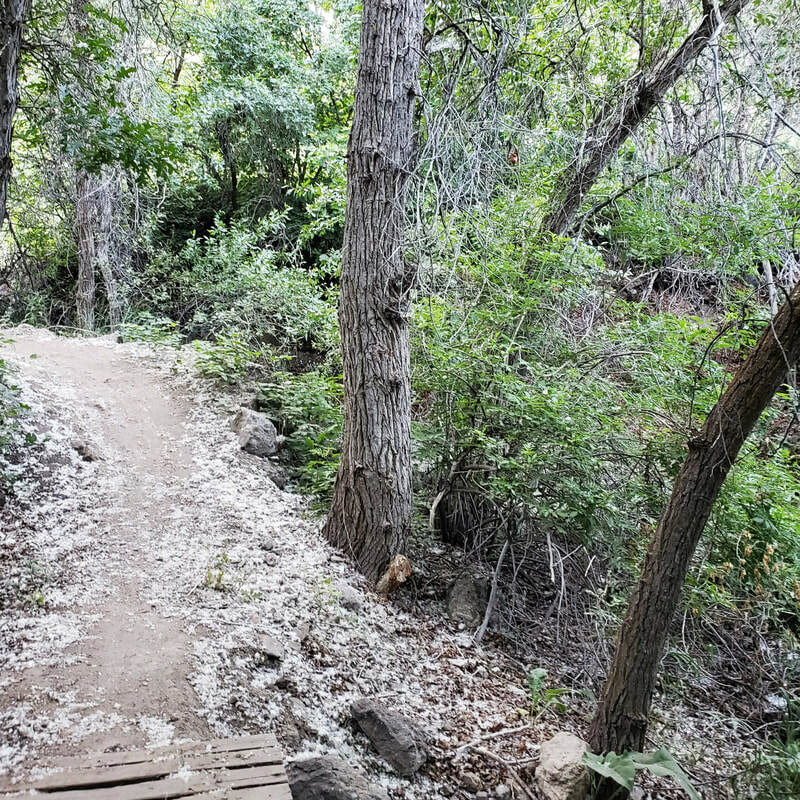 Although some people consider cottonwoods a messy and sometimes allergenic tree, its root system can provide ground stabilization, and it's crown plenty of shade in the summer! The Tree of Heaven is so fast growing and invasive that some people prefer to call it a "tree of hell." It has been planted in the United States as an ornamental from China. It grows to 50 feet tall and sends suckers out all around it. 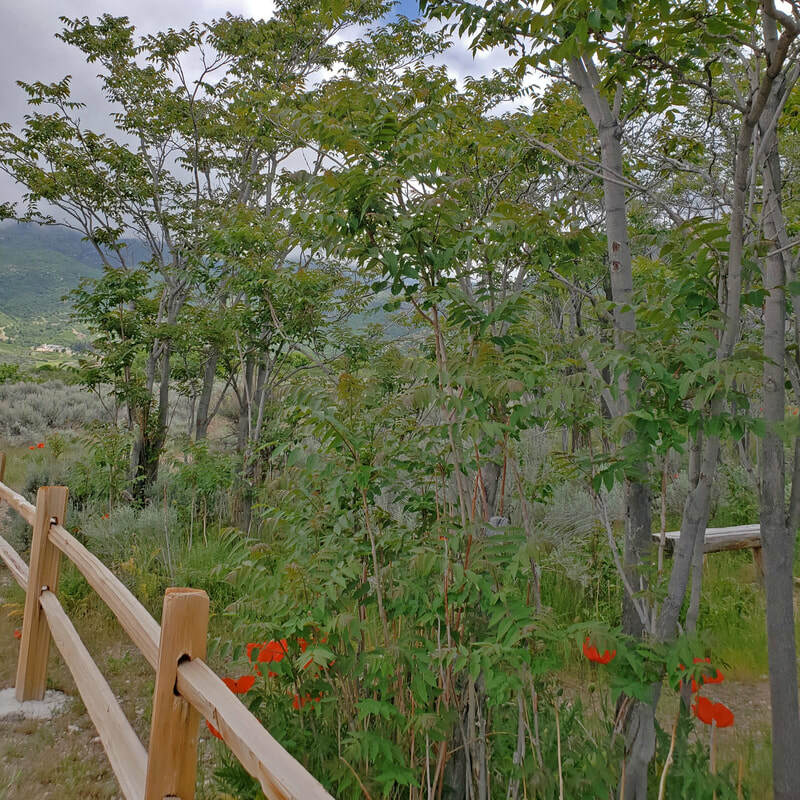 Our poppies at Lambert Ruin are surrounded by these trees. The foundation of the ruin is also now filling up with them. It would be a good service project to clean out the trees inside the homestead! Break the leaves in half and take a scent of this foul-smelling tree! 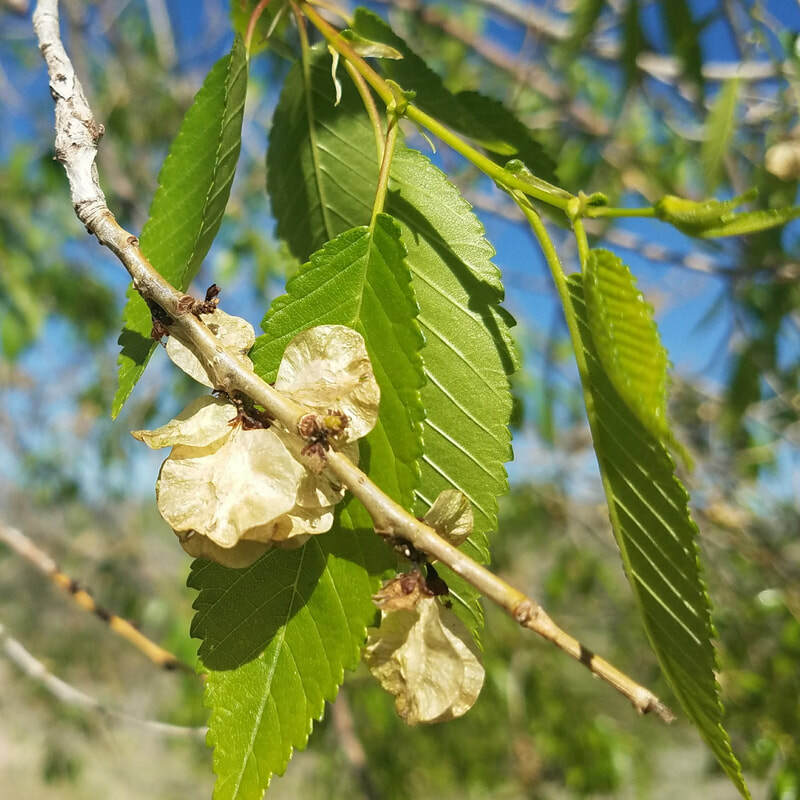 The Siberian Elm no longer has the distinctive papery translucent fruits that bloom in early spring, but the stand of elms below the south water tower provide a shady spot to rest on a hot summer's hike in Lambert Park! The papery fruits called 'samaras' are reportedly not only edible, but delicious! 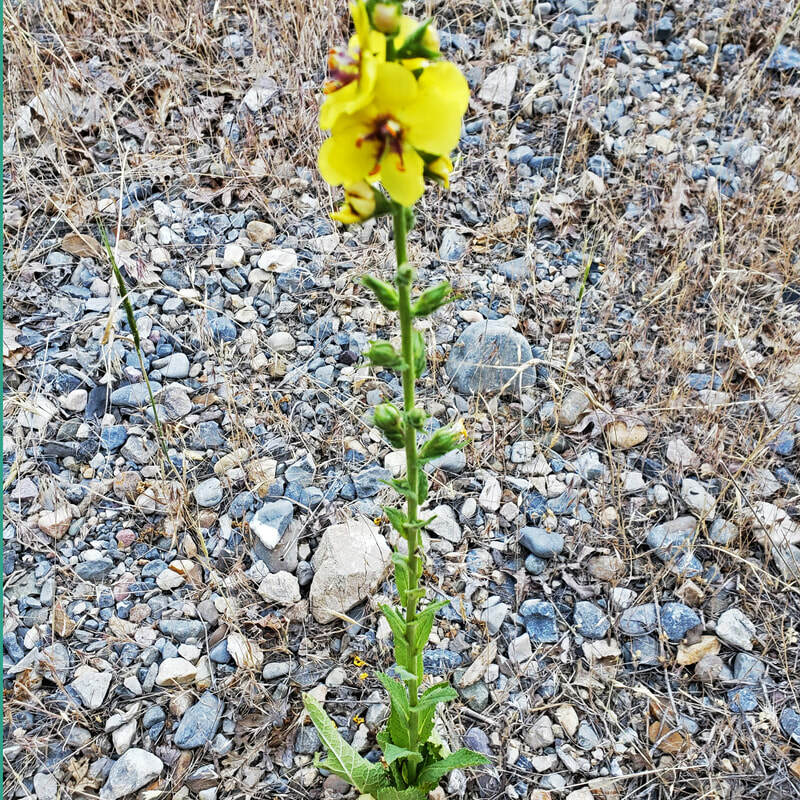 The Great Mullein draws attention to itself with it's tall spike of yellow flowers in mid-summer. This invader from Europe and Asia has many medicinal purposes, including a tea made that helps with incontinence. It's large fuzzy leaves can also serve as nature's toilet paper for campers who are caught unprepared! 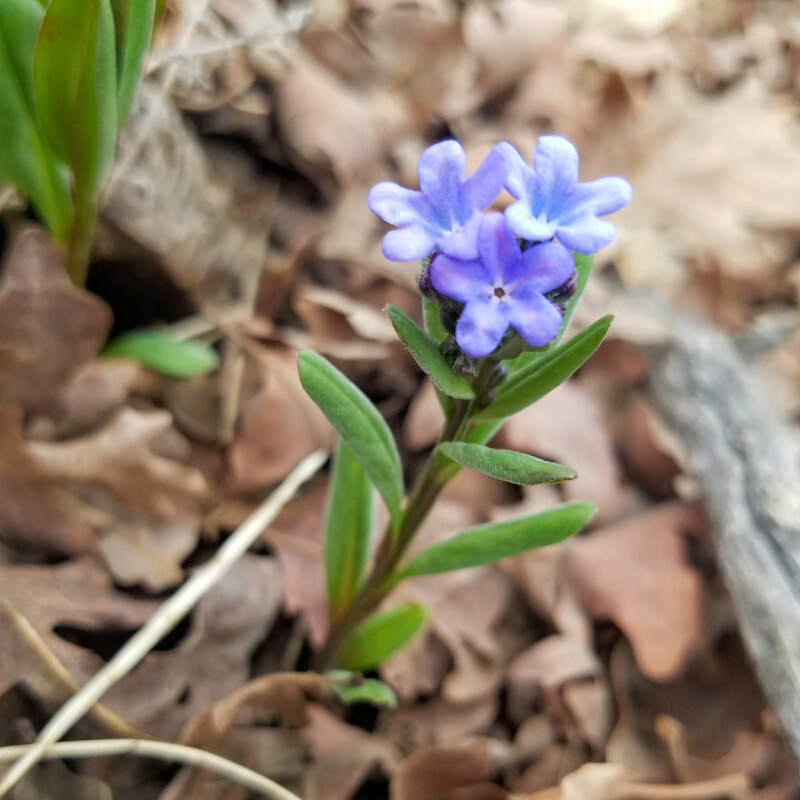 You might overlook the Prostrate Vervain, as its purple flower is so tiny! It is a native of North America and occurs throughout the continent. It grows in long stems that lie low to the ground. The Navajo used its stems and leaves to make a poultice to treat centipede bites. 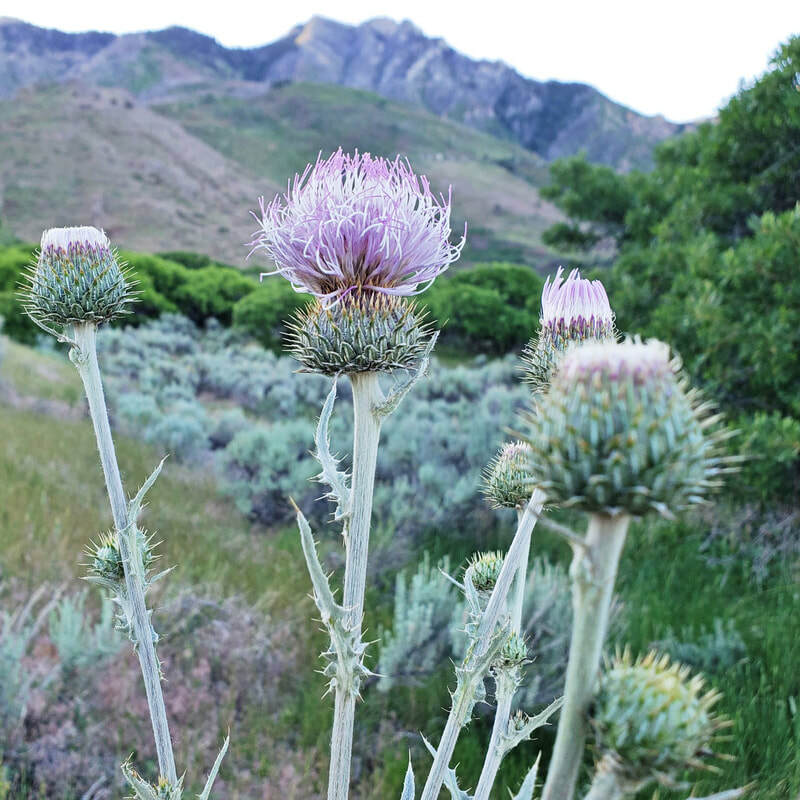 Musk Thistle is one of the most beautiful noxious weeds in the state! 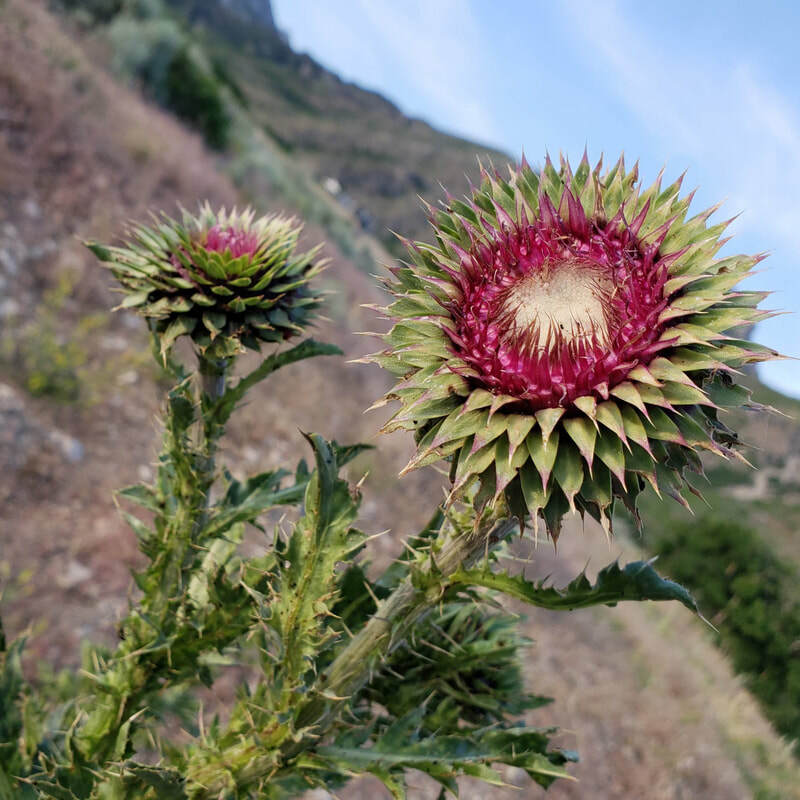 It is also called Nodding Thistle for the flower head that tends to nod to one side. This Eurasian invader grows well in disturbed ares and can supplant native species. 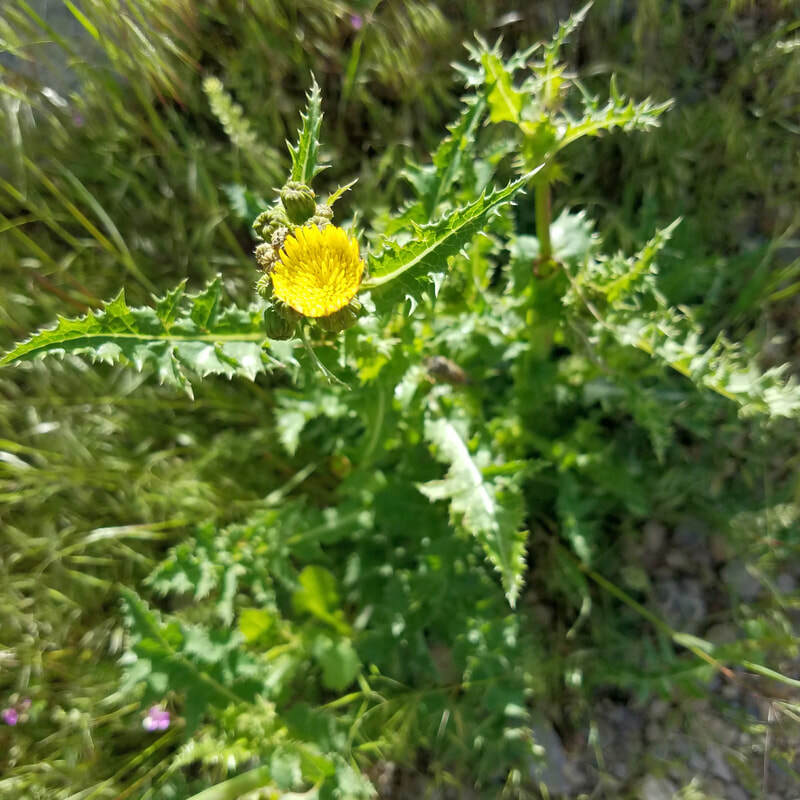 Utah Thistle, a variation of New Mexican Thistle, is another beautiful thistle, but this native plant is considered to be non non-weedy! Like many thistles, it is very attractive to bees and other insects. The make a great spot to observe tiny creatures around us! Alfalfa came from southwestern Asia around 1736. It is a popular feed for livestock as well as wildlife. It is very nutritious, having more protein per acre than most other crops! It also provides important coverage for nesting waterfowls and other birds! Woods Rose is very difficult to distinguish from dog rose. 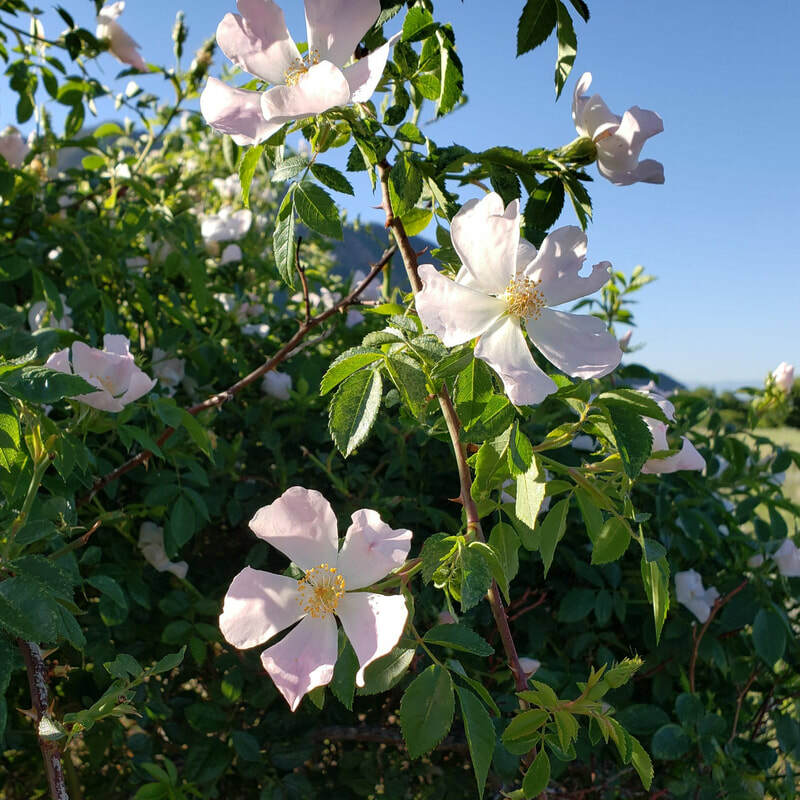 In contrast to the dog rose, it is native to north America. It doesn't tend to attract the galls (birth chambers for baby wasps) that the dog rose fosters. It was named for the botanist, Joseph Woods, not for the forest. 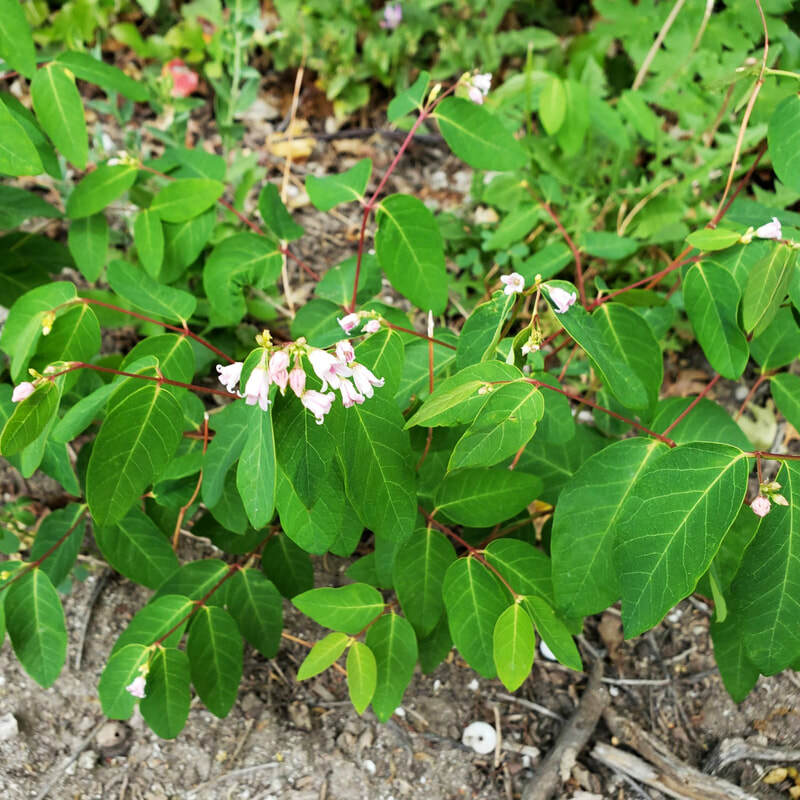 Spreading Dogbane is a beautiful little pink bell-shaped flower on woody stems, surrounded by lush, large leaves. If you break open a stem, a milk-white sap is released. It is toxic to humans as well as livestock and dogs! Thus, the name! 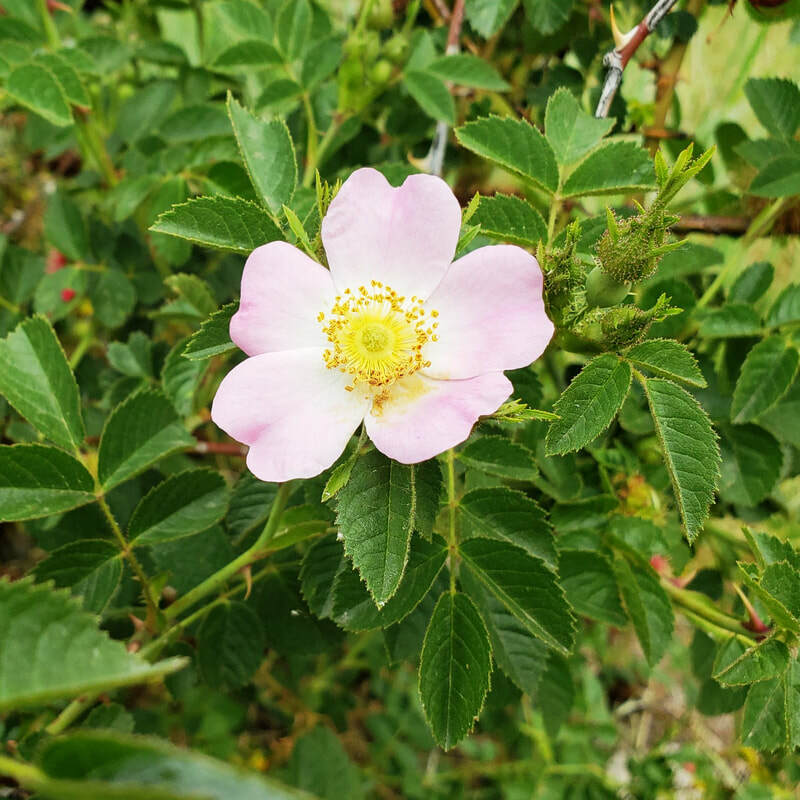 The Dog Rose, a native of Europe is found along roadsides in the United States. It was planted widely in victory gardens here after World War II. The fruit is noted for its high level of vitamin C, and is used to make syrup, tea, and marmalade. Curlycup Gumweed is a native plant that is easy to identify for the stickiness of the upper portion of the plant, as well as the curly bracts below the flower head. It has been used in traditional applications, such as treatment for poison ivy and bronchial asthsma. 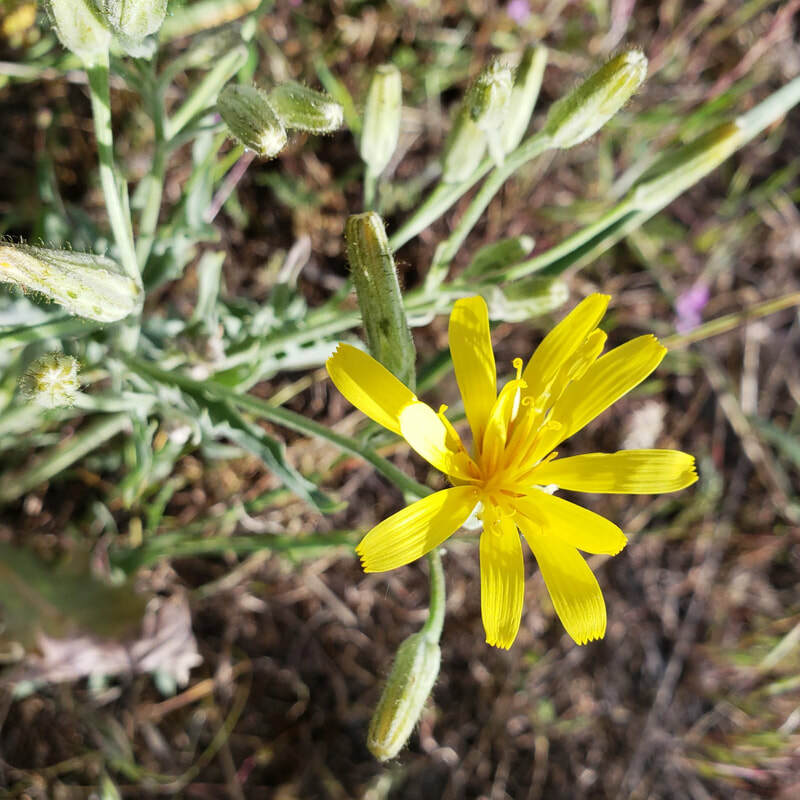 Western Hawksbeard , is another member of the sunflower family that is also native to the United States. It's leaves are slightly and toothed. and it's bright yellow rays are a splash of sunshine in the prairie! Bindweed, is not even remotely related to the morning glory, despite the fact that many of us know it by that name. It is a native of Europe, and grows vine-like over ground and vegetation, making it hard to eradicate. It's success has been the bane of many a gardener, trying to eradicate it from their yard! 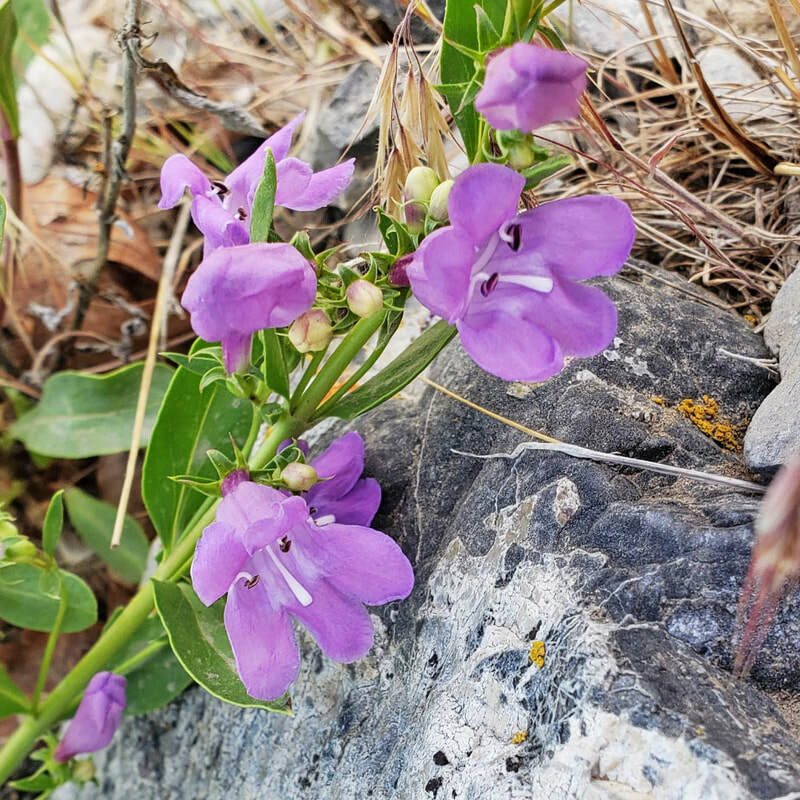 Penstemon is a large genus of roughly 250 species of flowering plants native mostly to North America. The are also known as Beardstongues, and are noted for the unique two-lip shape of their petals. 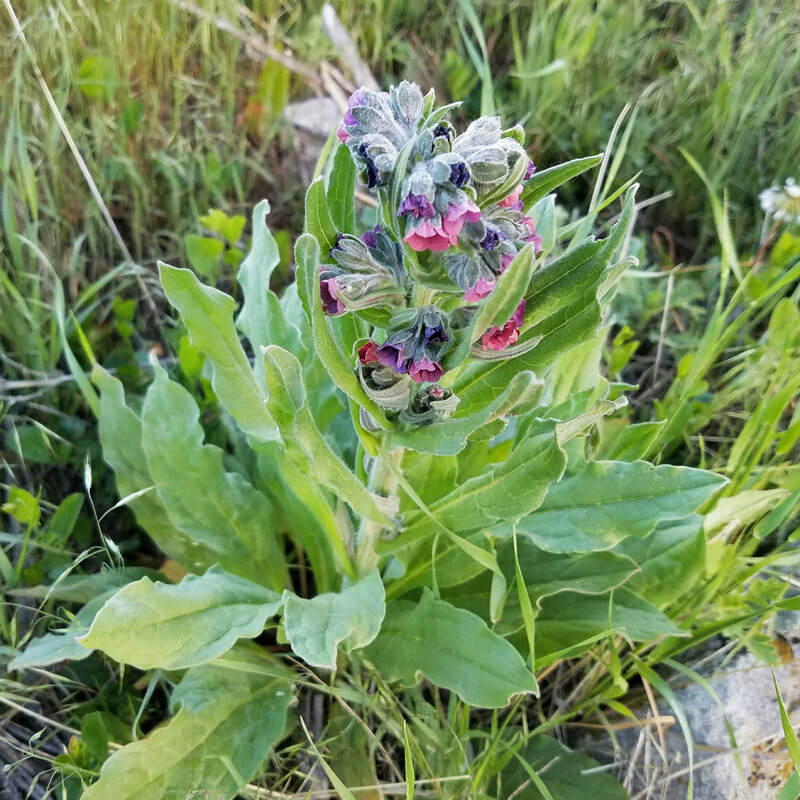 This Broad-leaf Penstemon can be seen along Lambert Luge in Lambert Park. 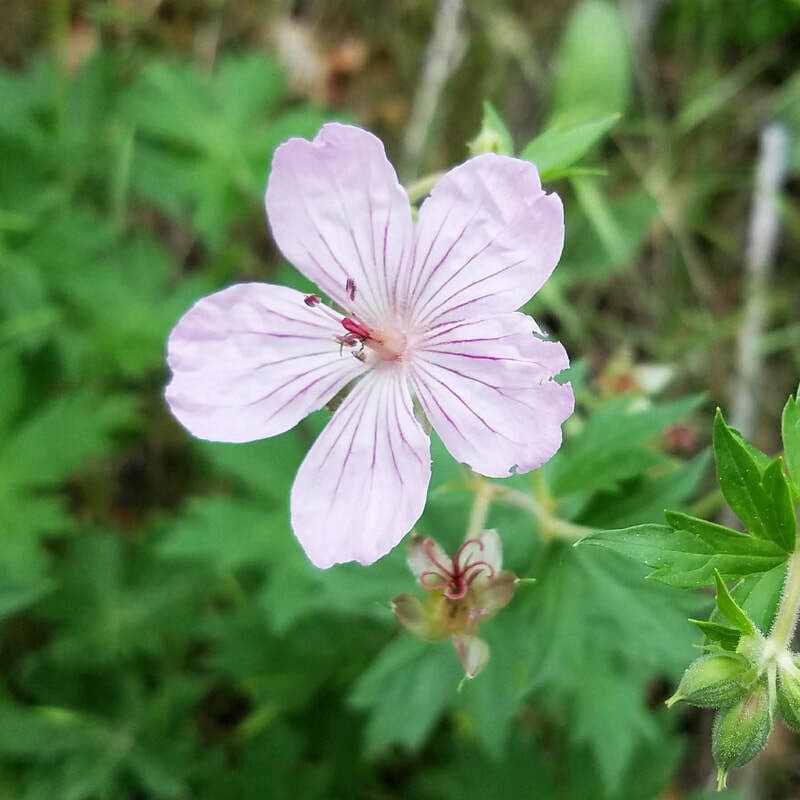 Sticky Geranium can be found along the northern part of High Bench trail. This native of the Northwestern United States got its name because its stem, leaves and flower stalks are covered with sticky hairs. There are so many kinds of peas in Lambert Park! Utah Sweetvetch is about a foot tall and very showy right now. While not technically in Lambert park, it is found on the southern part of Corkscrew trail! 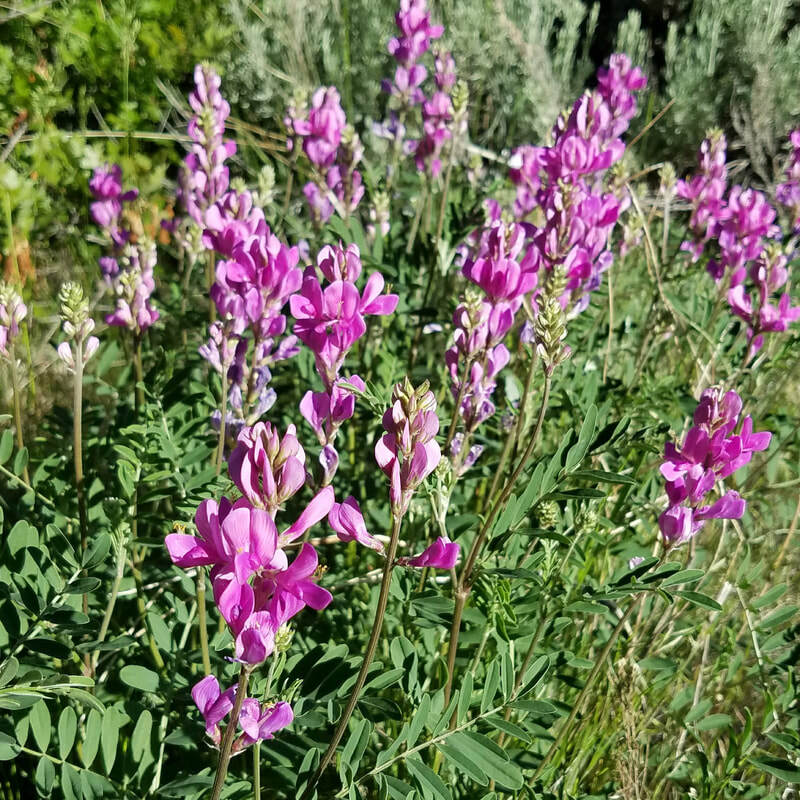 Unlike many forms of vetch, this one is palatable to livestock and wild animals, forming an important part of the sage grouse habitat! 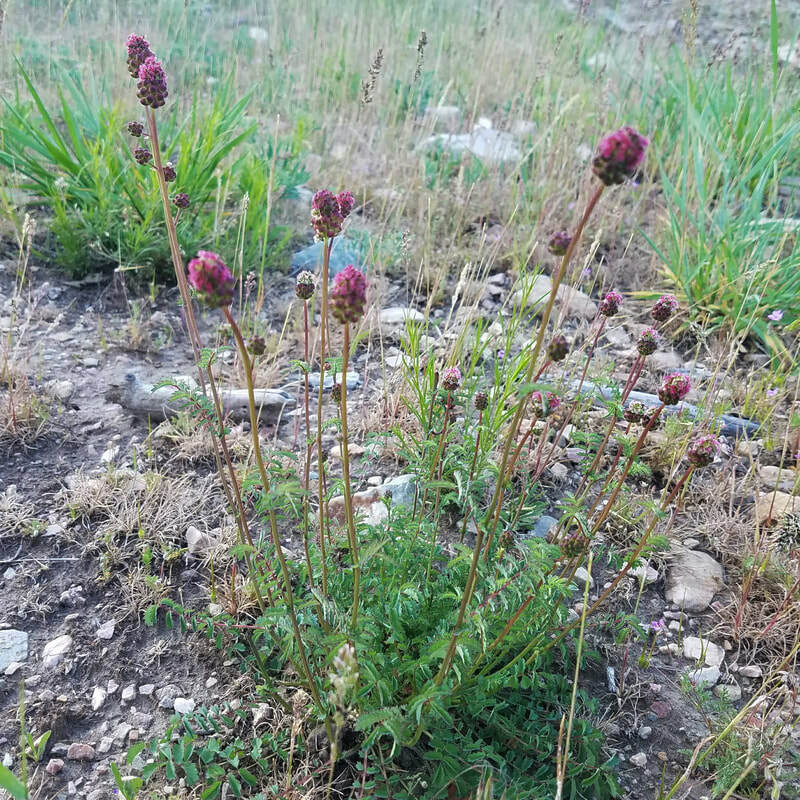 Salad burnet is an herb originally from Europe, northwest Africa and southwest Asia. It has become naturailzed in North America, and is a popular addition to salads (thus its name). Its leaves have a "light cucumber" flavor! 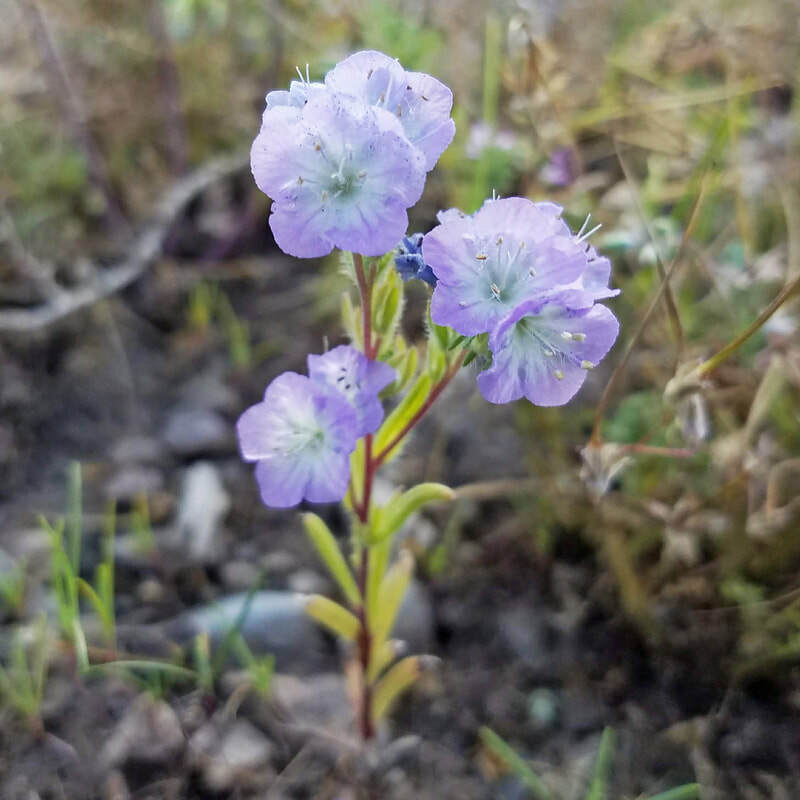 Linear Phacelia is another native of North America that thrives in forests, woodlands, open scrub and other habitats! It's hearty ability to grow in such a variety of habitats belies its fragile beauty! 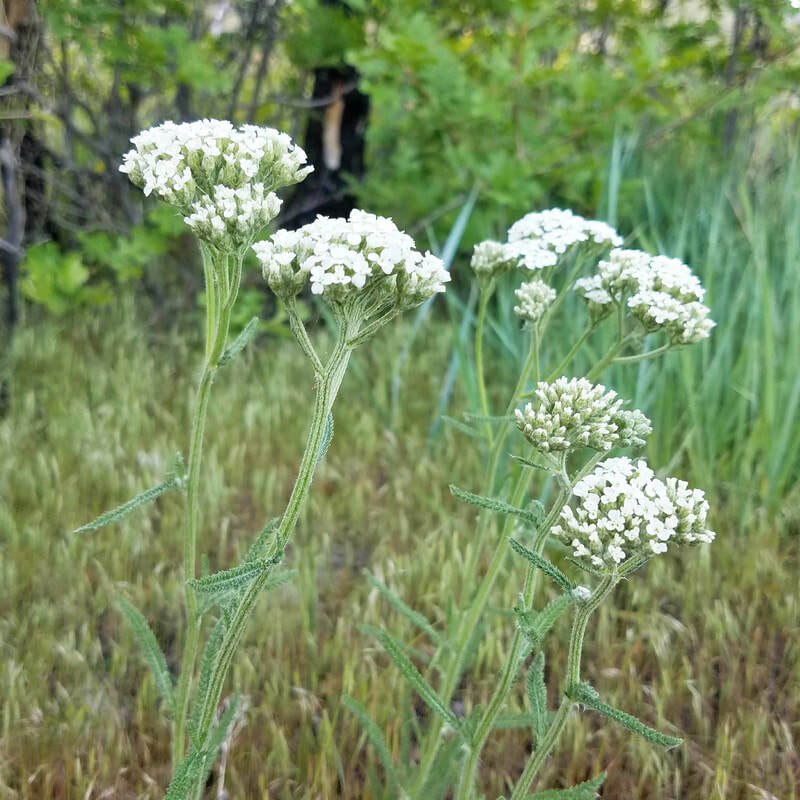 In New Mexico and Colorado yarrow is known as plumajillo (Spanish for little feather). The leaves are soft and feather, with tiny leaves on them. 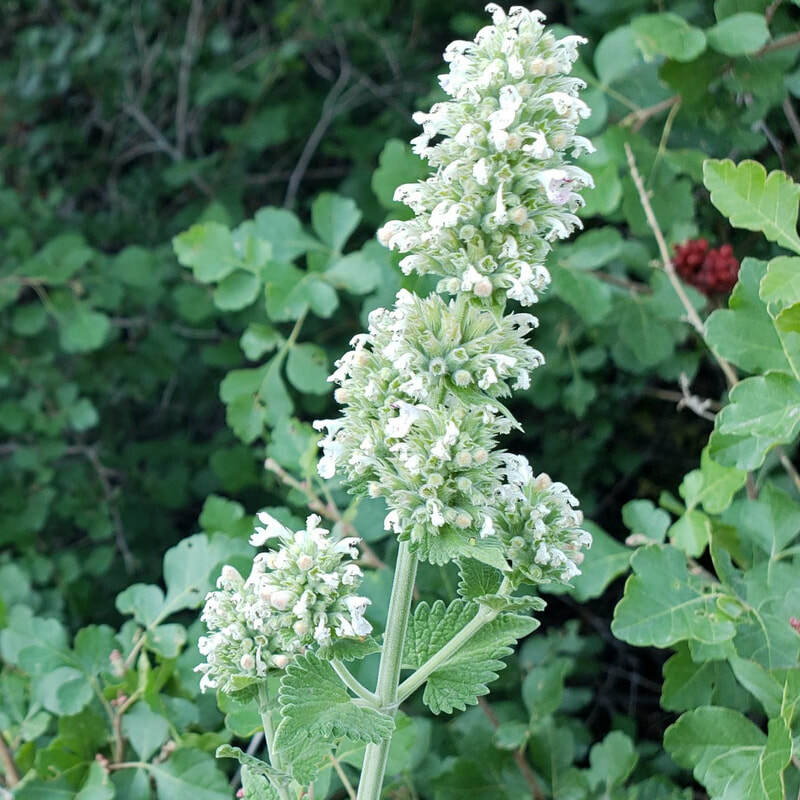 The plant has been used medicinally to stanch bleeding which use can it an additional name: herbal militaris. 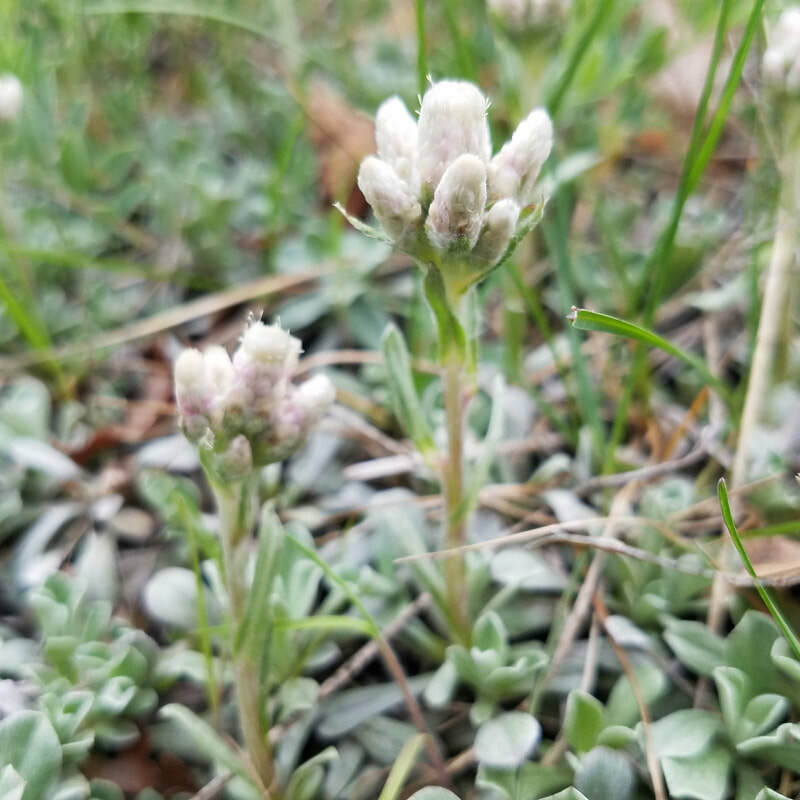 Whatever it's name, this plant with showy white flowers is a real addition to our landscape in Lambert Park! At first glance whitetop might look a little like yarrow. Look closer. The leaves are bigger and the flowers are smaller. Don't be fooled! Whitetop is classified as an invasive week in Utah. It came over from Asia and easily crowded out beneficial, native species that provide habitat for animals. 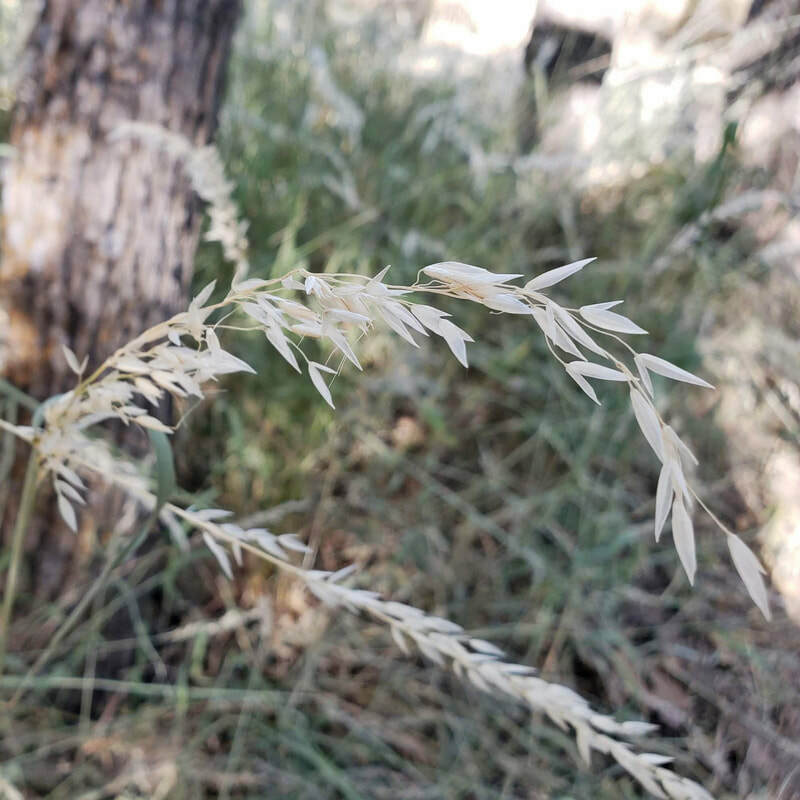 It grows especially well under cheat grass in burn areas! Our state flower is in bloom, but won't last long. See the sego lilies along the southern part of Poppy Trail in Lambert park! It was chosen as the state flower not just for its beauty, but because of the bulb being used by indigenous people as well as pioneers as a food source. Yellow sweet clover, although a Eurasian import, has found a place in our landscape. Livestock can tolerate it, and bees love it! Clover honey from nearby hives is a light colored, mild flavored honey purported to be rich in zinc, copper, magnesium, potassium, and manganese, as well as high levels of B vitamins, vitamin C, polyphenolic antioxidants, hydrogen peroxide, and calcium. It sounds like the perfect cure for whatever ails you! 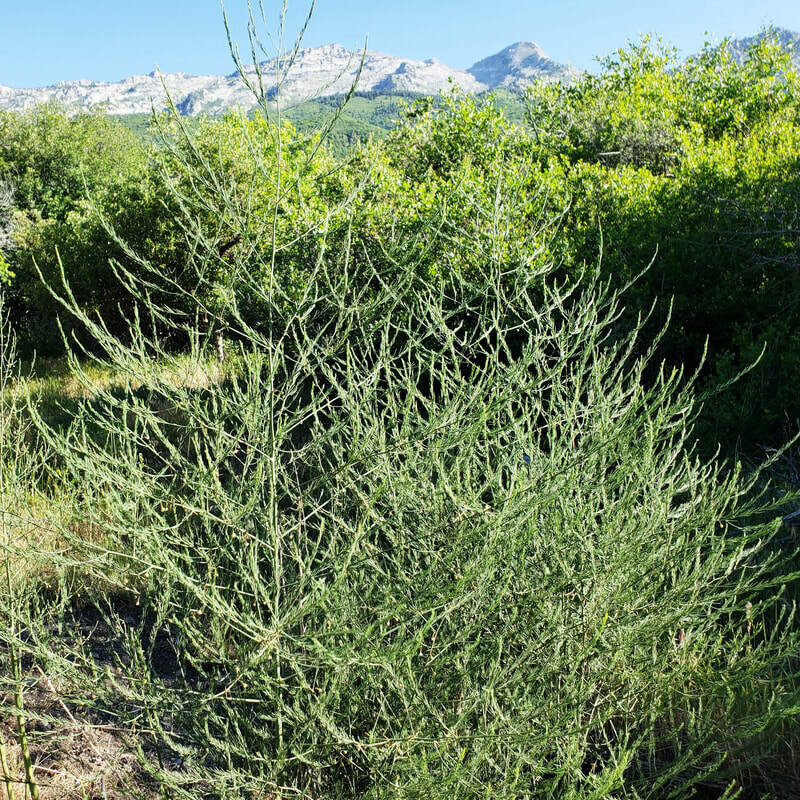 Houndstongue is an accidental import from Europe that is considered an invasive week in Utah. Despite its traditional use to cure just about everything from madness to baldness, it has fallen out of favor, perhaps due to inconclusive medicinal use of any kind. In addition, it forms a bur-like fruit that is really hard to get out of your dog's fur in should they run through a patch of it in the fall! 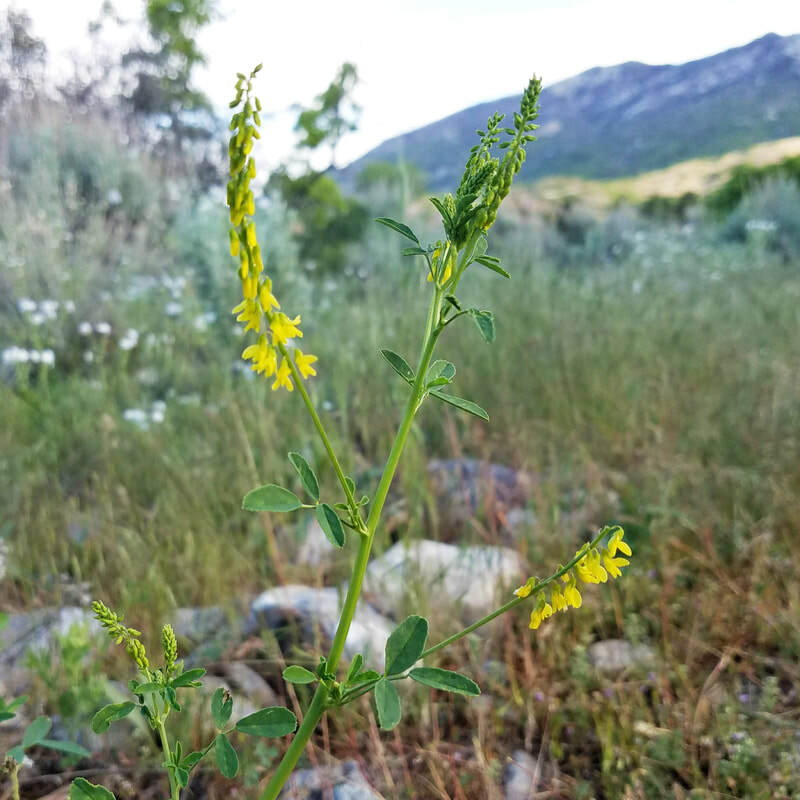 Flixweed is one of a vast number of yellow weeds and is on Utah's list of non-native invasive plants. 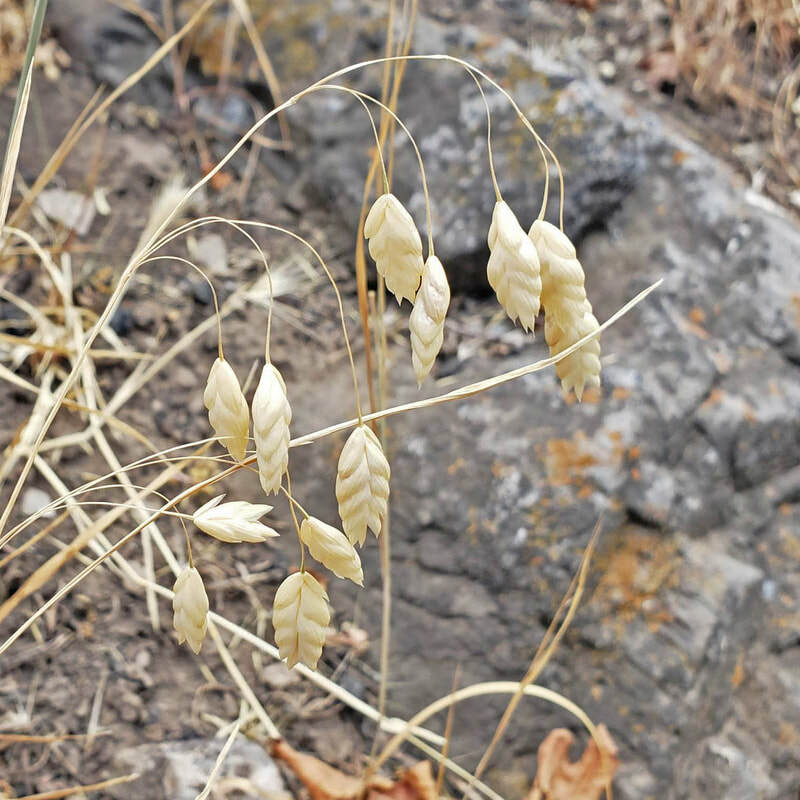 Although it is a nuisance plant in the west, in Iran, the seeds are called khak-e shir, and khak-e shir drinks are mostly known as thirst quenchers during hot summer days. Maybe we should try it! The Common Poppies are in bloom at Lambert Ruin! Despite it's name, there is nothing "common" about this flower! It's robust showiness is in stark contrast to the subtlety of the native flowers in the park. 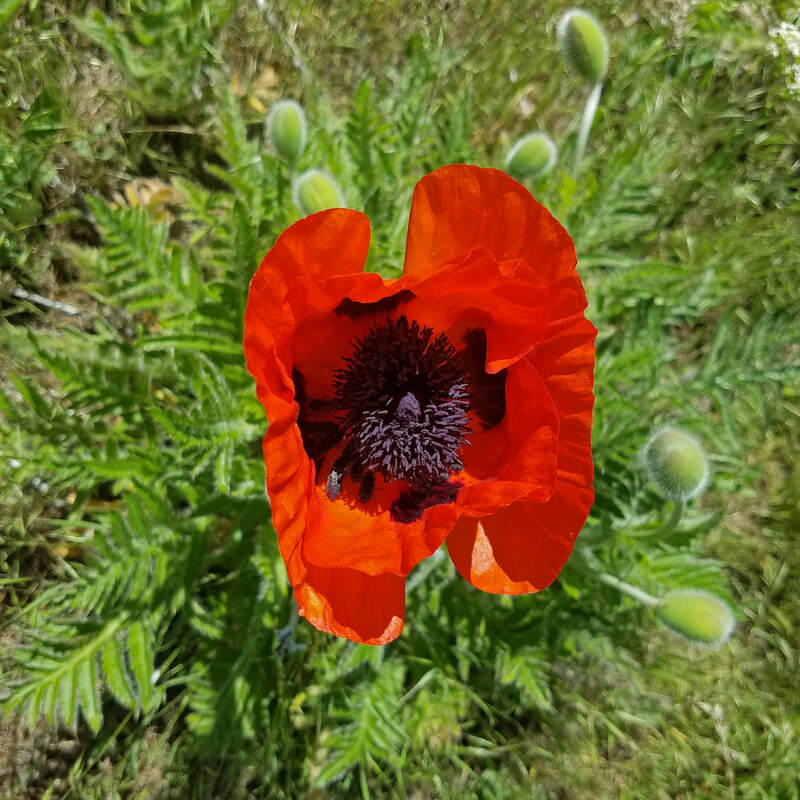 The poppy has been a symbol of remembrance of military veterans since the 1915 publishing of the poem describing the beautiful contrast of the poppies growing on the military battlefield in Flanders Fields. The Yellow Roses are also in bloom alongside the ruin! Another ornamental flourishing in the park, the yellow roses of Lambert Ruin may have been planted by the Lamberts themselves! There is a lovely patch of Wild Hyacinth along Rodeo Up Trail. It is also called Largeflower Triplet Lily because of the petal arrangements--two sets of three petals, one inside the other! Should we really celebrate the blossoming of our first thistle? The Sowthistle is an invader from Europe that has become naturalized in north America. Like many of its relatives in the dandelion family, it has edible leaves. The question is, how do you choke them down? 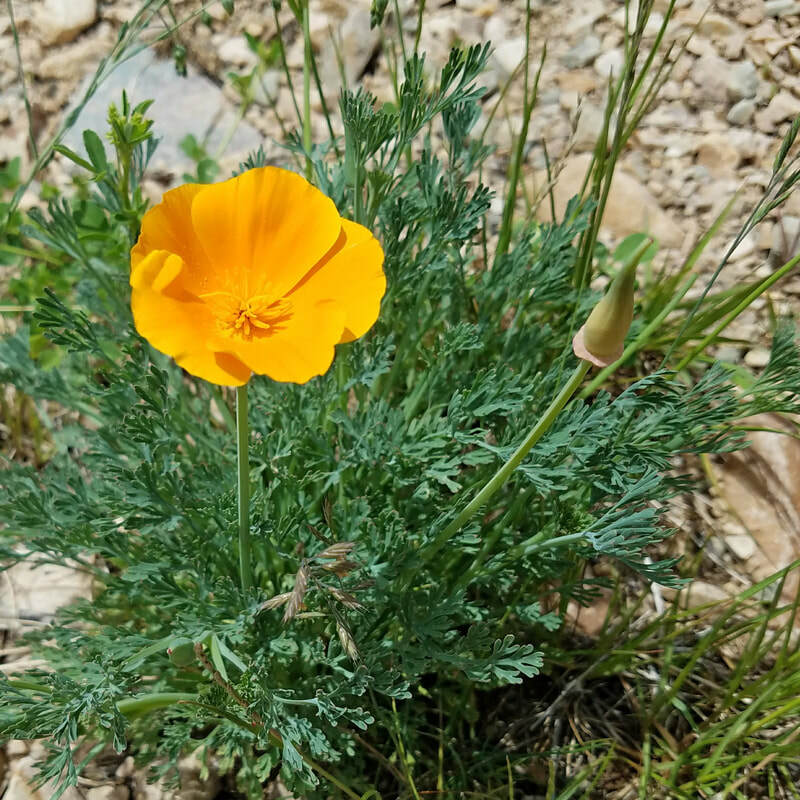 Unlike the poppies at Lambert Ruin, the California Poppy is a native of North America, specifically the Pacific Slopes. It is the state flower of California and was called Copa de Oro by the Spanish settlers, as its beautiful golden-orange color looks like a cup of gold! There are several of these by the bathroom on the southwest end of Lambert Park! 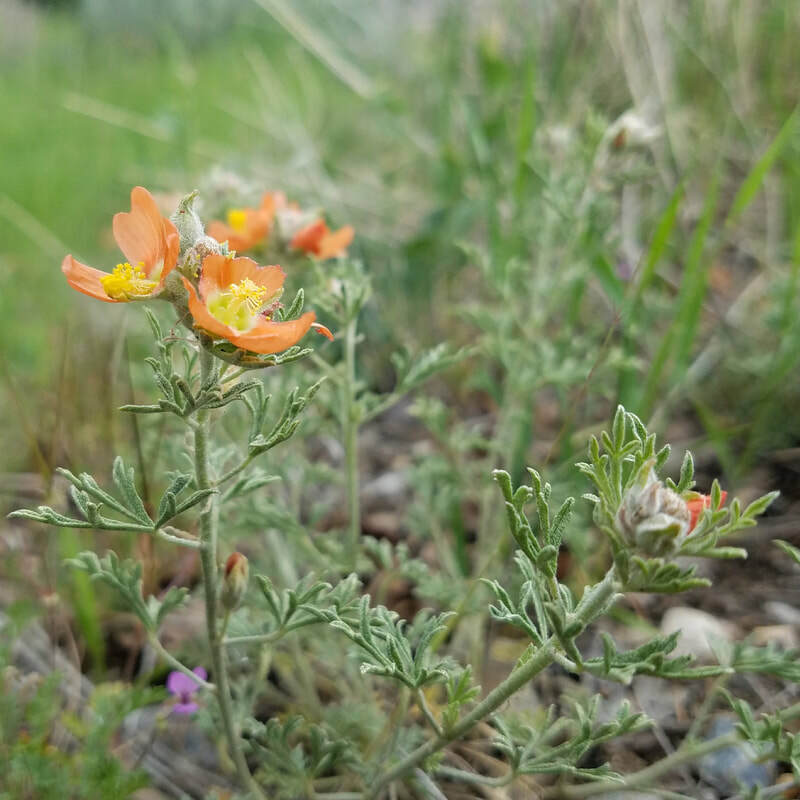 Another of our rare orange flowers is also in bloom--the Scarlet Globemallow, which in other regions tends to actually be red! 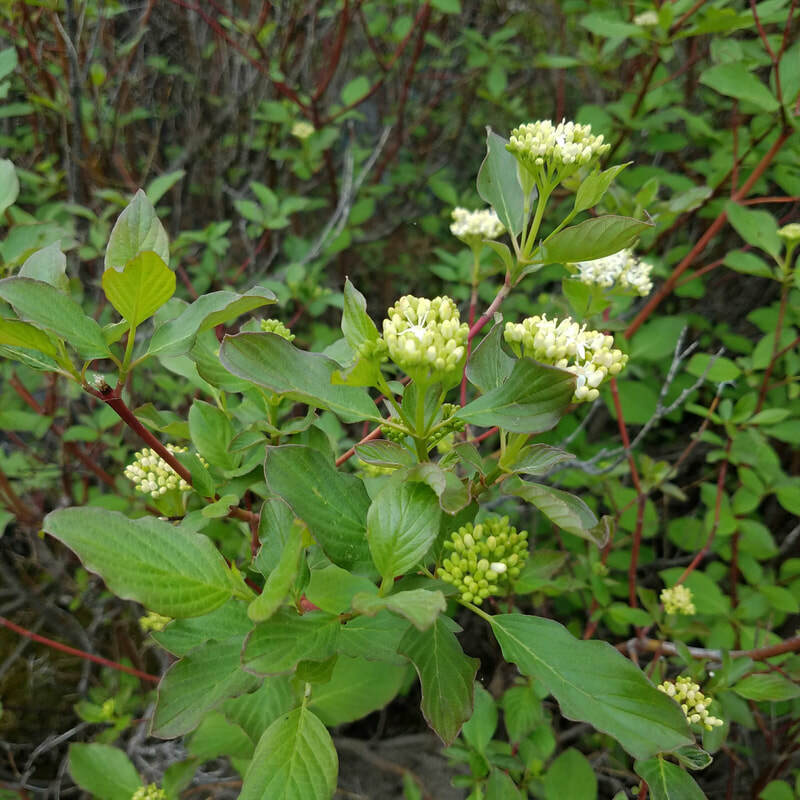 The Blackfeet Indians applied a past made from this plant to burns, scalds and external sores as a soothing agents. 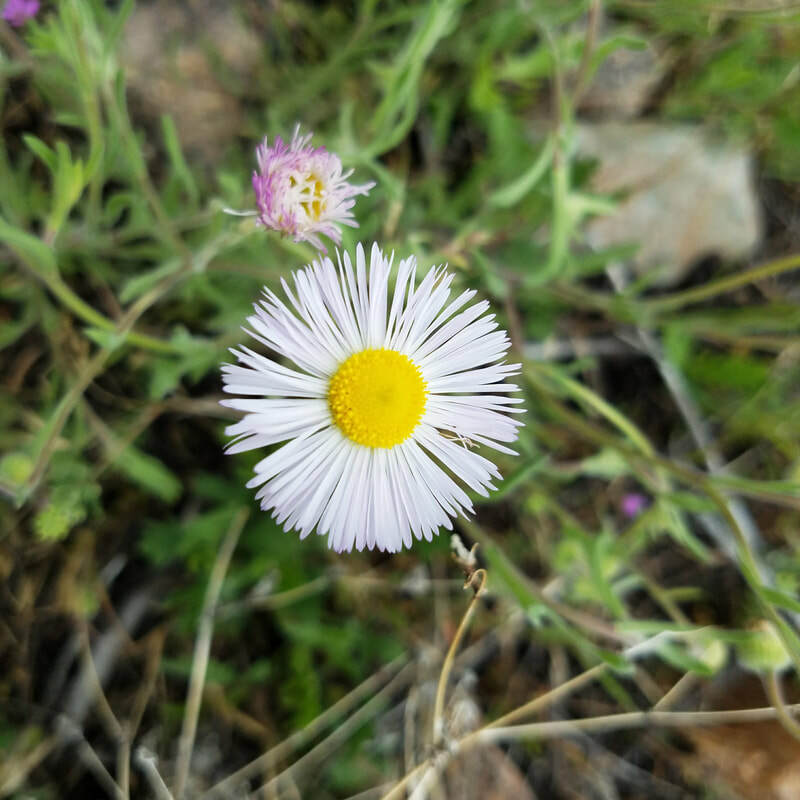 The Spreading Fleabane is another plant that was used medicinally by Native Americans. 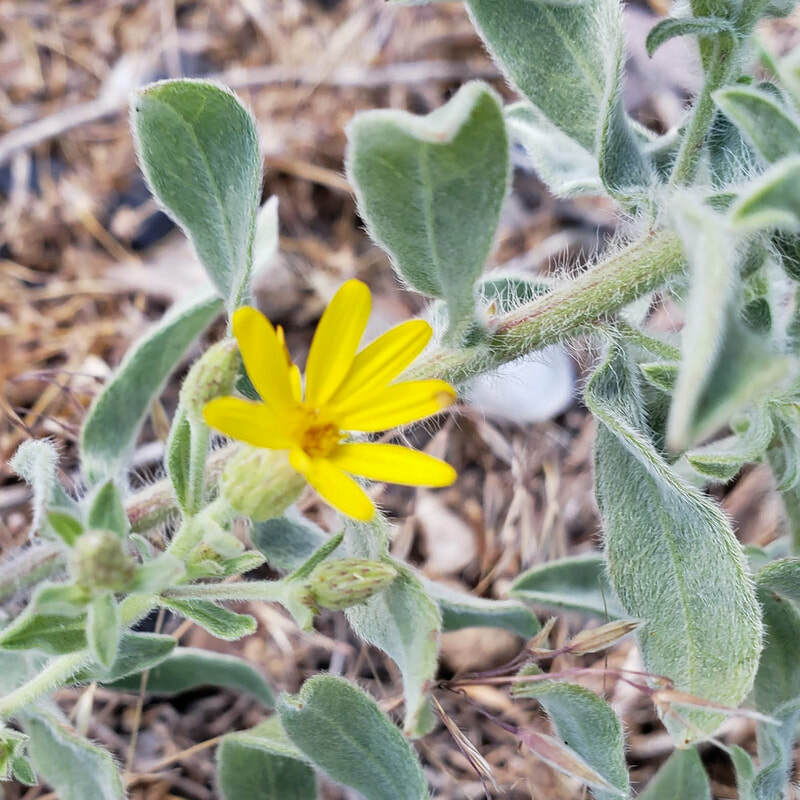 The Navajo used it to aid in childbirth, as lotion, for eyewash, and also snakebite and headache! If you walk at 7 in the morning you will think it is a closed purple flower. But, by 9 it is wide open and white with a yellow center! 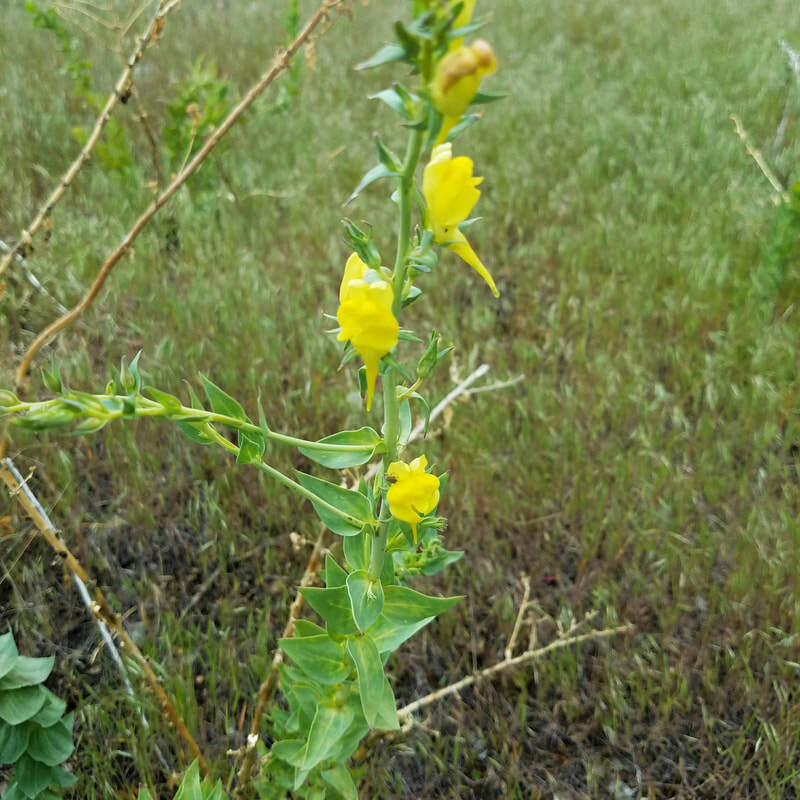 Dalmatian Toadflax, a flower introduced from Europe as an ornamental has become an aggressive invasive weed in the west. It comes from the Dalmatia region of Croatia (just like the dogs)! It is all over Lambert Park, and looks so pretty when it is in bloom! Count the petals on the flowers of the Tumble Mustard. If it has four, you might suspect its a mustard! There is also a similar-looking purple mustard in the park. In the winter the remains of the mustard turn into tumbleweeds! 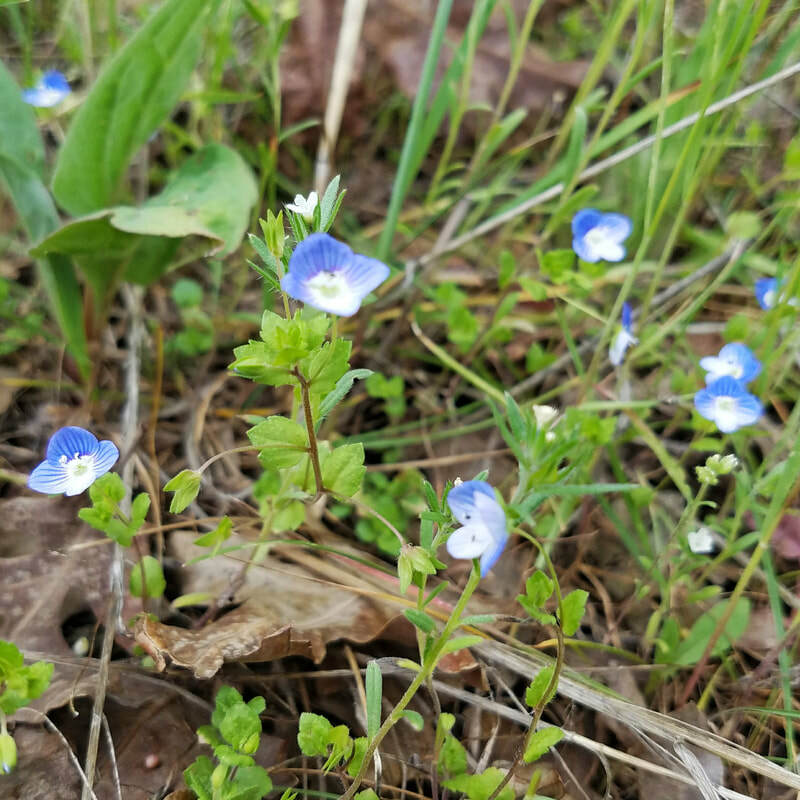 The tiny Birds-eye Speedwell also has four petals. But you have to get really close-up to see them! It is a native of Europe and Asia west of the Ural mountains. It's flowers wilt quickly when picked, which gave it the ironic name "Mannertreu" or "men's faithfulness" in German! 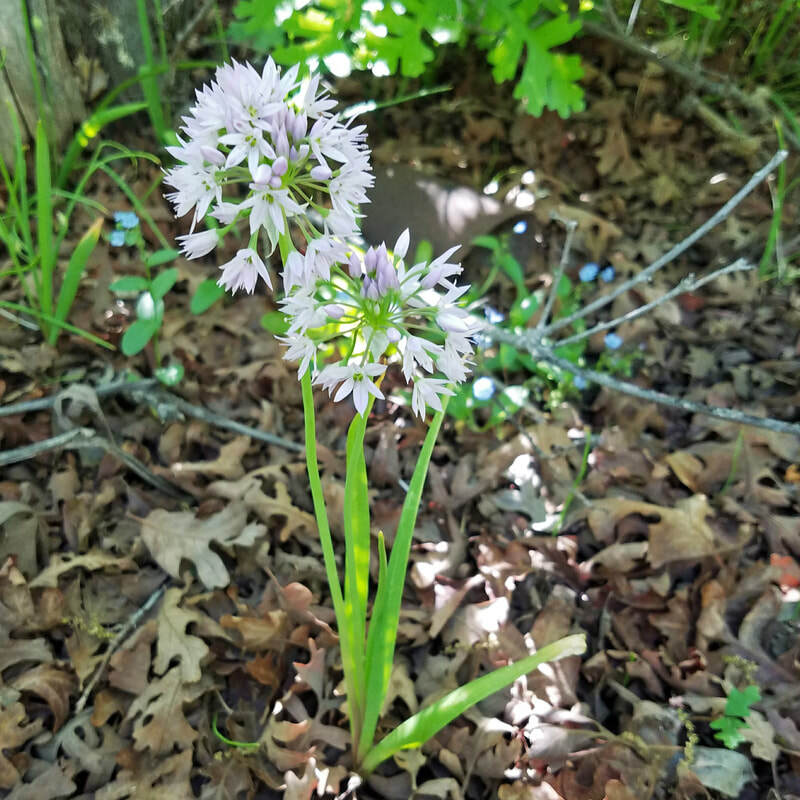 Wild Onions right here in Lambert Park! The Twincrest Onion and the Tapertip Onion are two of the many varieties of western onions, all of which are edible, though some are extremely potent and unpalatable. In the early days of the West, Indians saved at least one exploration party from scurvy by alerting the ill explorers to the curative properties of the wild onion! 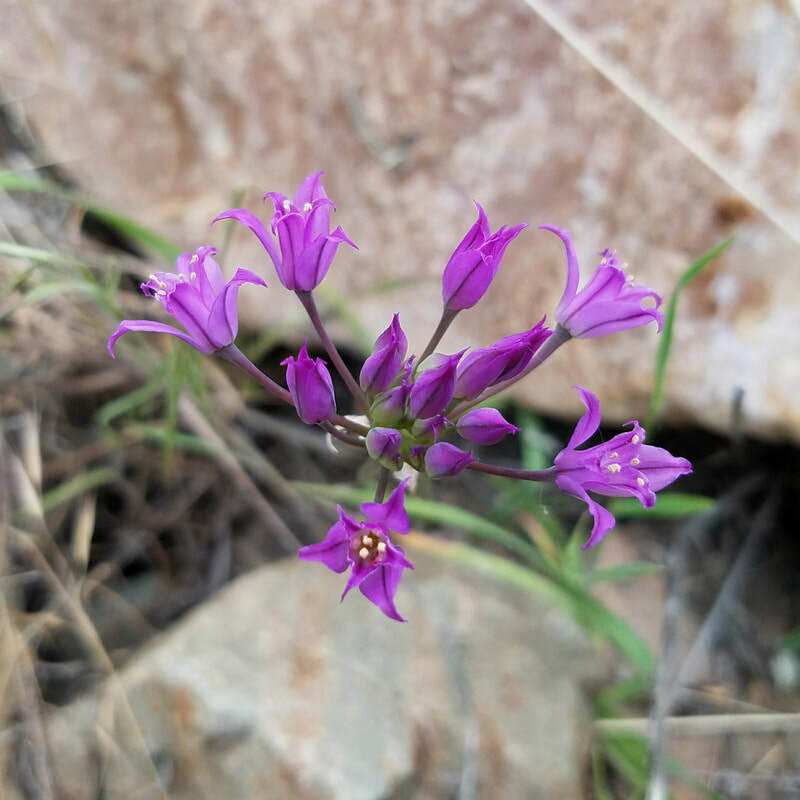 The twincrest onion is a favorite treat for black bears, elk and prairie dogs! 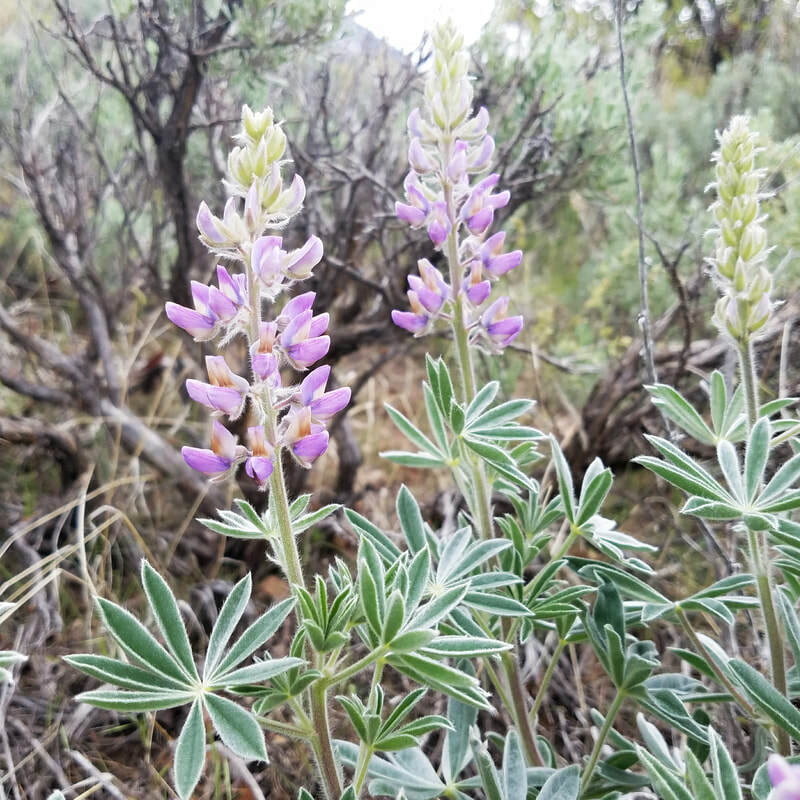 Silvery Lupine is one of the most common lupines in the Wasatch. It can be toxic to plants and animals if eaten. What it lacks in ingest-ability it makes up in beauty! It was named after the wolf (lupinus in Latin), as it was erroneously thought to degrade the soil. 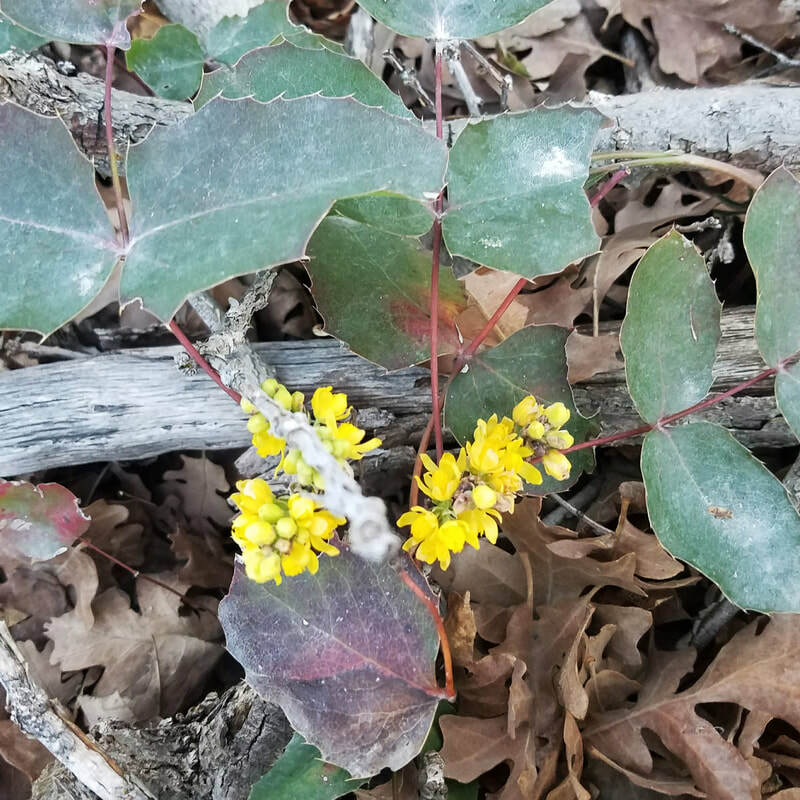 Fragrant Sumac is especially showy in the fall and shows a myriad of tiny yellow early spring flowers followed by light green leaves and then tight clusters of hairy berries with a lemonade taste. Add a few berries to your water bottle for a refreshing trail drink! Rubbing the leaves produces an aromatic pungency. 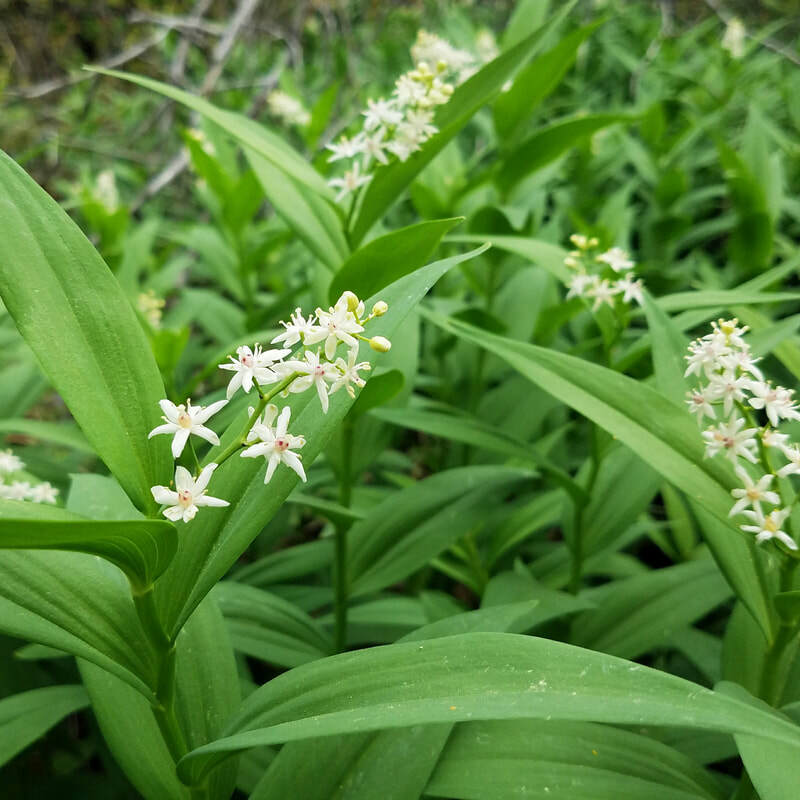 False Solomon's Seal is sometimes called Solomon's Plume. It is distinguished by tiny white flowers with gigantic leaves out of proportion to the blooms! Small Leaf Pussytoes have tightly packed flower heads resembling the paws of a cat. They are also just as soft! 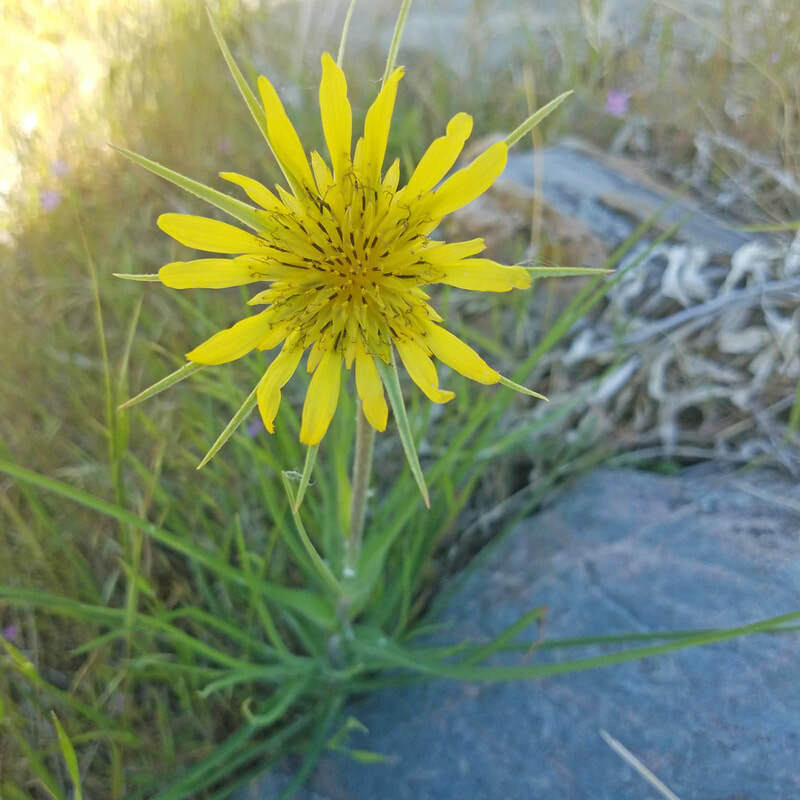 Yellow Salsify is the queen of the dandelion family, with it's green crown-like spikes around the bloom. It is often called goat's beard after it's beautiful large seed head, twice the size of the dandelion! You can make a lot of wishes on it when you blow it apart! Siberian Elm is native to Siberia and central Asia. It has been naturalized across North America, but doesn't live as long in more temperate climates. While it might live 60 years here, it can live 250 years in Siberia! There is a very fine specimen just below the water tower in Lambert Park! The Red-Twig or Western Dogwood grows especially well along river banks, as it does right here in Lambert Park at Grove Spring. 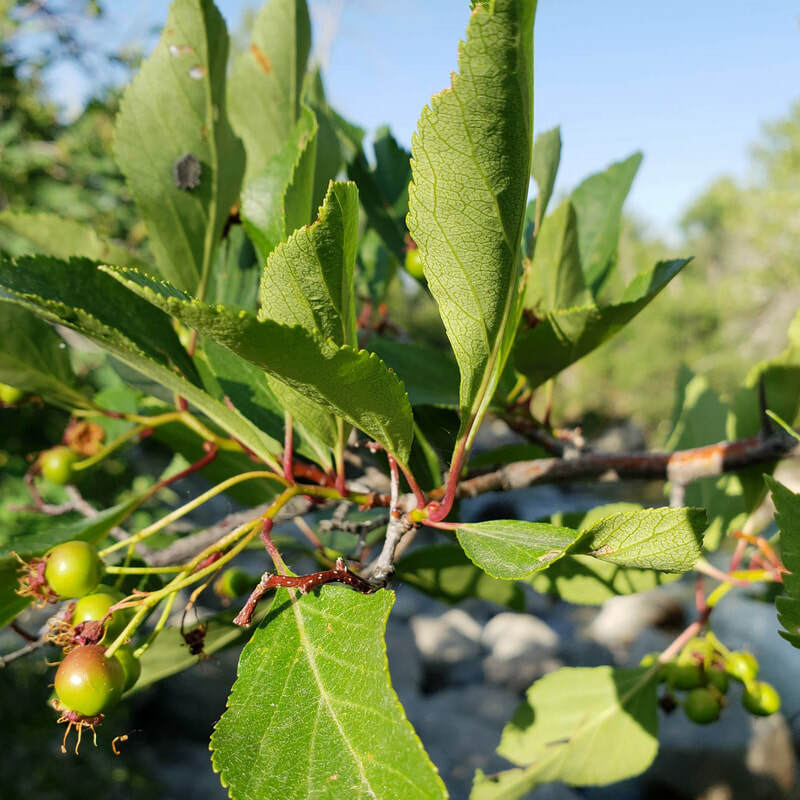 While the red twigs add color to the landscape, the clusters of white flowers and white berries also add beauty to the landscape, as well as food for wildlife! 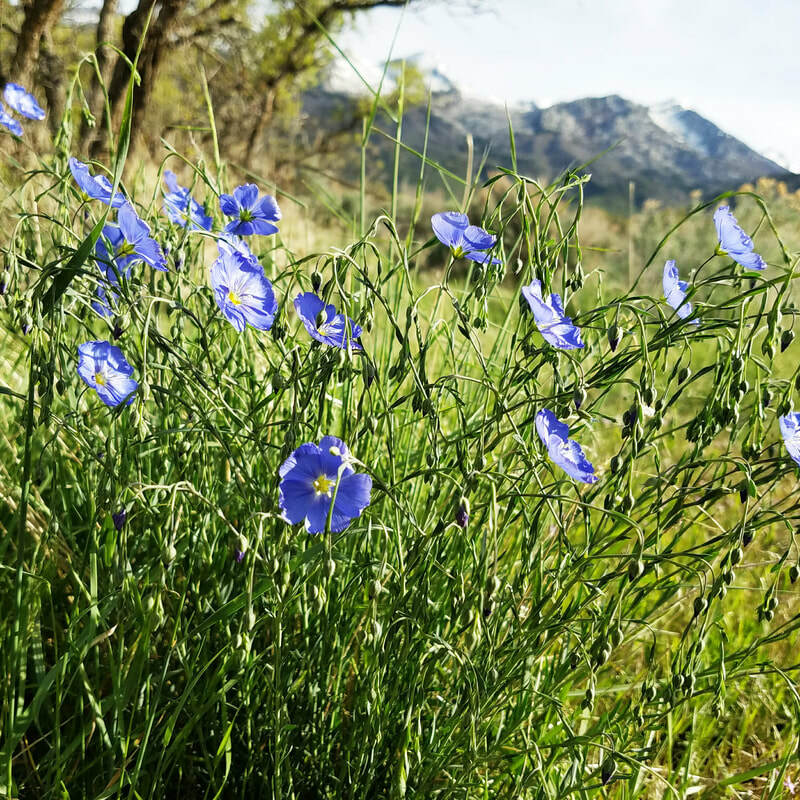 Blue flax, is a native to western North America, and adds a brilliant shade of blue to our meadows! When roasted, flax seeds have a pleasant nutty taste, and are very nutritious. However, the raw seeds contain cyanide which is destroyed during the cooking process. It is also used medicinally and has an oil similar to linseed oil! 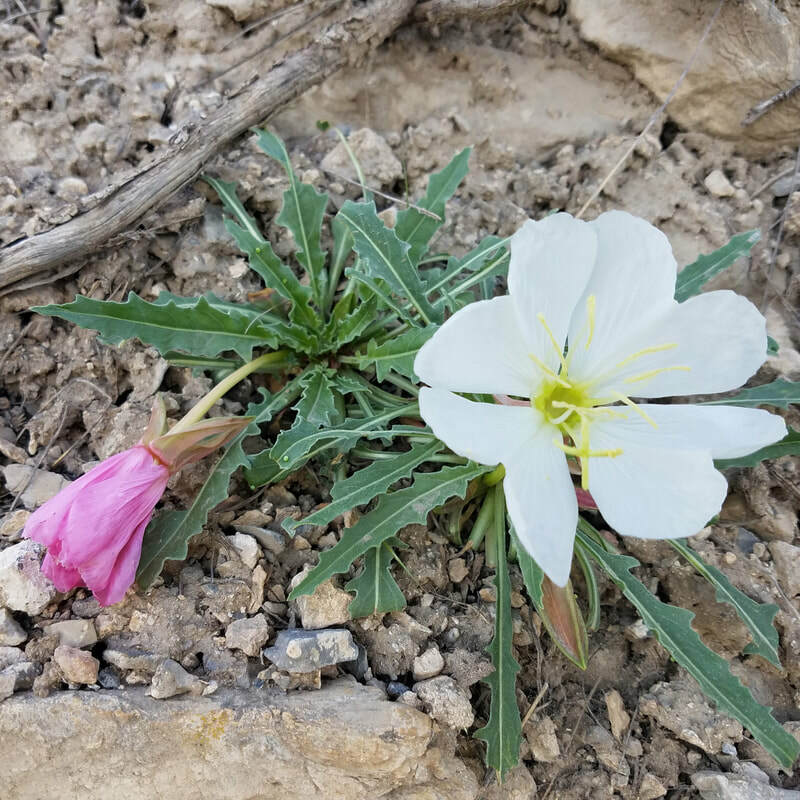 It is exciting to find a tufted evening primrose in bloom, as each blossom only lasts one day! The white flower turns pink as it dies. This pretty white flower with four heart-shaped leaves is supposed to only blossom in late afternoon or evening, as it is pollinated by night-flying insects. 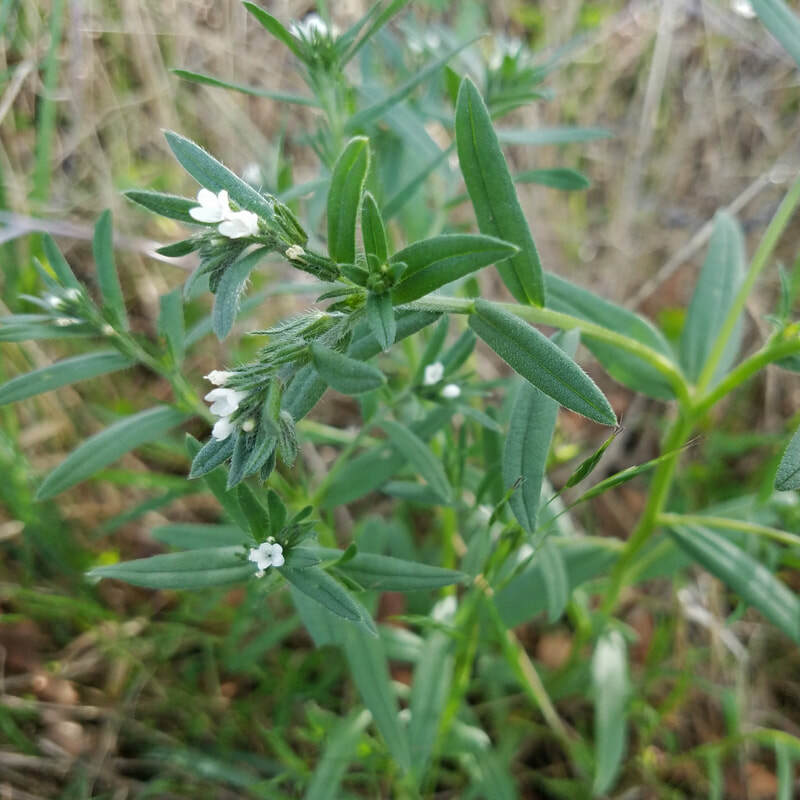 Corn gromwell, a soft and delicate little white flower has nothing to do with corn, but has recently graduated from invasive weed to a plant with healthy possibilities. Farmers in its native Scotland are growing it for its high concentration of omega 3-fatty acids! It does better than fish oils in this regard! A real boon for vegans around the world! The chokecherries are in blossom, but you'll have to wait a while for the fruit. You'll have to add a lot of sugar to the berries to offset the tartness of the jams, jellies and syrups you'll be making later this summer! 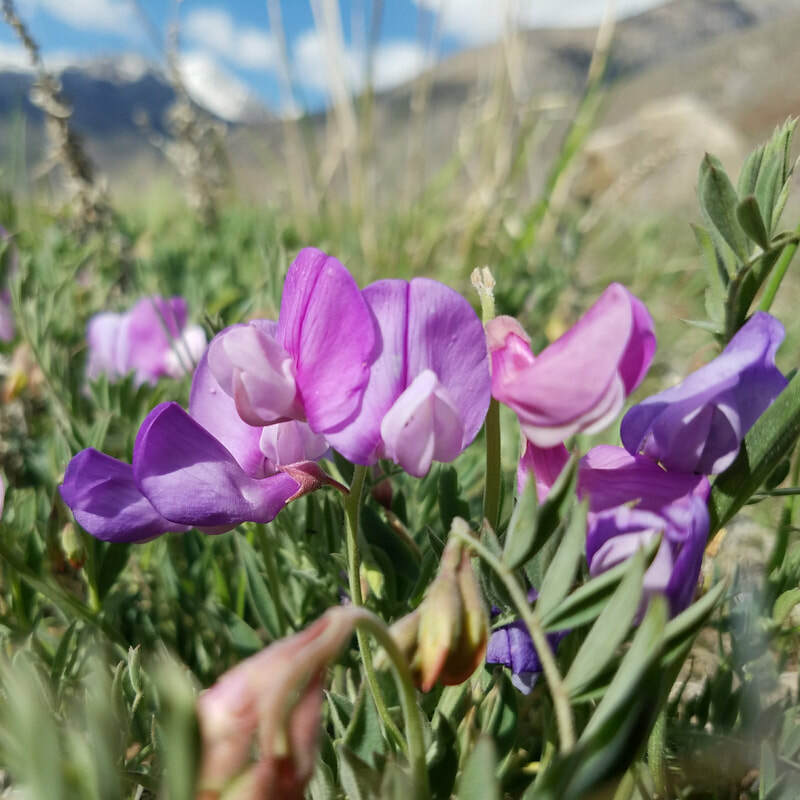 Utah Milkvetch, a native Utah plant, is also found in portions of Idaho and Nevada. It is also called Ladyslipper and Locoweed, the later for its propensity to be harmful to livestock. Some species contain significant amounts of alkaloids and/or toxic metals like selenium. Don't eat it! The Crossflower or Purple Mustard, is native to Eurasia and is considered a noxious weed in many parts of the world where it has been introduced. Although very attractive, it has a stinky smell, and when ingested by cows it causes their milk to have a bad odor and taste! Wester Waterleaf is striking, with it's dainty bottlebrush appearance. It can catch and hold water in its cavities, and can survive in a variety of habitats because of that ability. 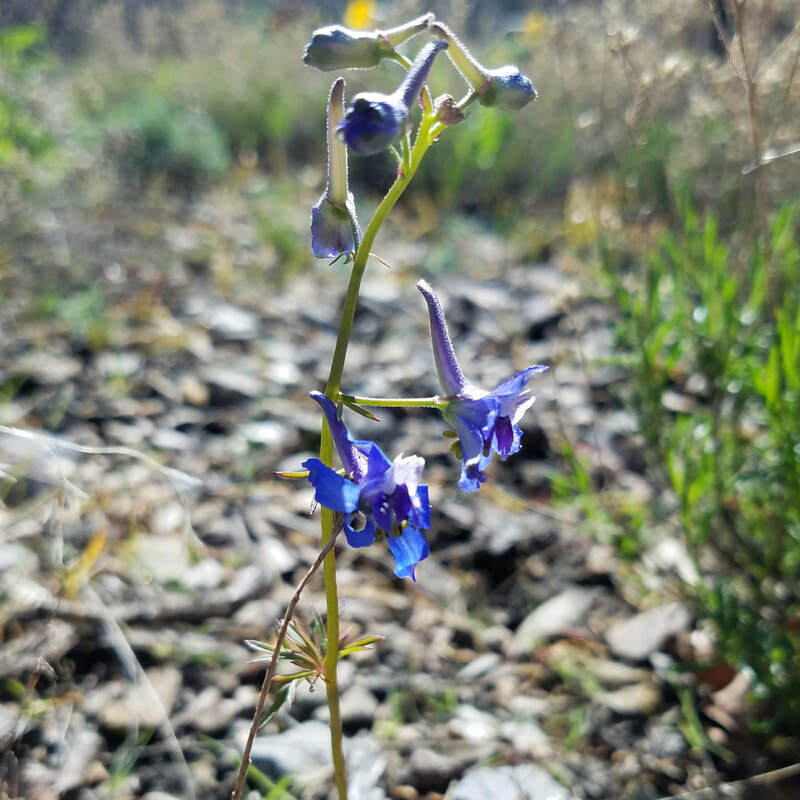 Nuttall's Larkspur is one of 60 different species of larkspur in the United States. 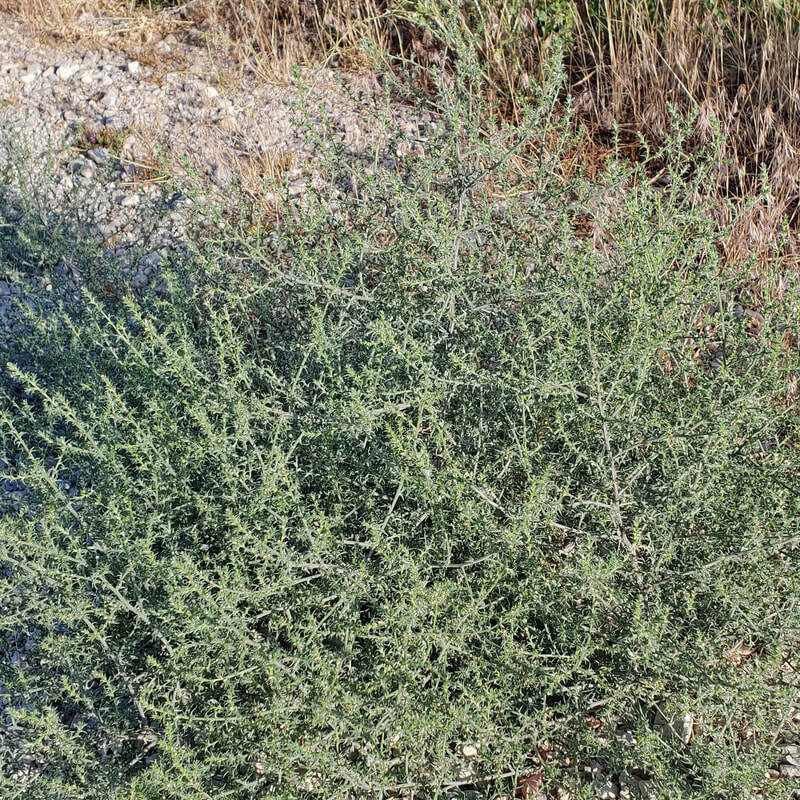 It is widely distributed across the western states, and has been used to make blue dye as well as to make a topical medicine to kill parasites. For topical use only! The plant itself is poisonous if eaten! The Golden Currant Bush is in it's glory! It's bright yellow flowers will later give way to golden, then orange, then red, very tasty berries! Its scalloped leaves change to deep maroon in the fall. Danger, Danger! 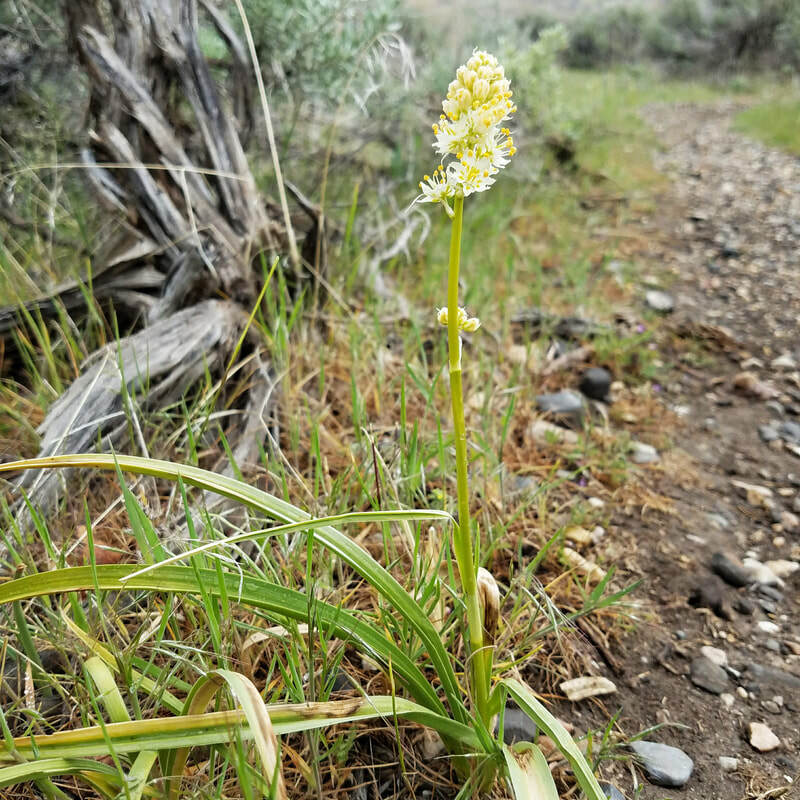 The native Death Camas is in bloom! Don't even think about eating a plant with the word 'death' in its name! Every part of the plant, from the bulbs to the stems, to the leaves and flowers is poisonous to humans as well as livestock! Just look at it and enjoy! 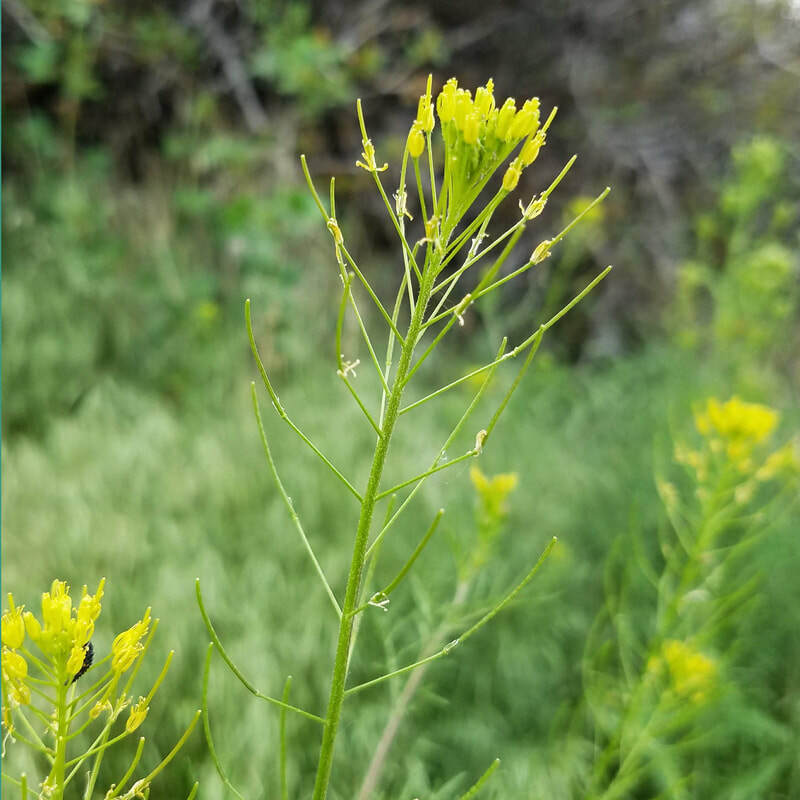 A weedy mustard from Europe, the Shepherd's Purse now occurs in almost every county of every state in the United States! The brown, dry-looking seed pods seen in the right side of this plant are somewhat heart or purse shaped, hence the name of the plant! It's back! Myrtle Spurge is populating Lambert Park, in larger numbers every year, despite our best attempts to purge it from the landscape. 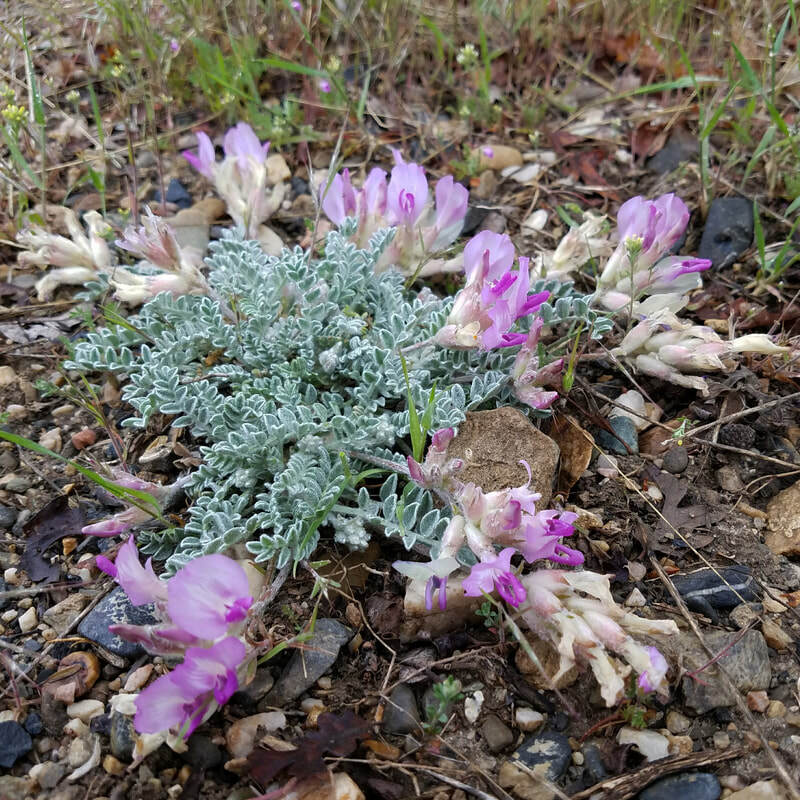 This escaped ornamental from southeastern Europe and Asia is a hearty succulent that pushes out native plants. Its milky sap is extremely irritating to human skin and eyes. If you purge it from your garden be sure to use thick gloves! Western stoneseed is native to the Canada and the western United States. 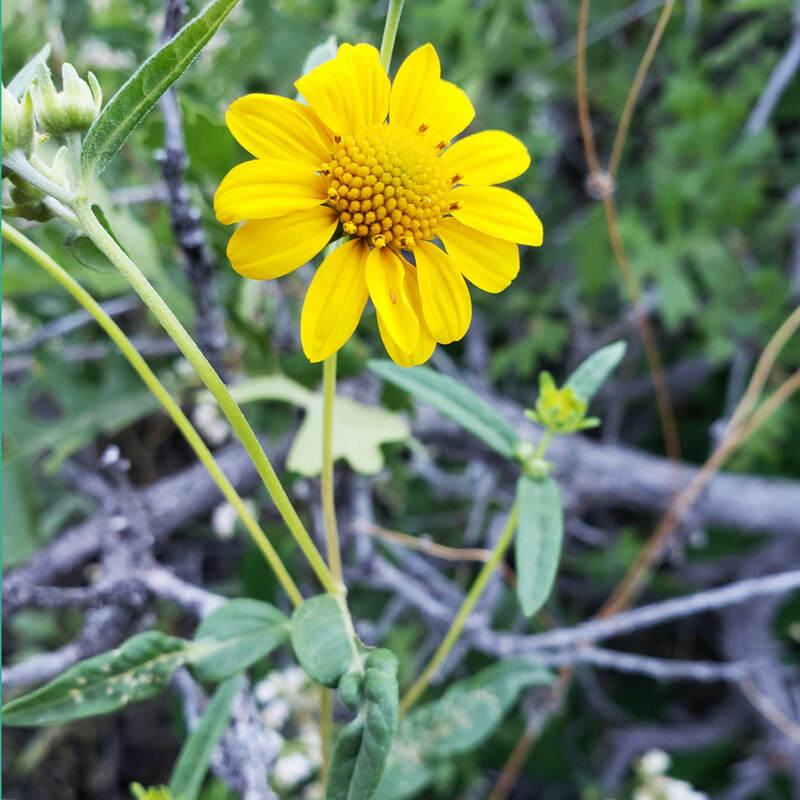 The Navajo, Dakota and Shoshone tribes used tea made from the roots of this flower as a method of birth control. 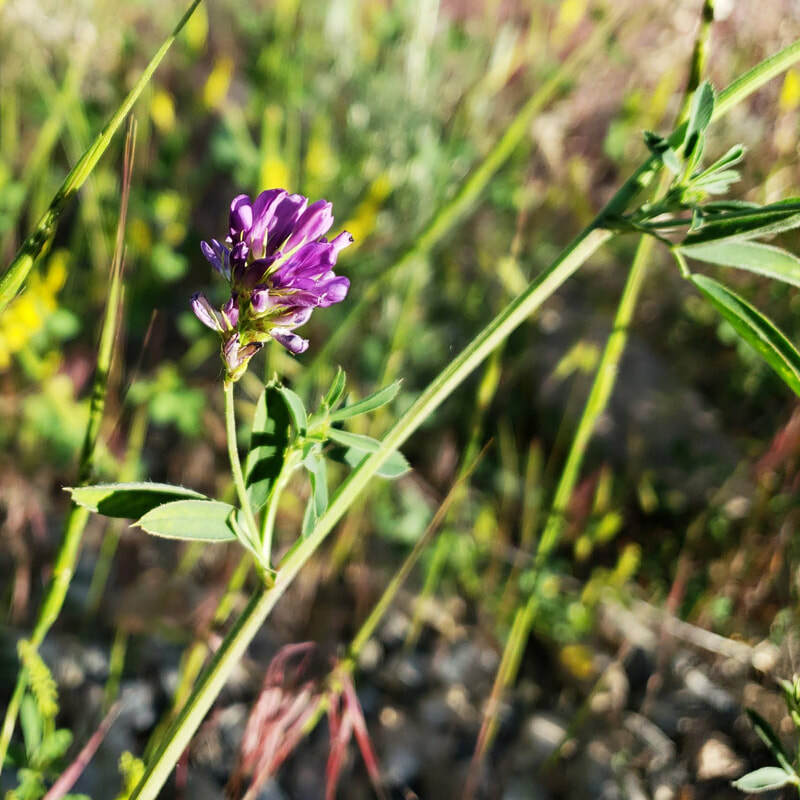 ​The Bush Pea is a beautiful purple flower, but don't let your livestock eat it! Many members of the Lathyrus family are toxic to animals, especially horses! 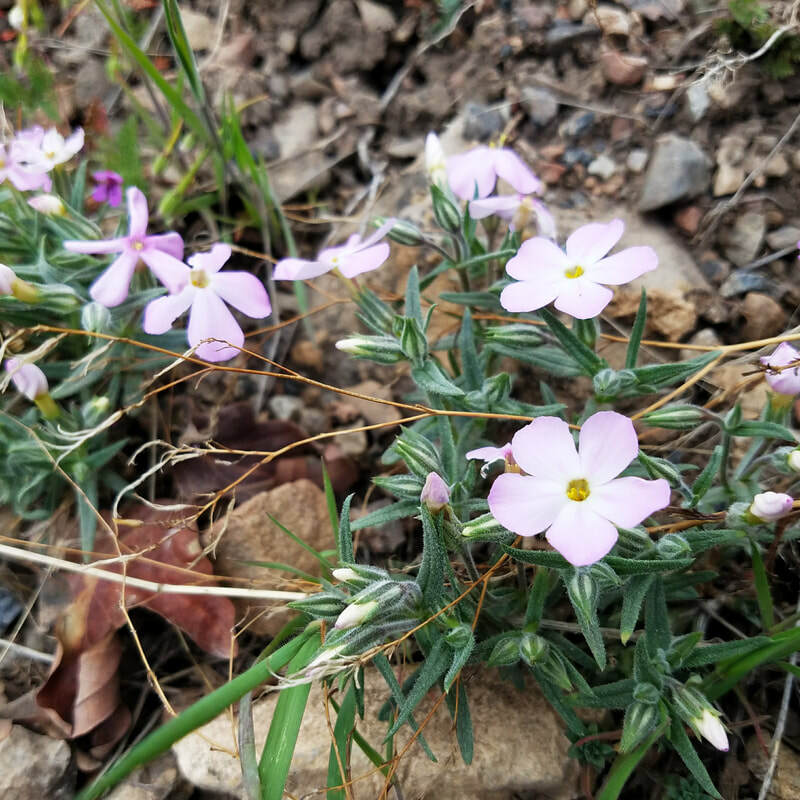 Long-leaf phlox is native to central and western America. It does well in dry, sandy soils. It's hard to classify by color, as it varies from white to pink to purple. Spring is bustin' out all over! Five new yellow flowers and one red one! 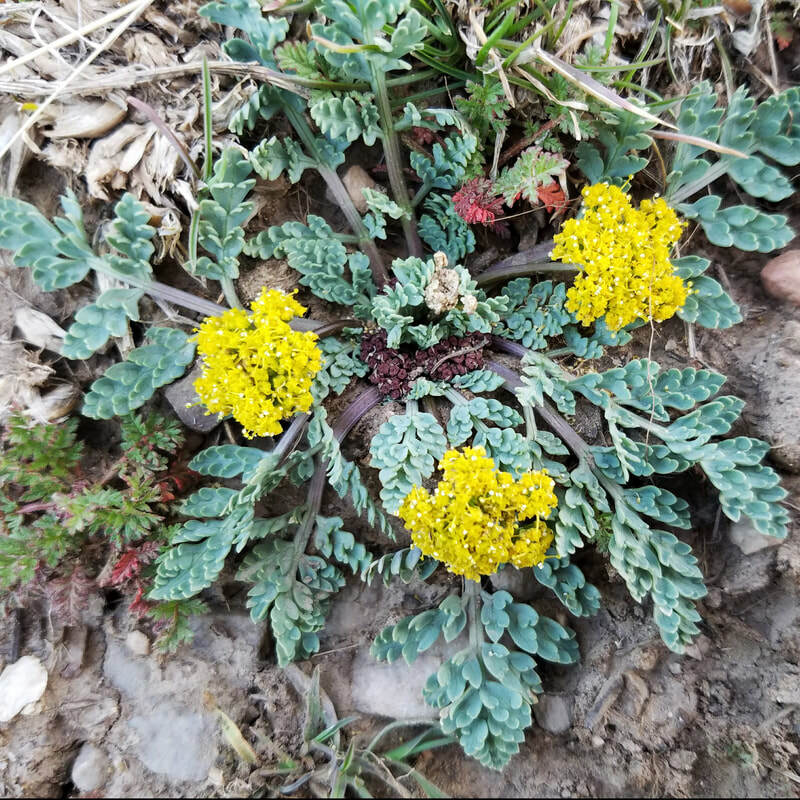 Great basin desert parsley has several common names--great basin biscuitroot, umbrella-parsley. 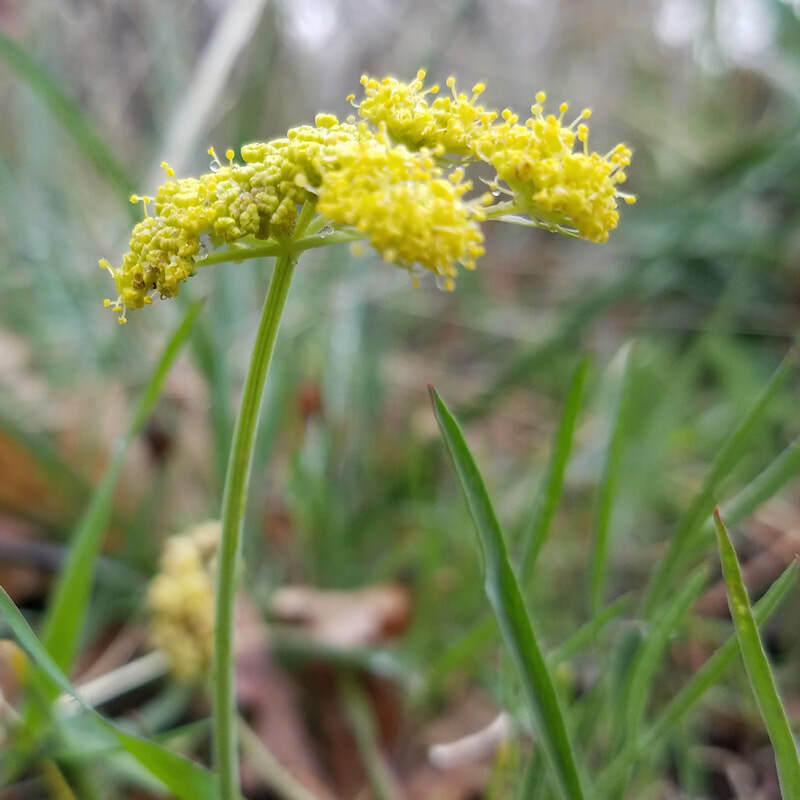 Whatever you call it, lomatium simplex, is a pretty little flower, native to the west! Curveseed butterwort is an invader from Eurasia. Like other members of the buttercup family, it is poisonous. In addition to a pretty star-shaped flower, it grows clusters of hard, spine fruits (burs). 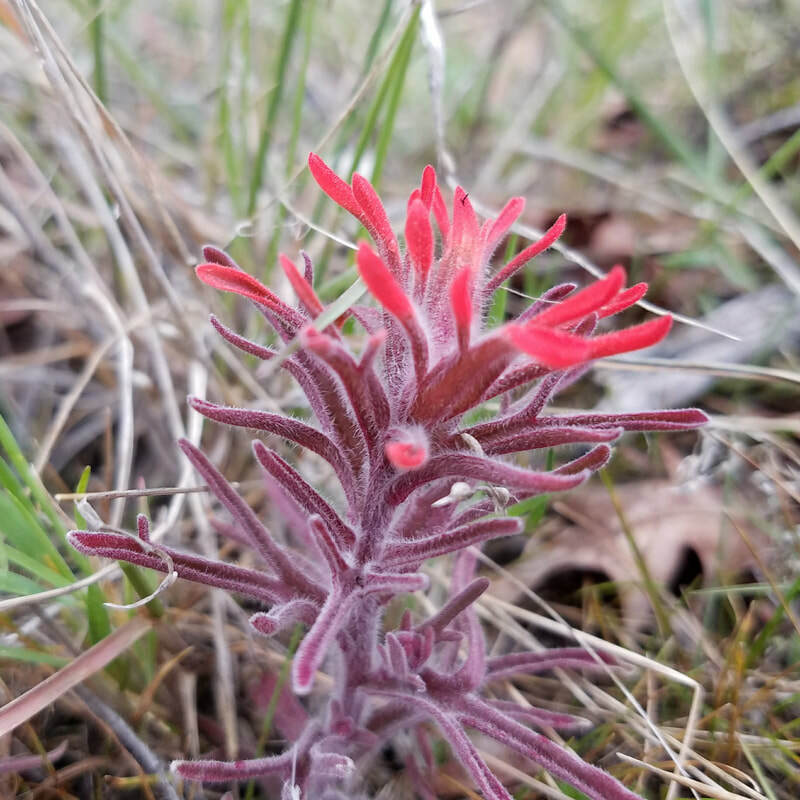 The desert Indian paintbrush is a deceptive plant. It's leafy red bracts are not the flowers, but rather they surround a greenish white flower at the very tip. They are very pretty parasites! The roots drill into the roots of surrounding plants, stealing their resources! 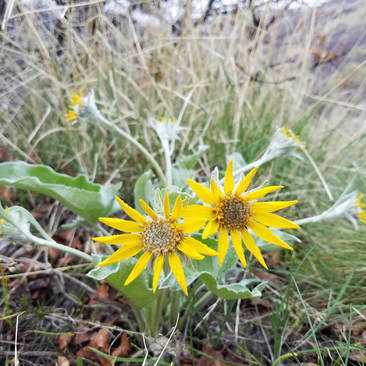 Arrowleaf Balsamroot is a hearty plant that was used by native American tribes for food and medicine. It is bitter and pine-tasting. Today we can enjoy it chiefly for it's vibrant spring colors! 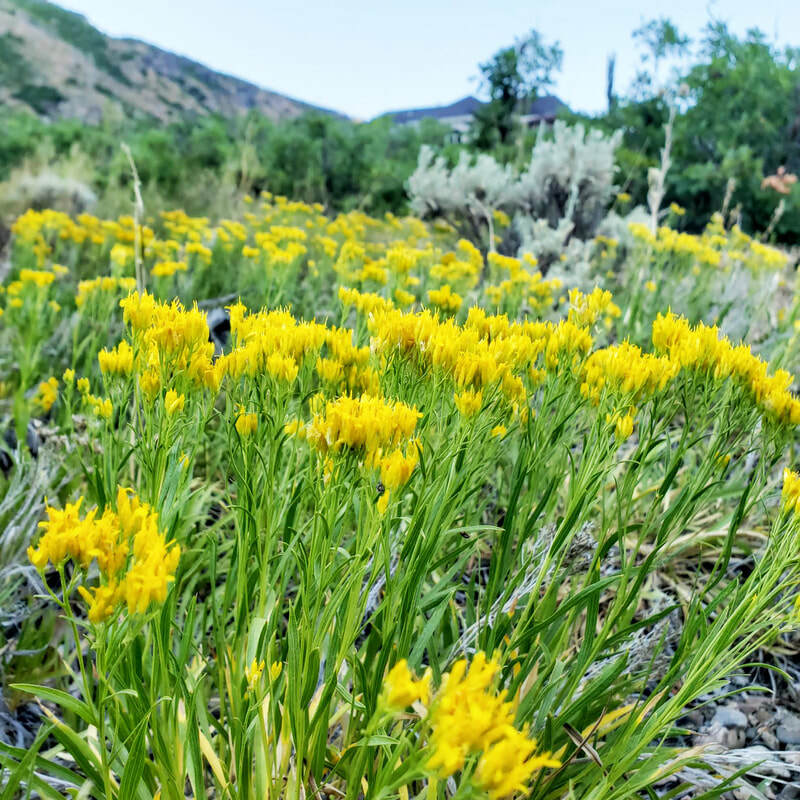 Lambstongue ragwort was used by settlers and ranchers to determine range “readiness.” When it was in flower, the range was believed to be sufficiently developed for grazing to begin. Lambert Park is fast becoming range ready! 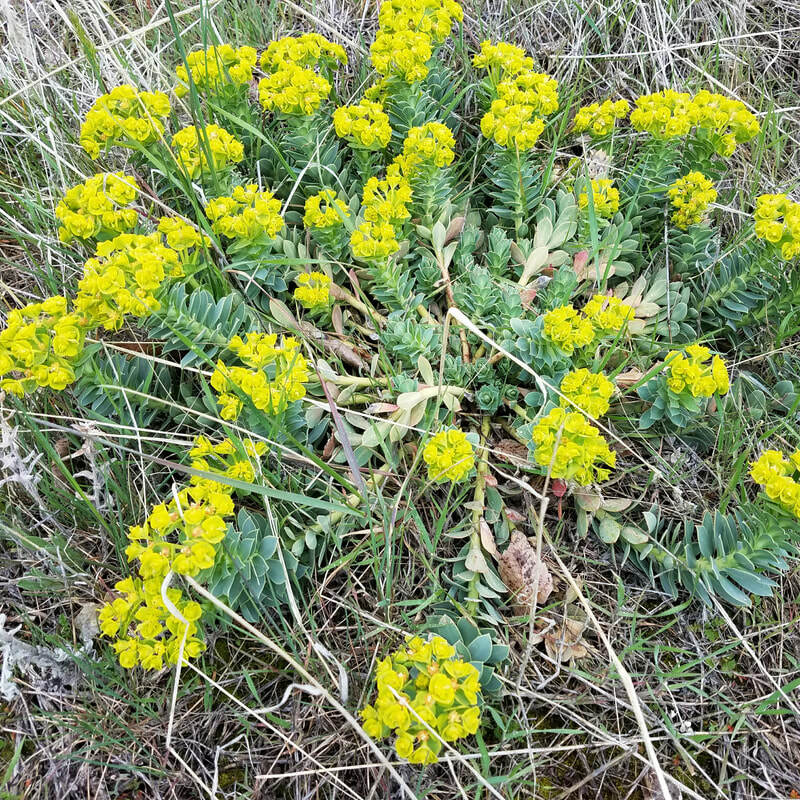 We'd rather not celebrate the blooming of the dreaded myrtle spurge, as it is one plant we would like to completely eradicate from Lambert Park! This succulent, brought over as an ornamental plant from Southeastern Europe and Asia Minor, is extremely drought resistant and thrives in the west. It pushes out native plants and its milky sap is a dangerous irritant to human skin and eyes! Purge it from your yards, but use gloves and plastic bags! 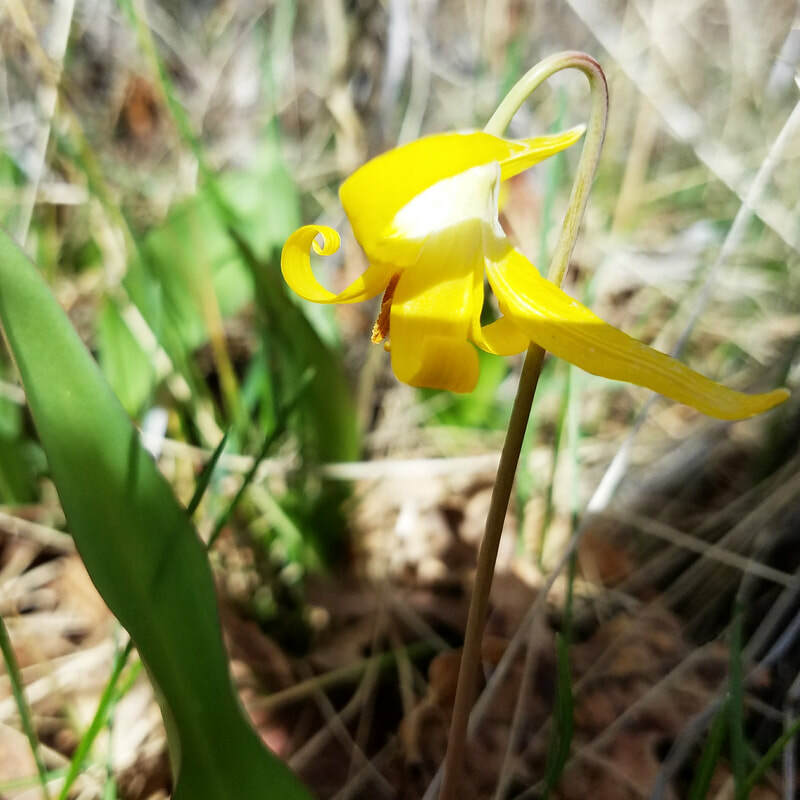 The glacier lily, or yellow avalanche lily is a delicate, but hearty spring flower. It often blooms in the snow. The bulbs of the glacier lily are a preferred food for bears. The mule deer also like the folliage. There is a lovely patch of glacier lilies at the intersection of the Rodeo Up and Spring trails. 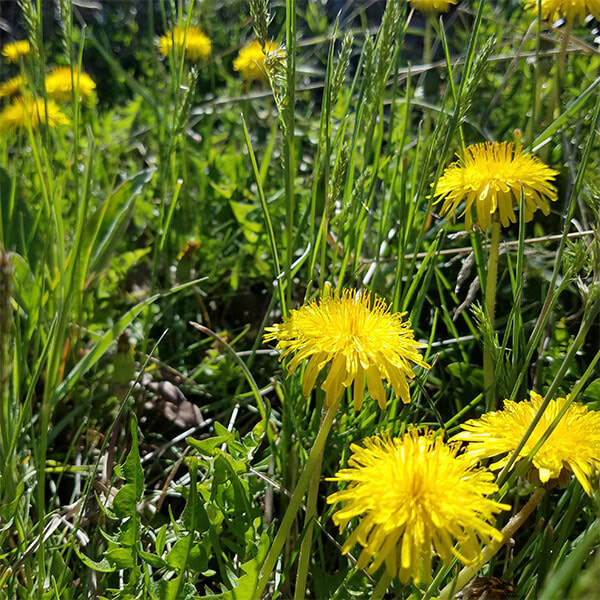 And, of course, our annual favorite, the dandelion, is starting to bloom again in the park (and also probably in your yard). A native of Eurasia, the dandelion has been in North American since the early 17th century when the colonists brought it over for medicine and food. 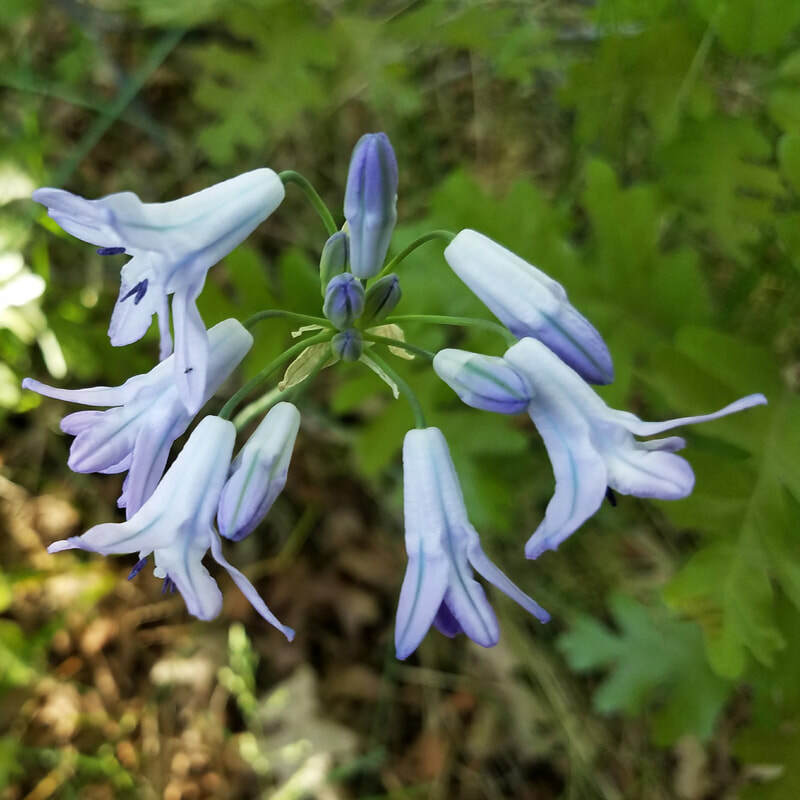 The shortstyle bluebell is a wonderful bright blue flower unique to the western states, specifically Utah,but also parts of Colorado, Wyoming, Idaho and Nevada. You can find it on Rodeo Up, Spring, and the northern end of High Bench trails. Oregon grape originated in the northwest and is the state flower of Oregon. 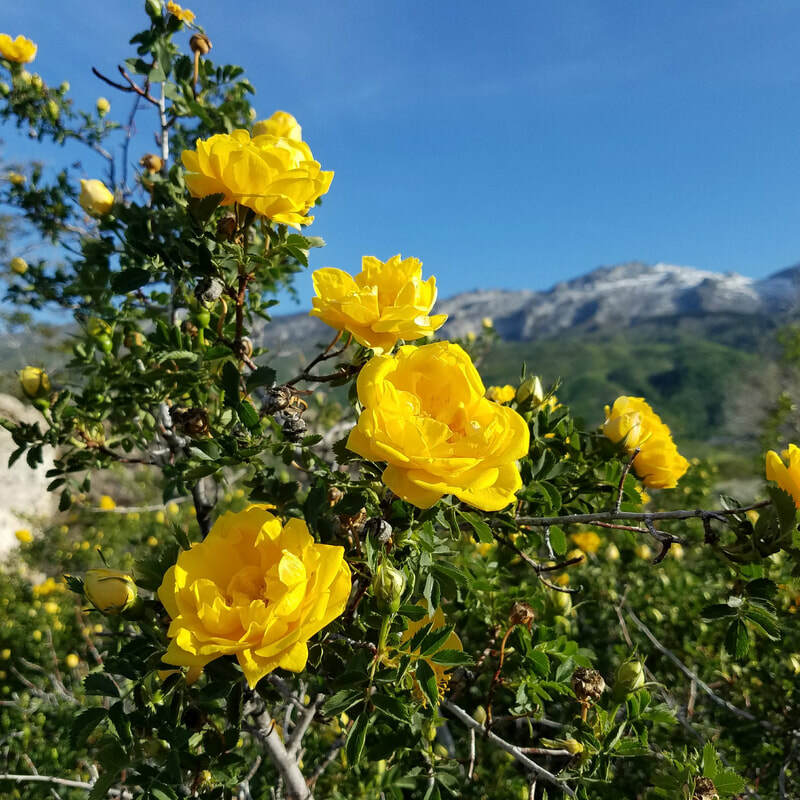 We're glad it made all the way to Utah, as it's waxy holly-shaped leaves, and bright yellow flowers add a lushness to our landscape. Find it on Spring and Rodeo Up paths in Lambert Park. 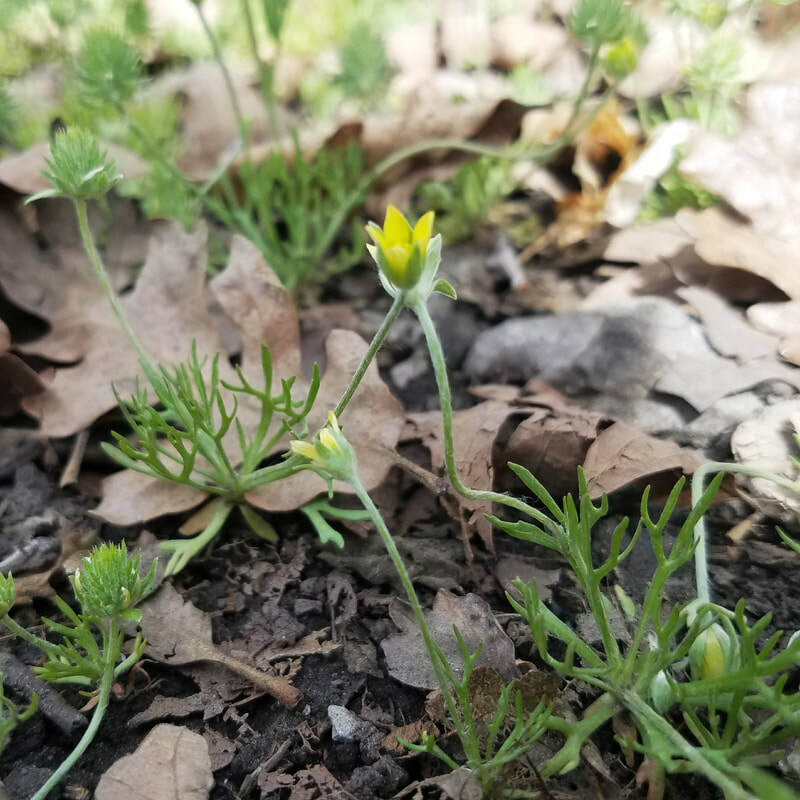 The first flowers of the season are up in Lambert Park! They are small, so you have to pay attention when you're looking for them. The early flowers are often low to the ground where they thrive because of the heat from the ground. 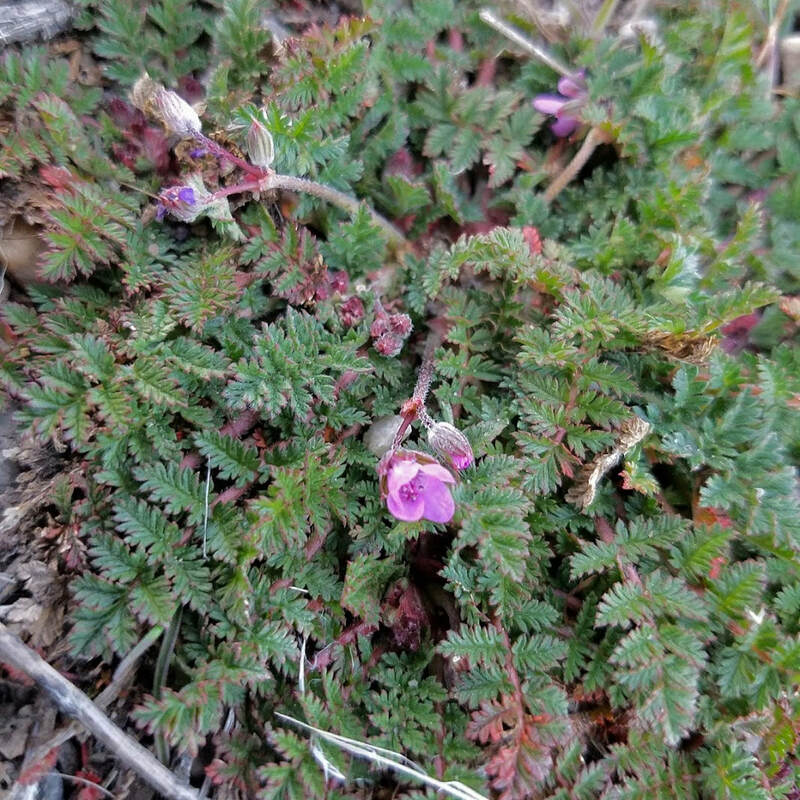 The Redstem Filaree, also called Stork's Bill is originally from the Mediterranean, but was already widely distributed in the west when it was observed by John C. Fremont in 1844. 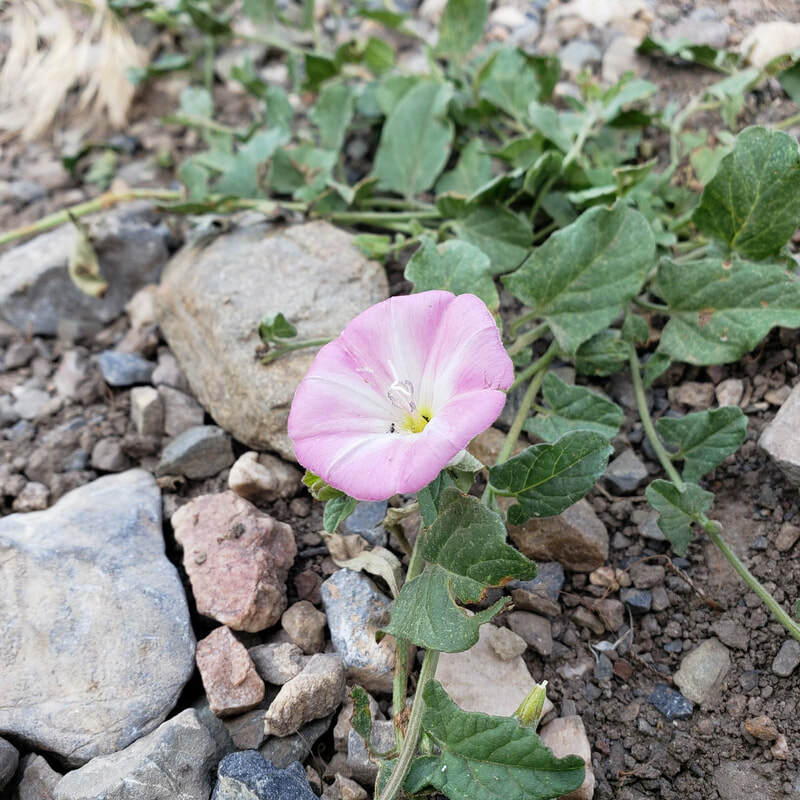 Although it can be an aggressive invader of open areas, it can also serve as good spring forage for cattle, sheep, desert tortoise, and other wildlife. 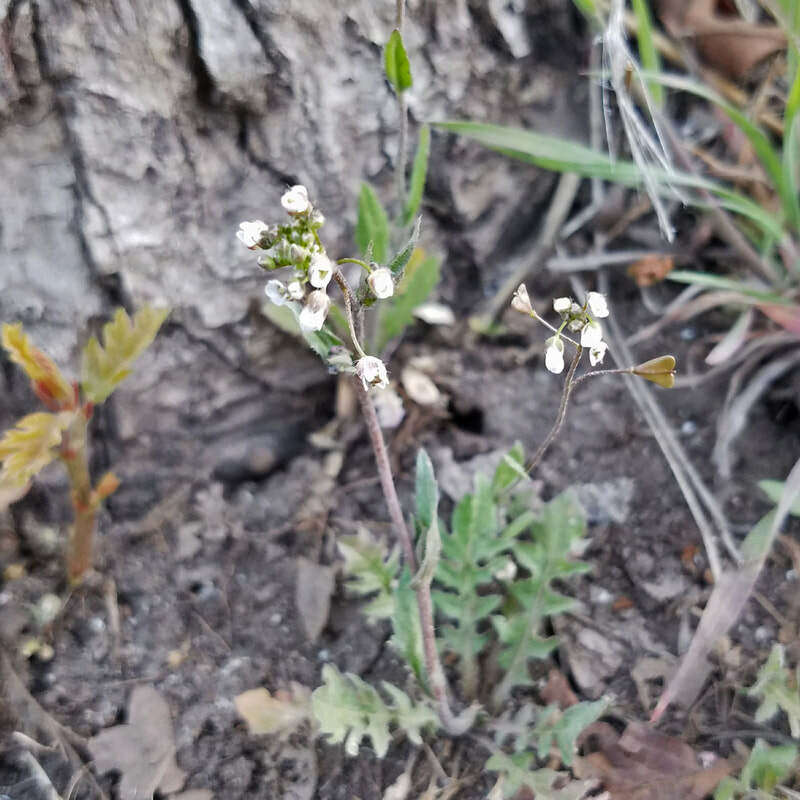 The Longstalk Springparsley is a native of the American west and can be found in Wyoming, Idaho and Utah. It is especially common in north-central Utah. To see what was in bloom in 2017 by date, click here!